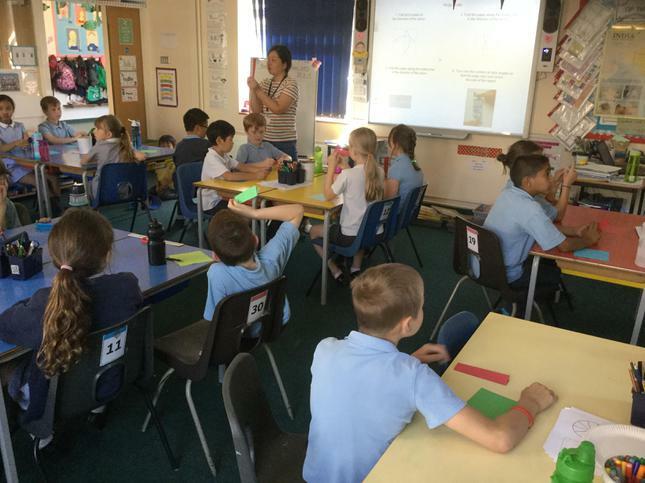 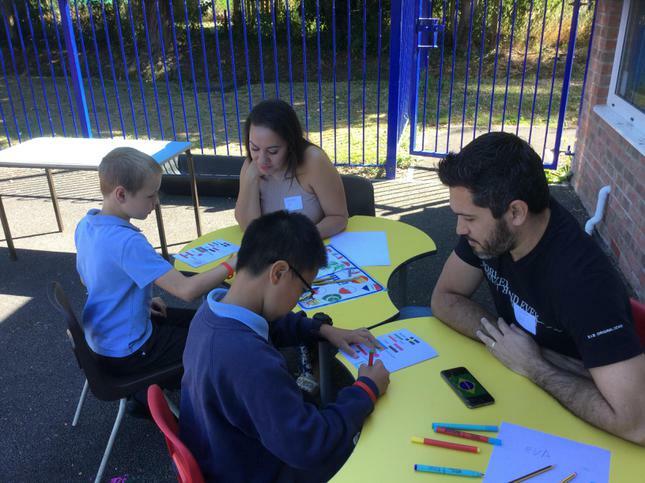 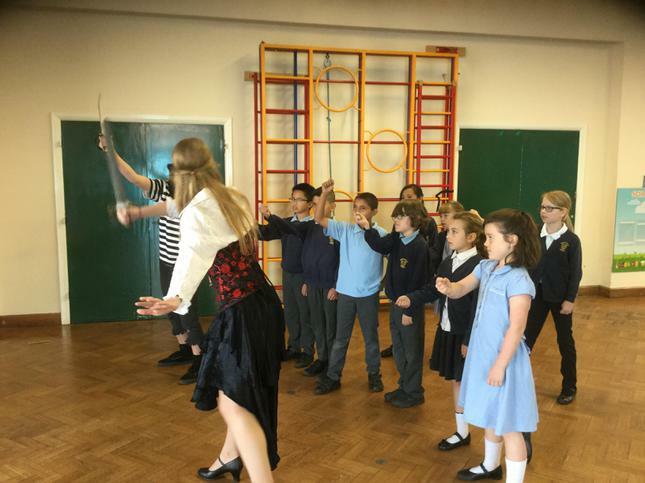 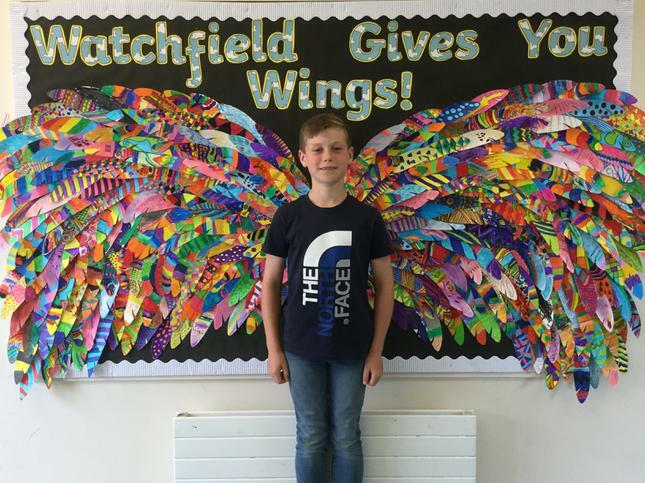 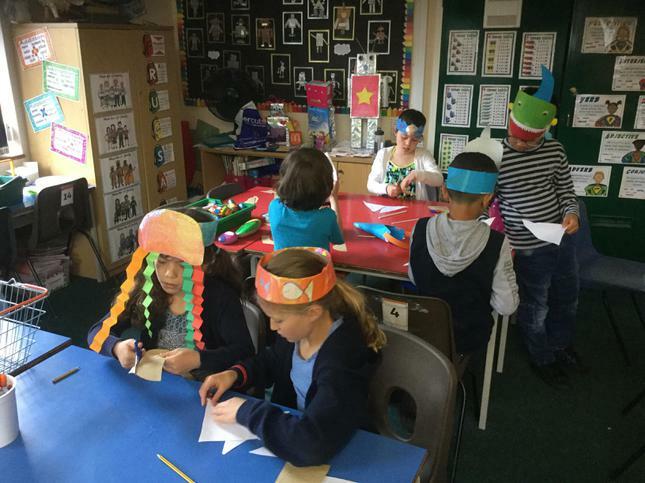 Owls Class, you have all been amazing! 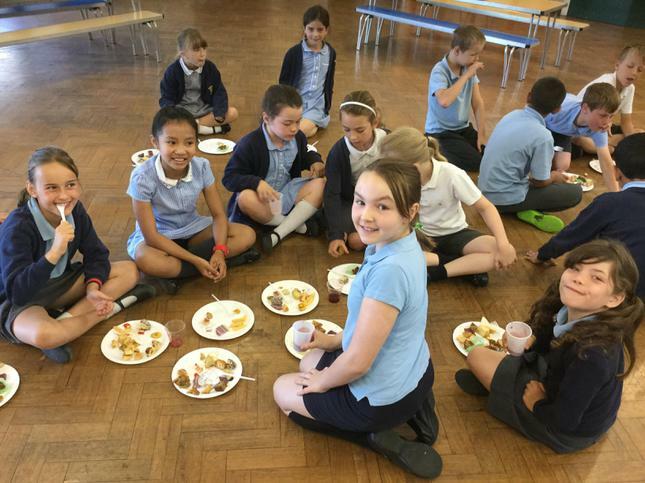 Well done for all you have achieved and thank you for a super year! 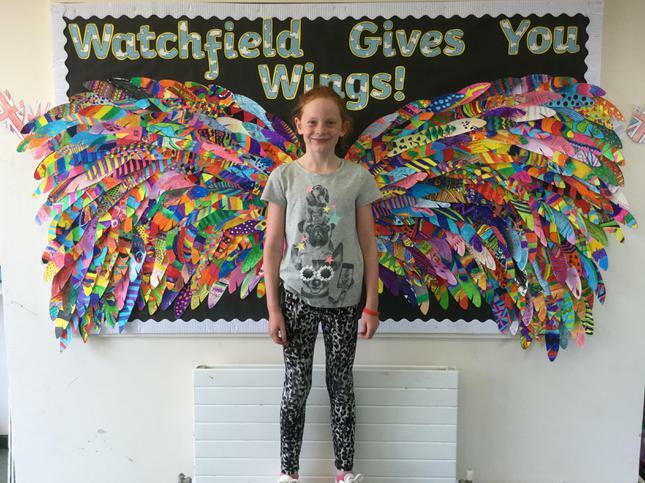 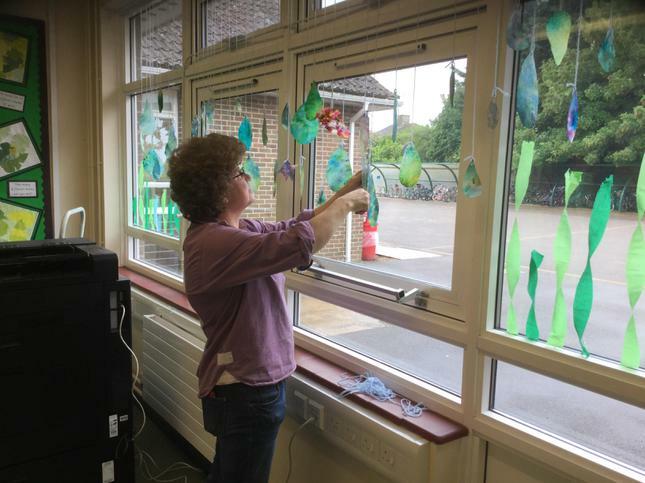 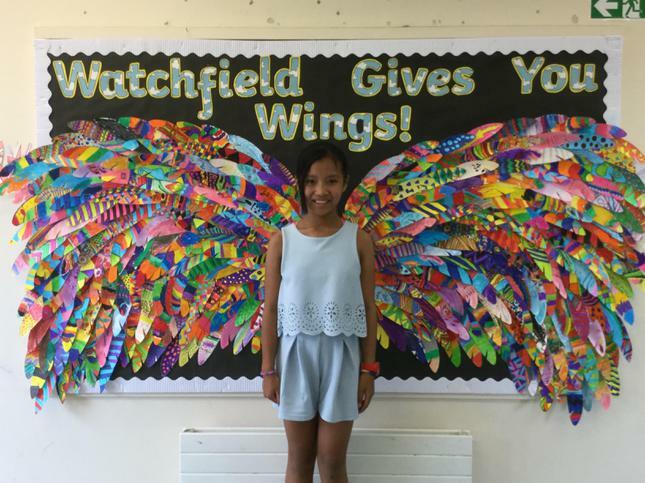 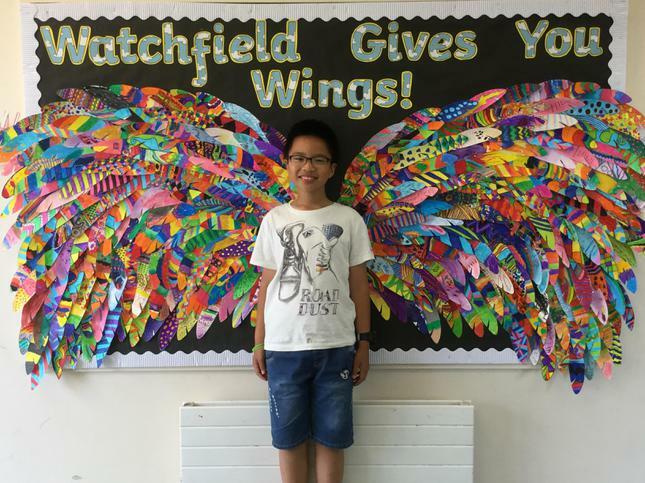 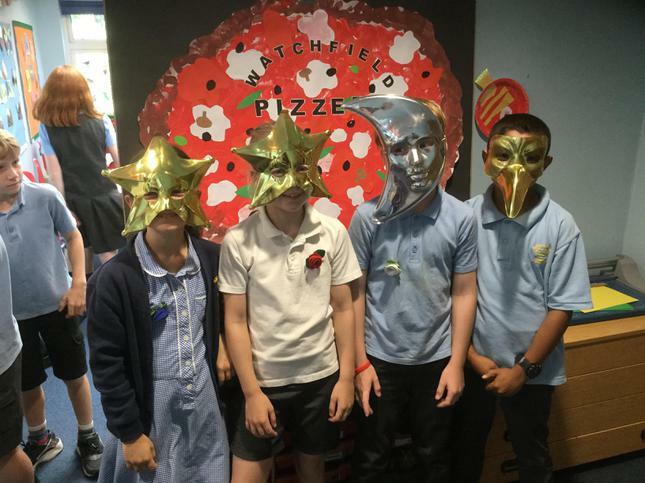 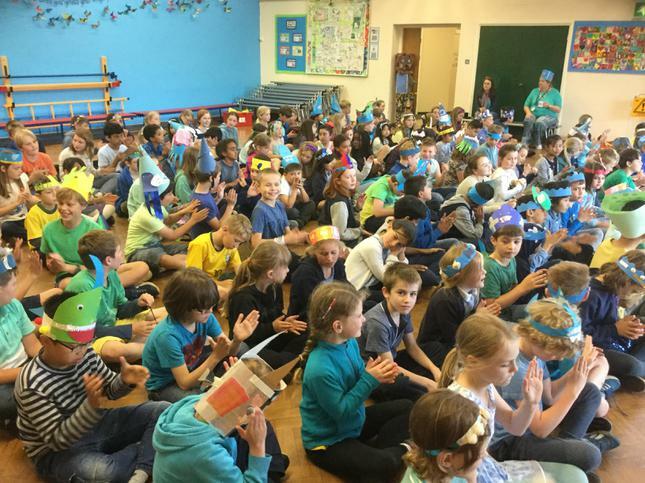 Good bye and good luck to each and every one of you - we hope you enjoy a fun-filled Summer! 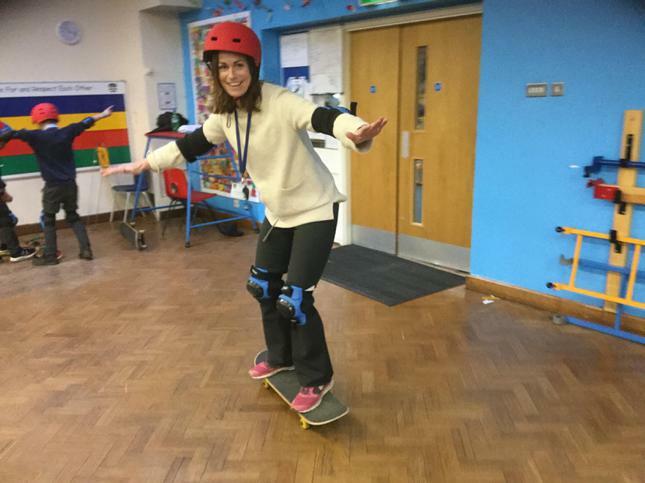 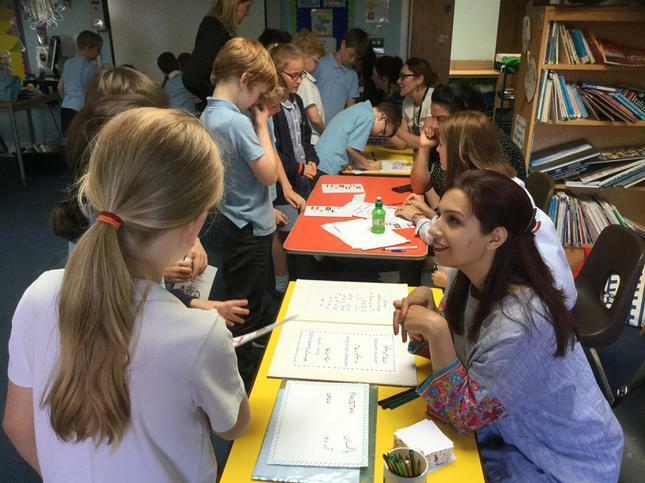 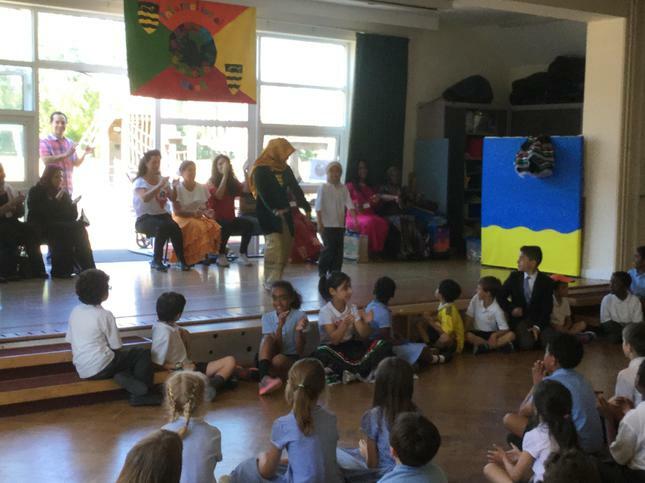 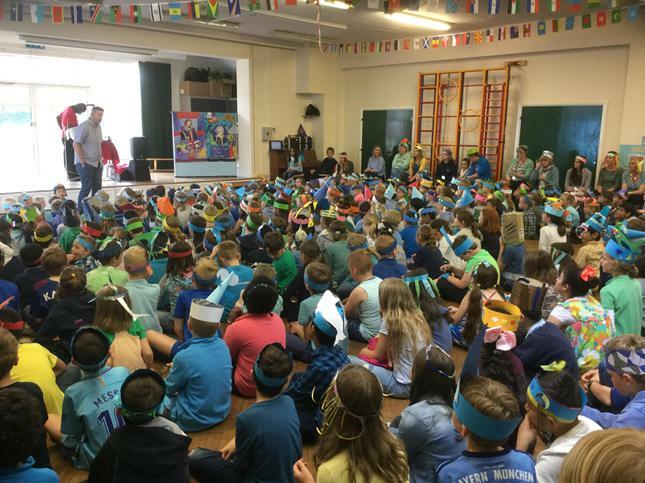 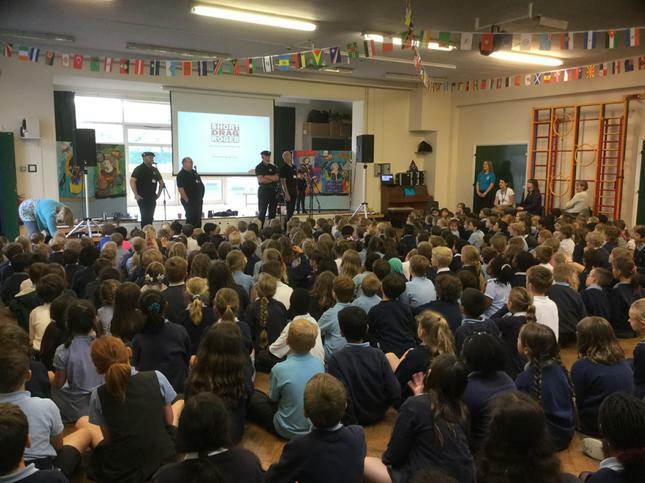 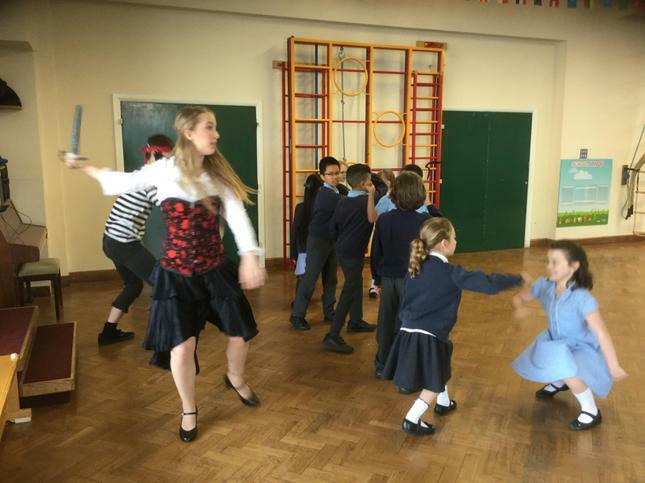 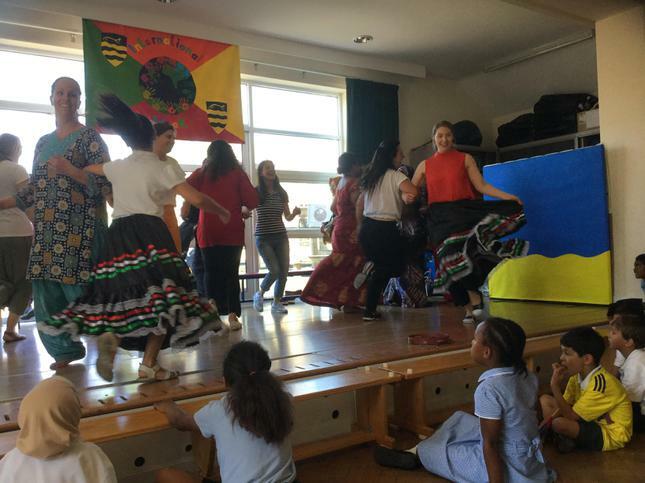 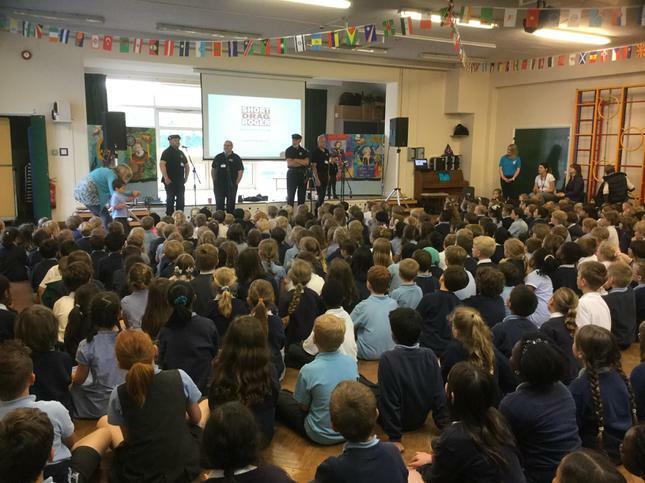 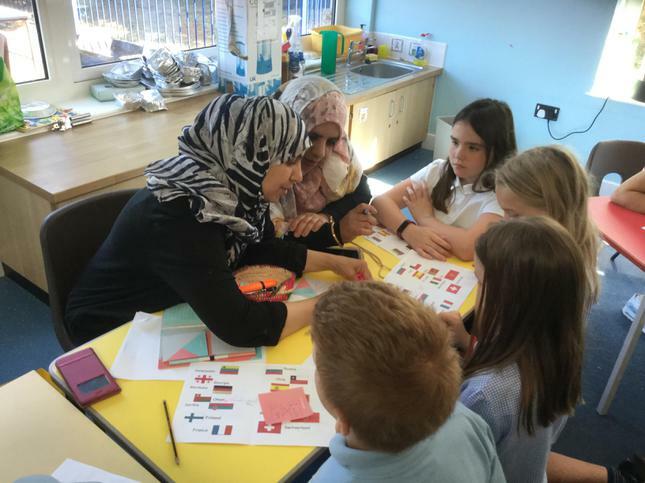 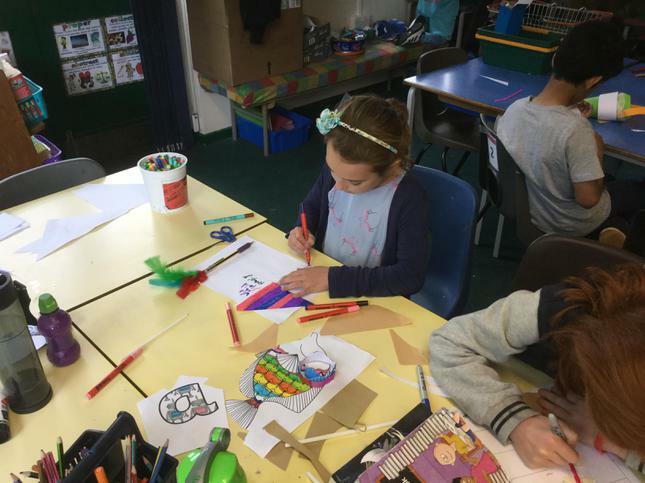 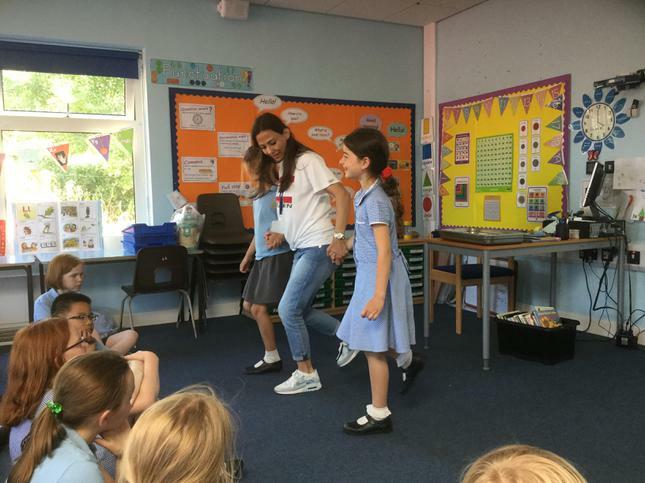 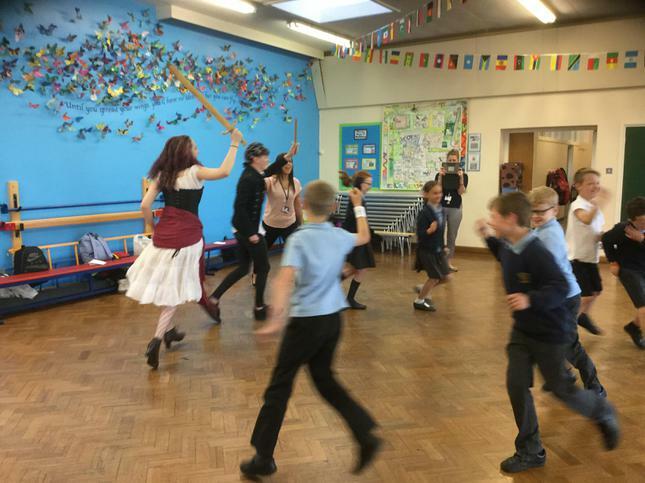 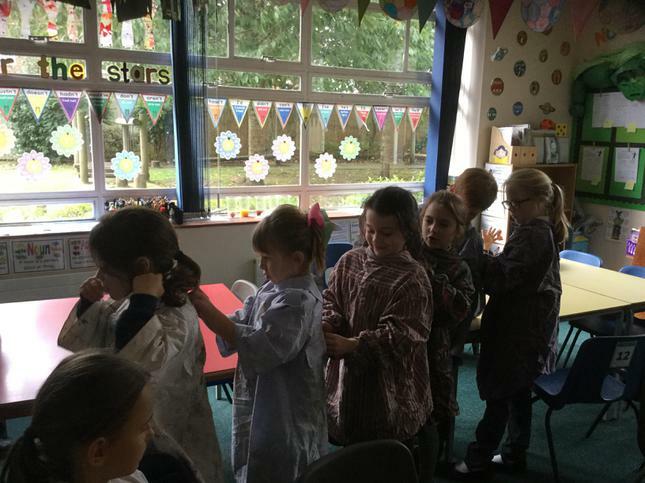 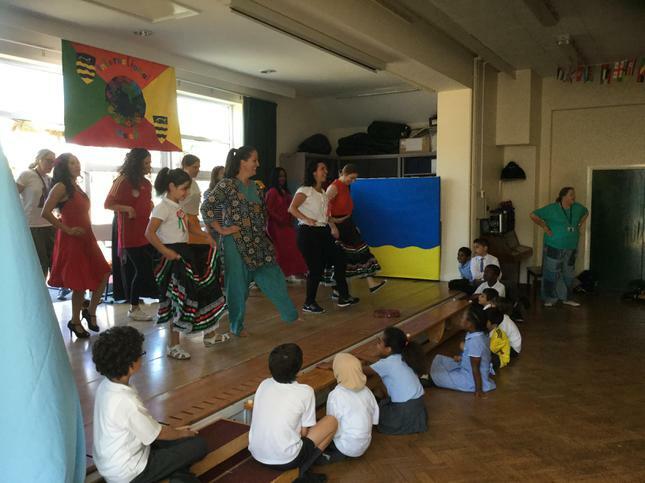 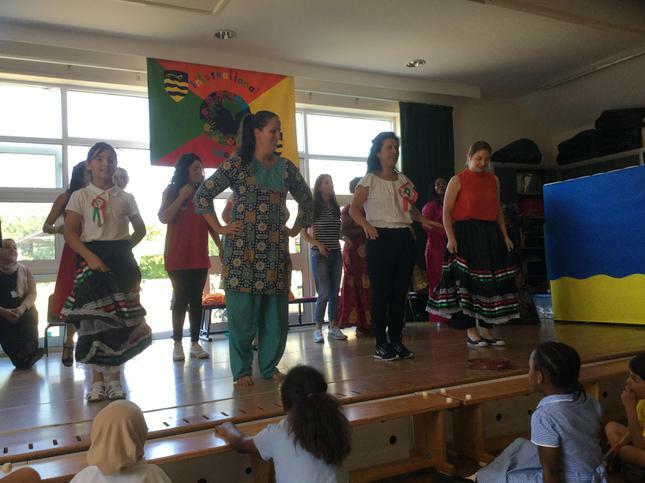 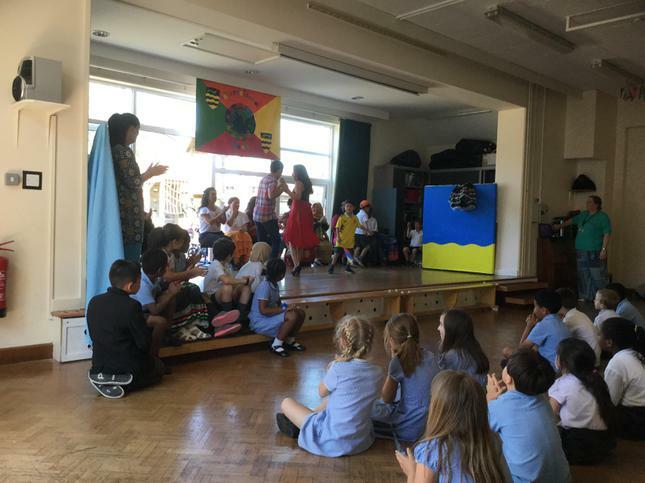 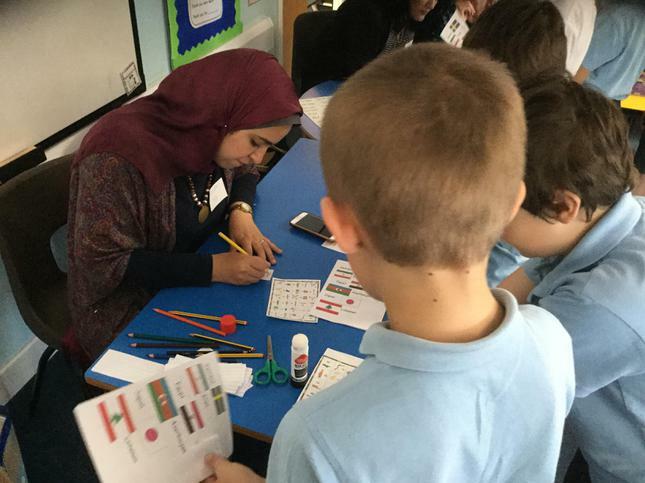 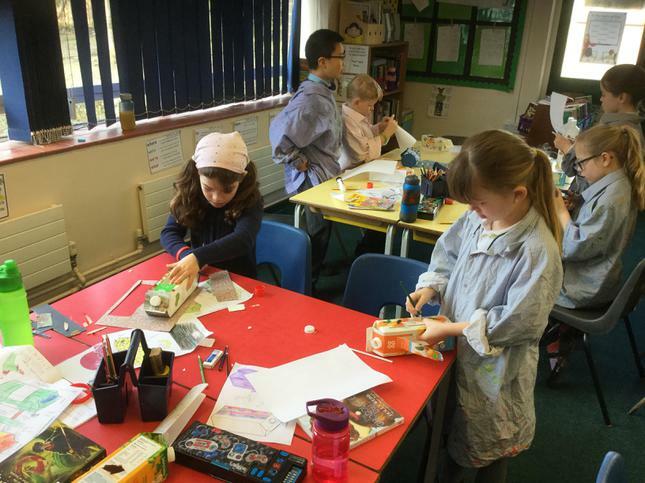 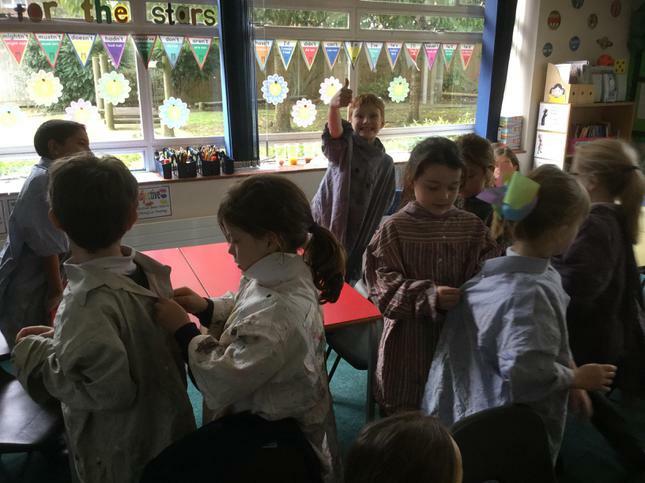 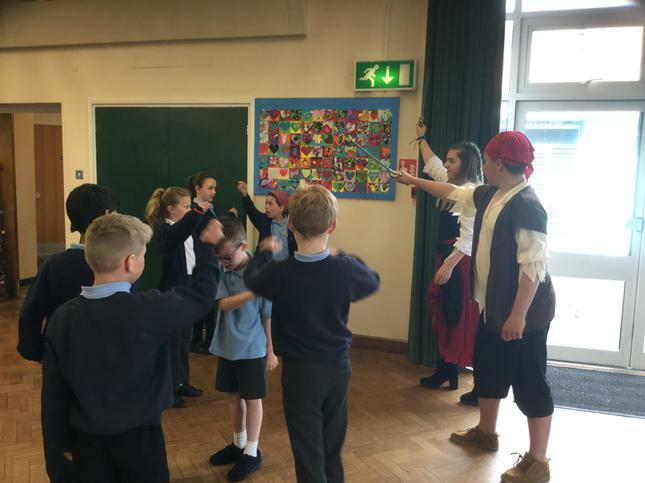 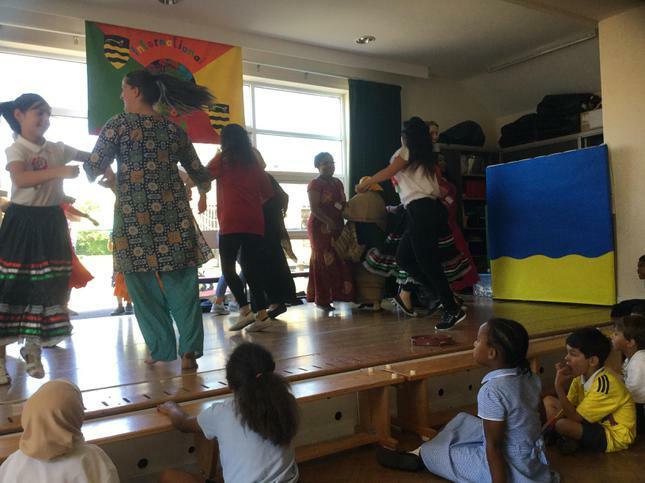 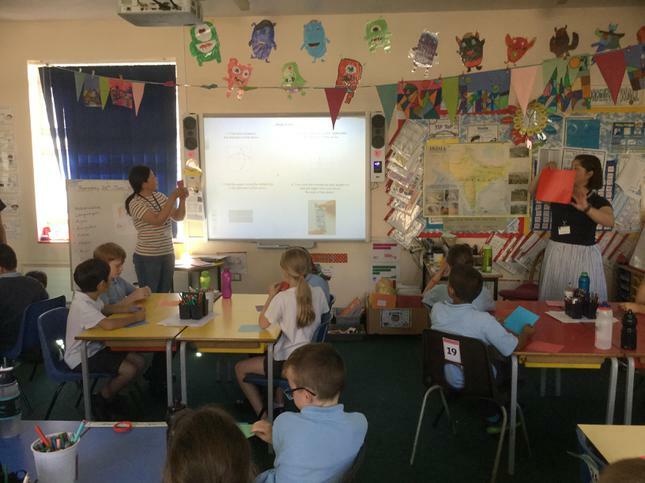 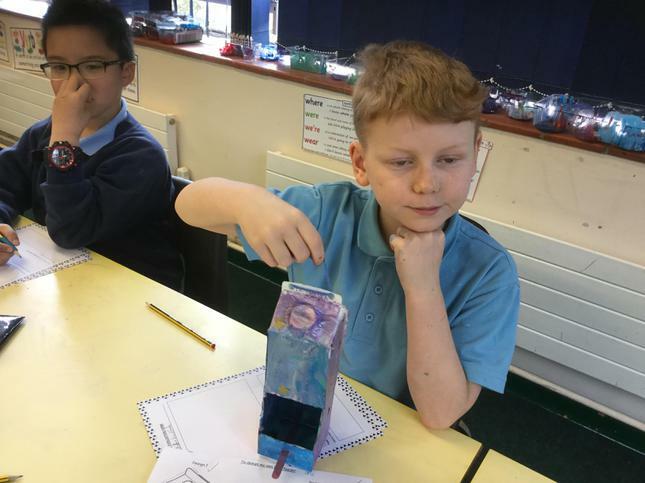 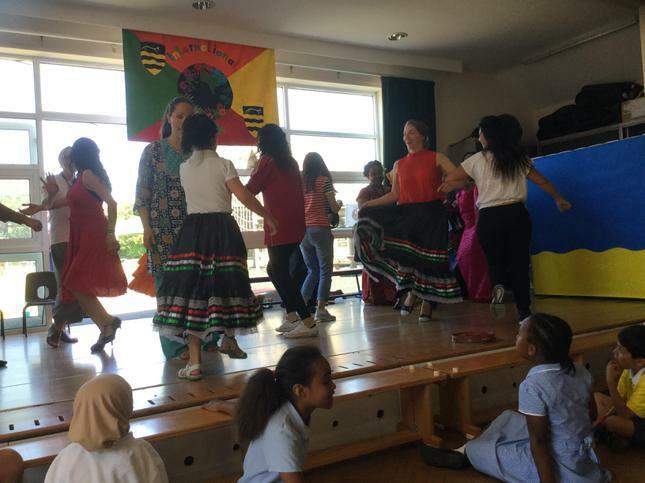 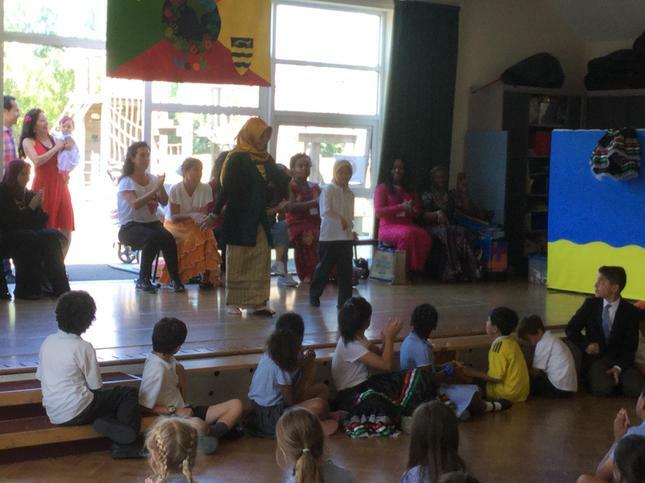 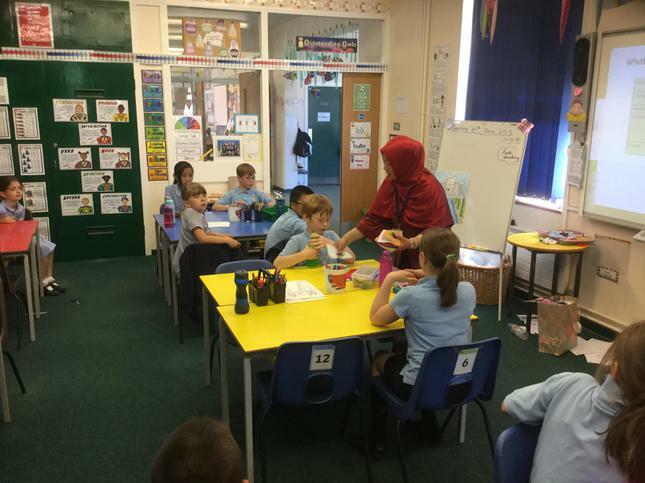 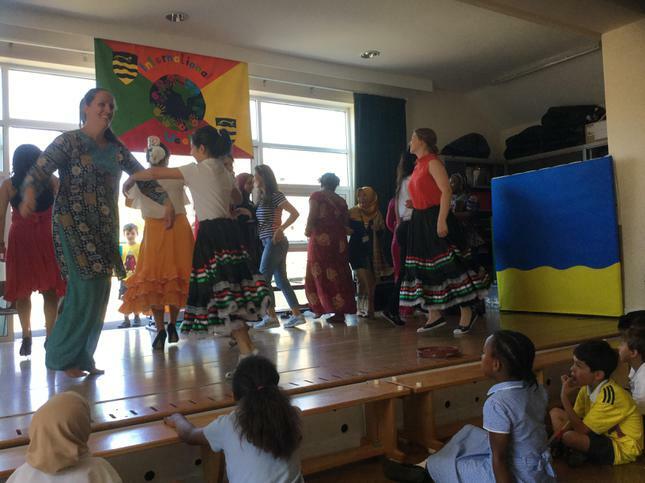 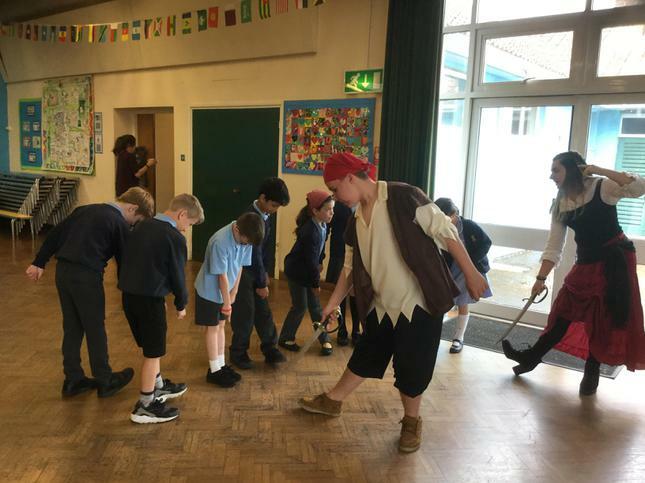 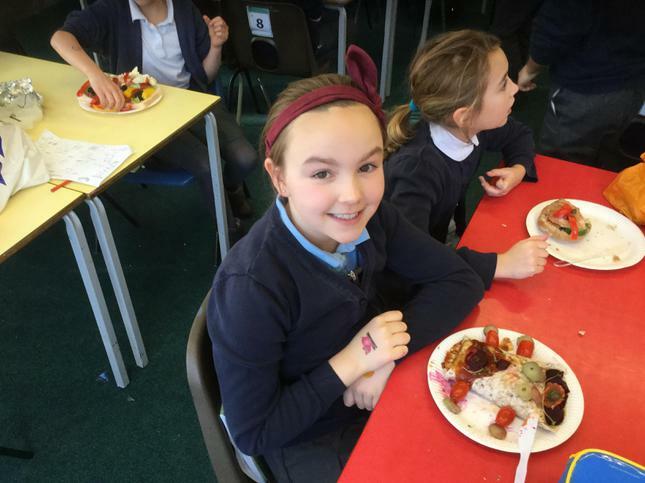 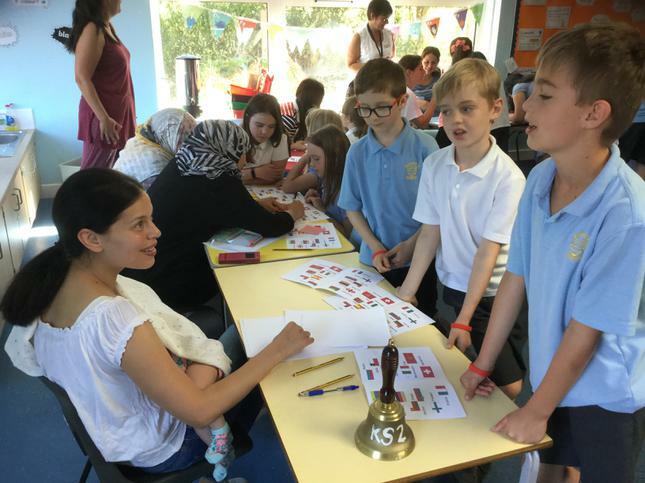 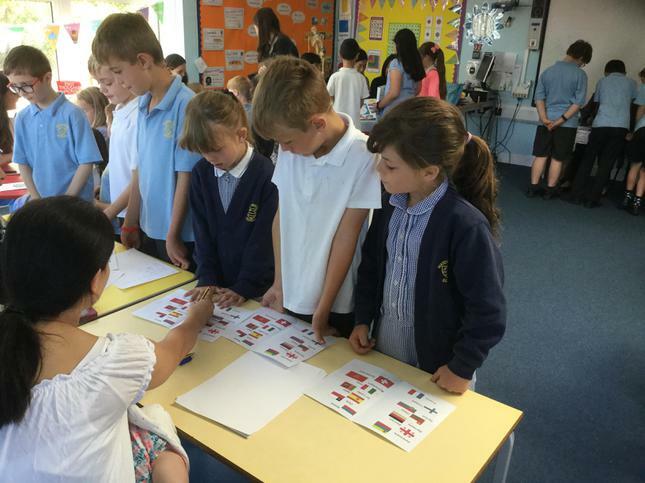 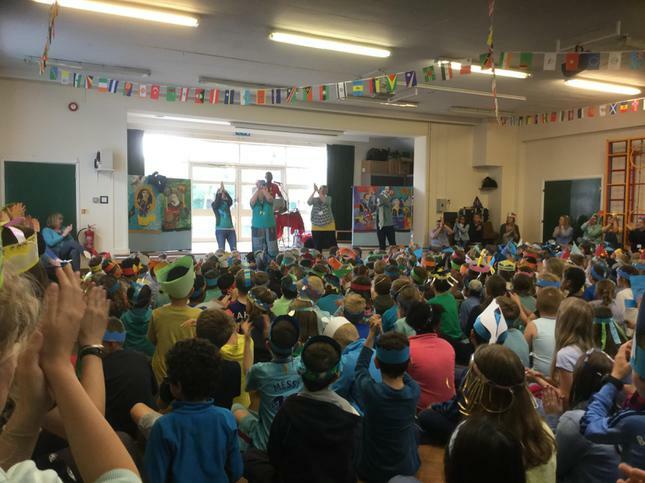 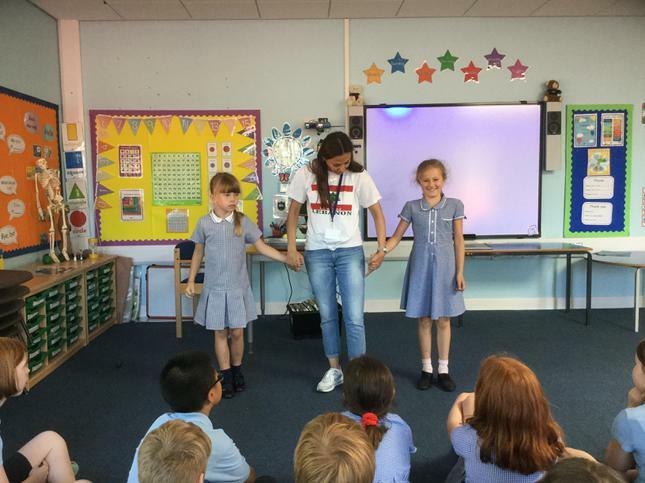 All the Owls thoroughly enjoyed International Week and we tried so many new things - thank you so much to all who made this possible! 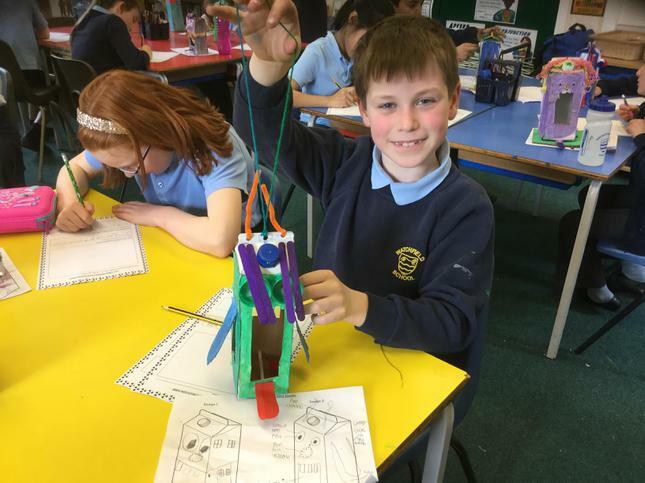 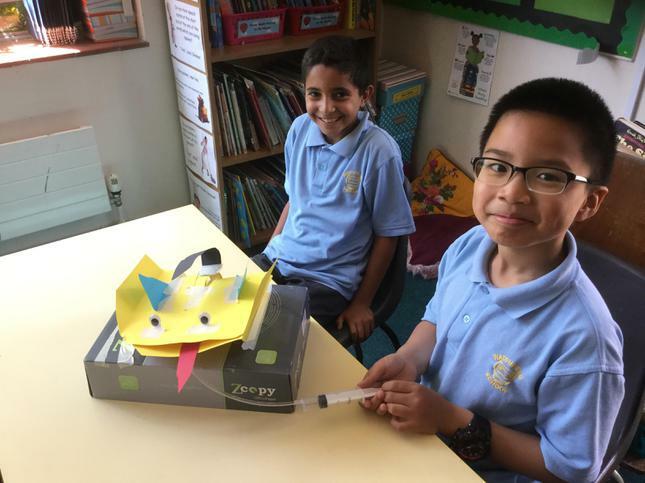 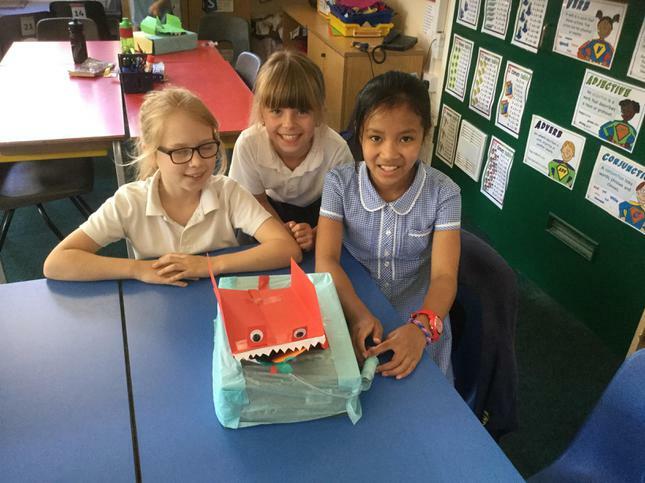 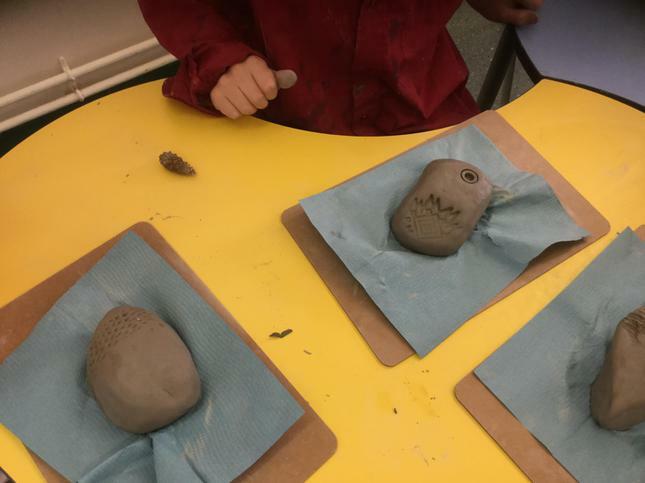 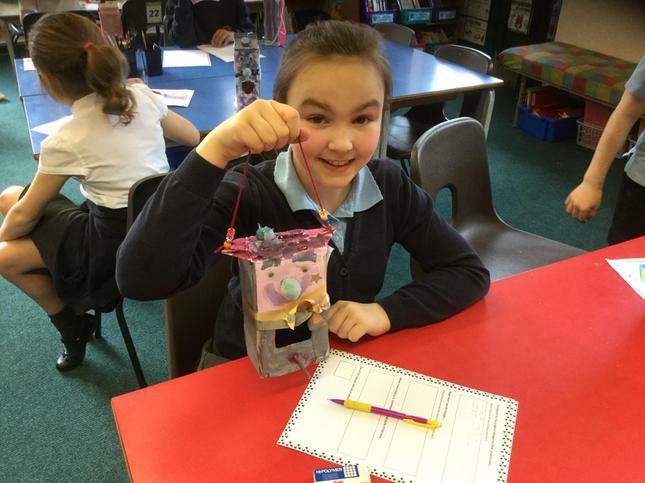 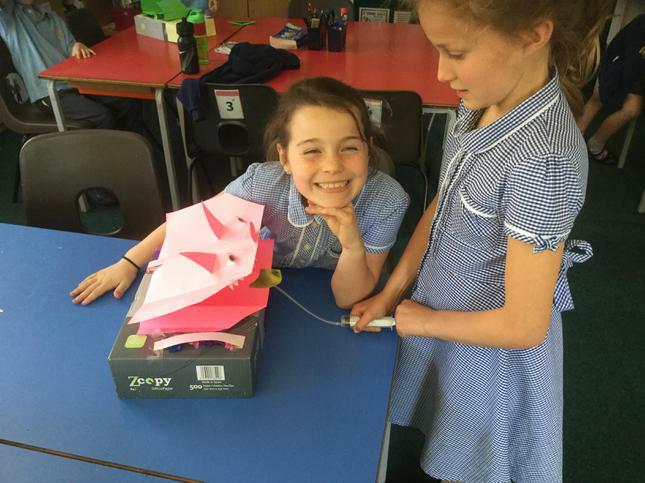 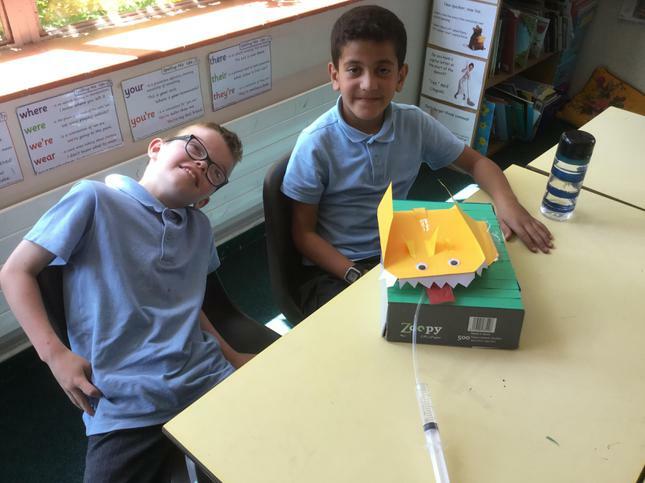 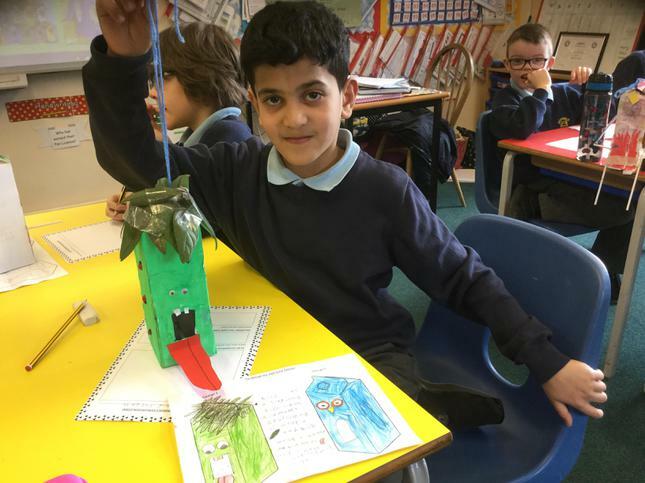 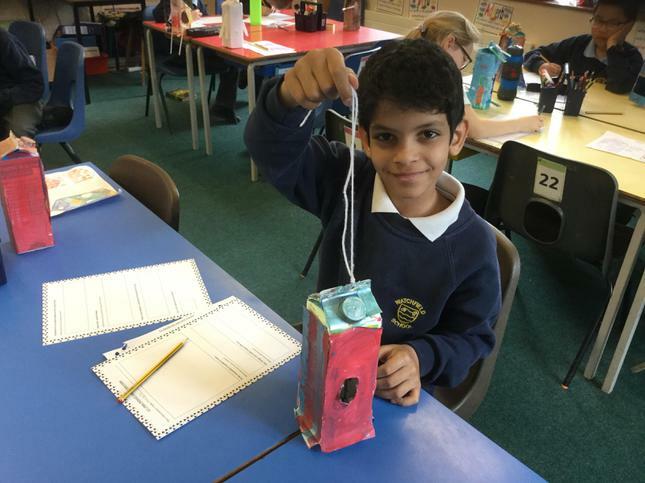 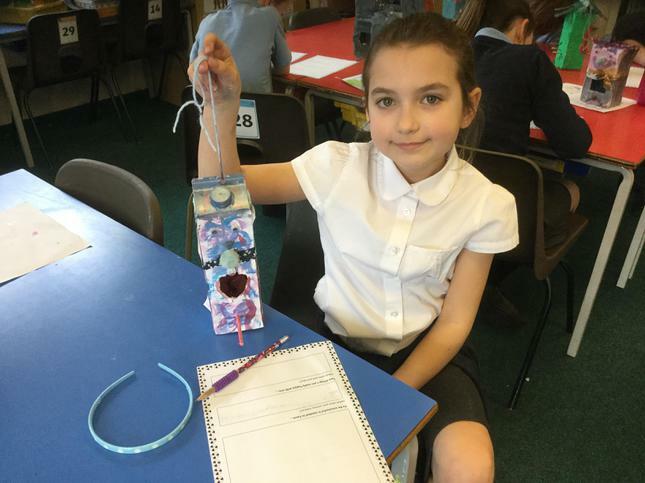 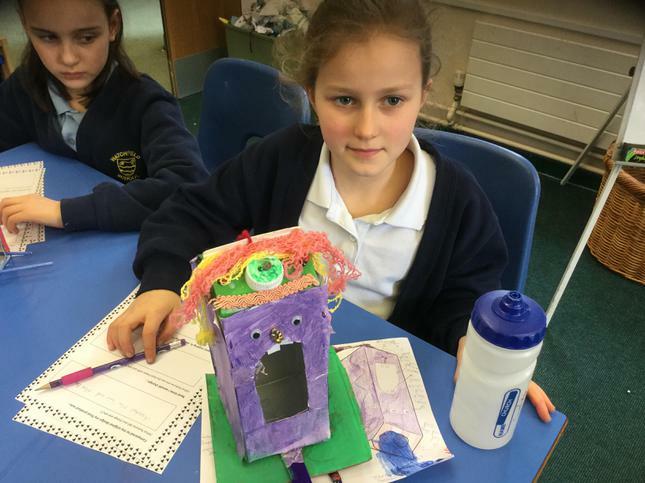 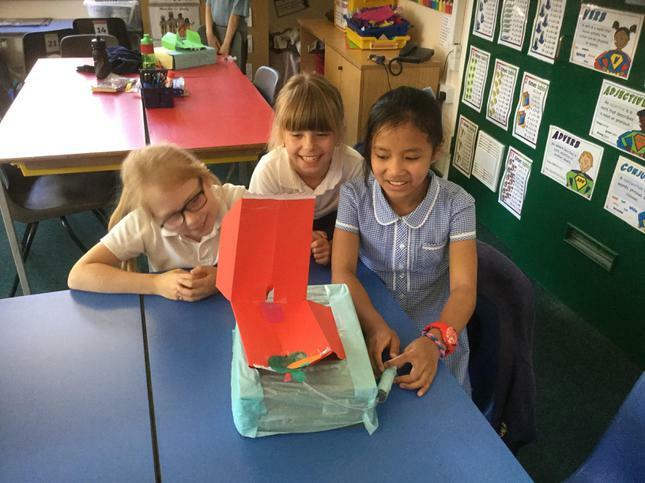 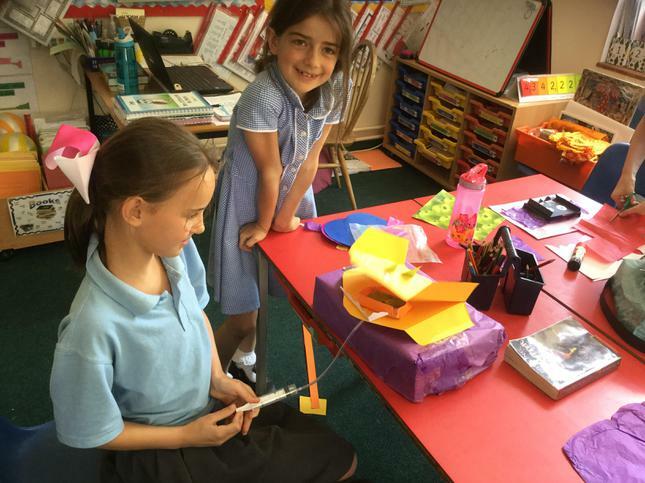 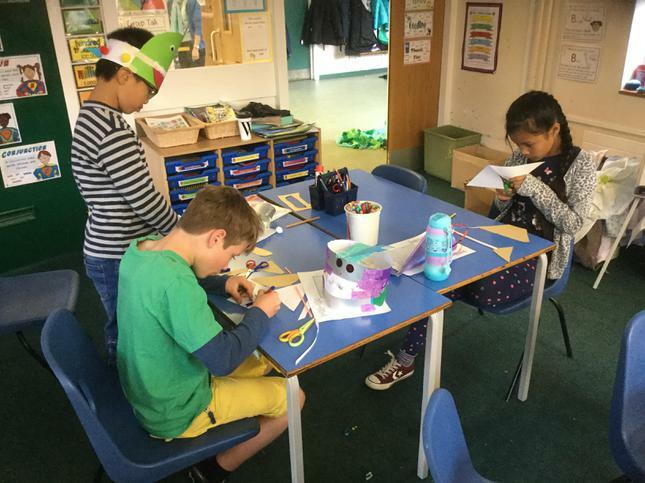 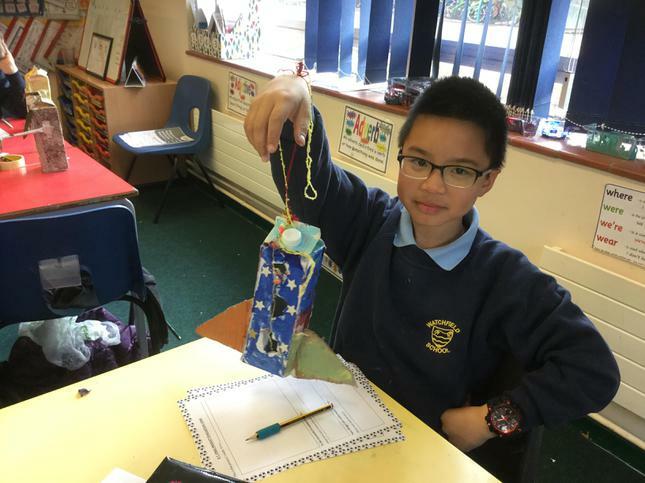 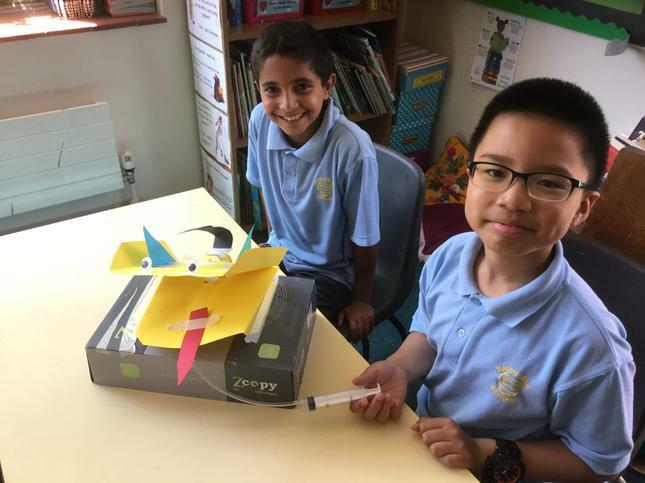 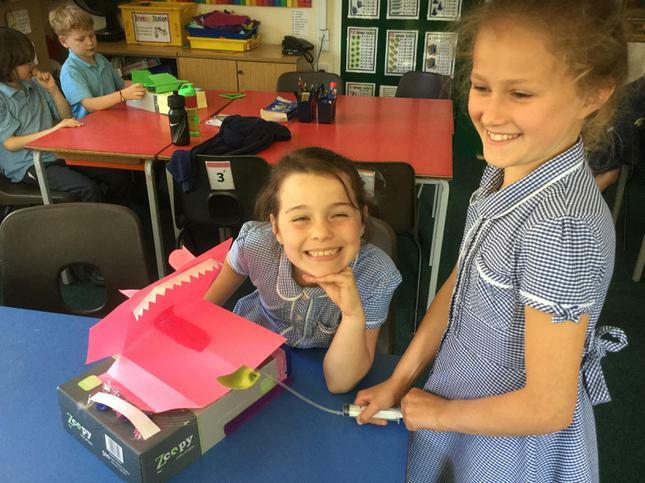 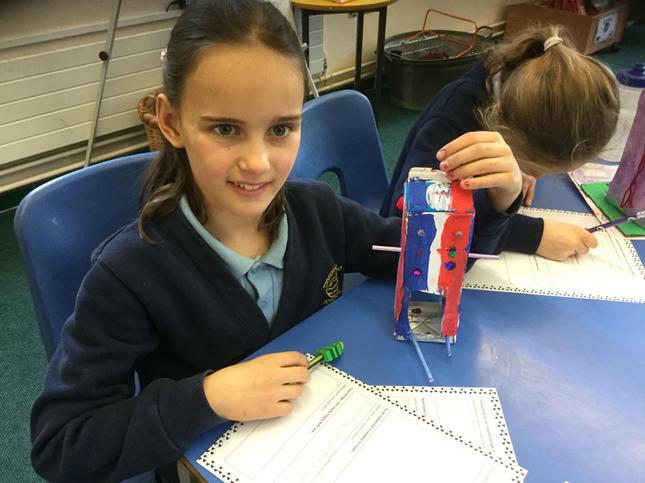 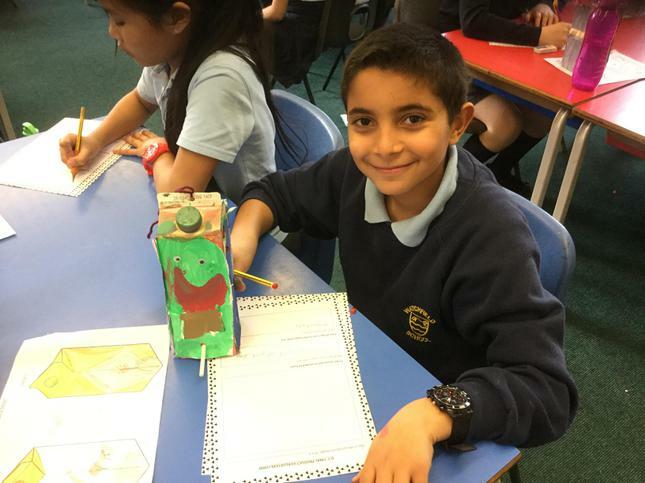 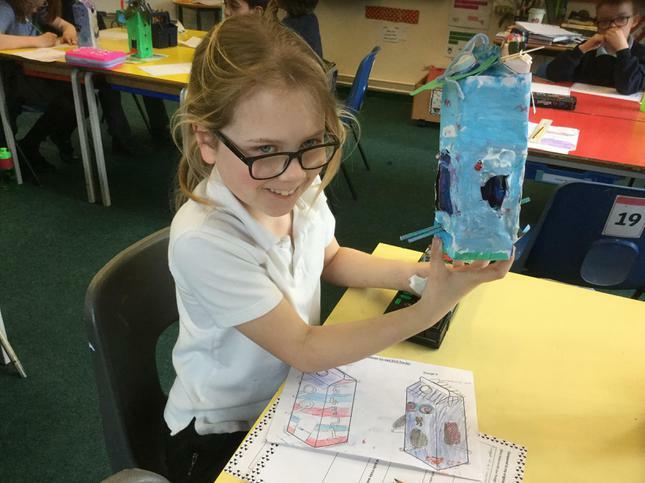 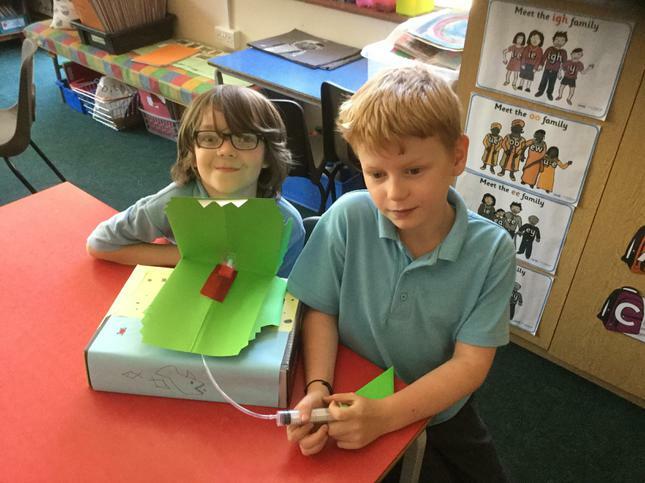 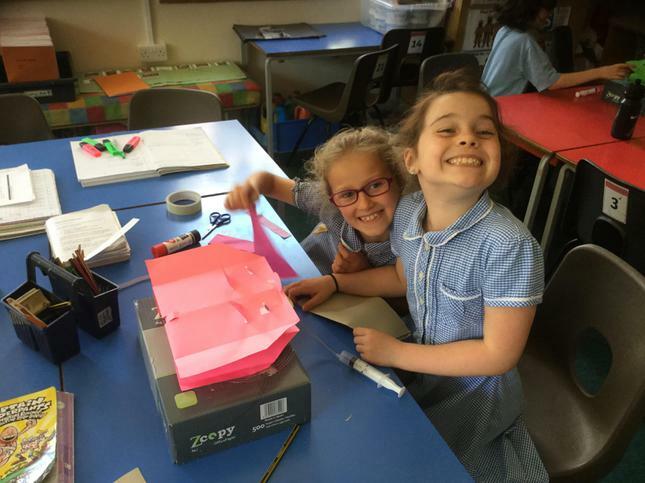 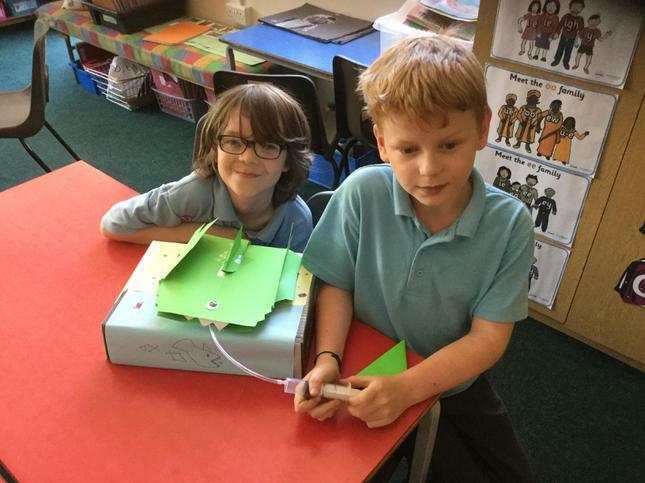 We had great fun in DT making these moving monsters with an air-powered remote control! 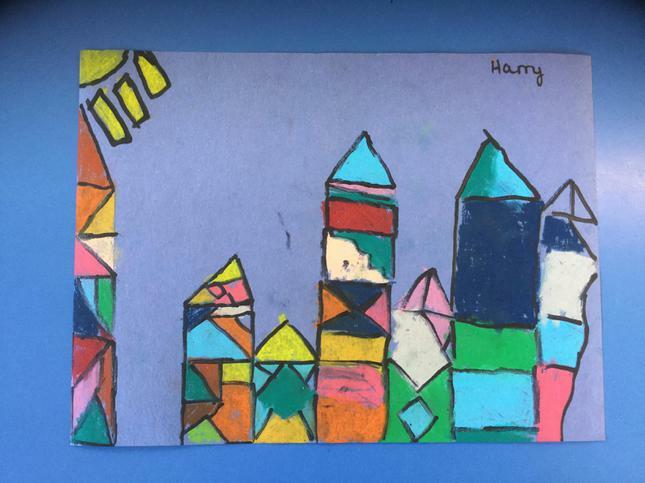 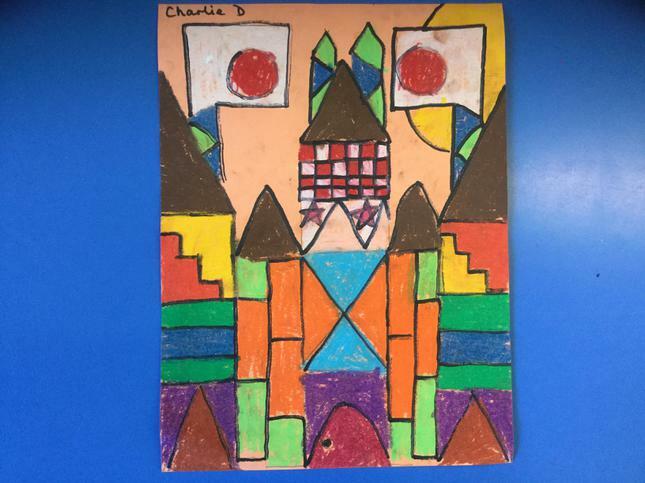 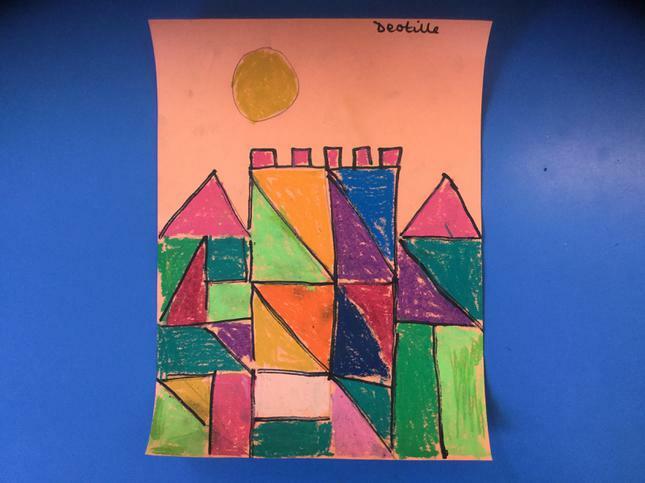 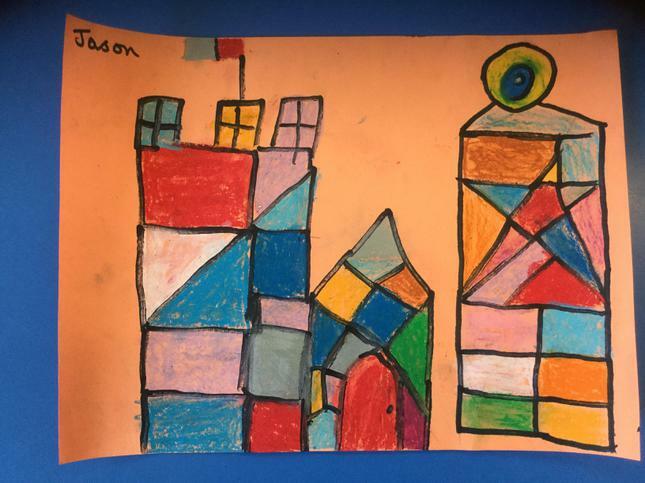 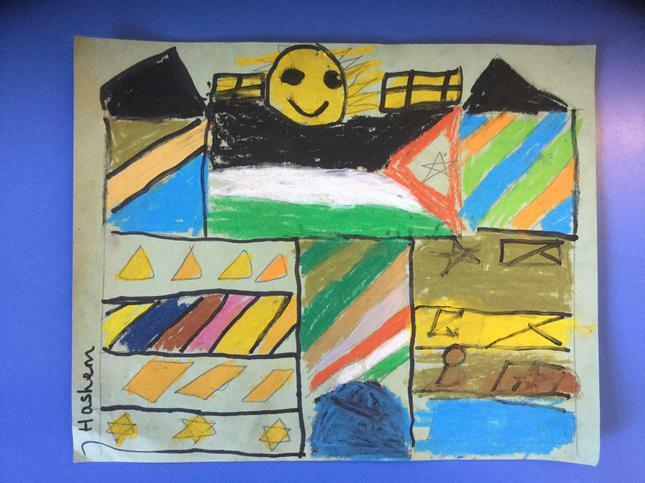 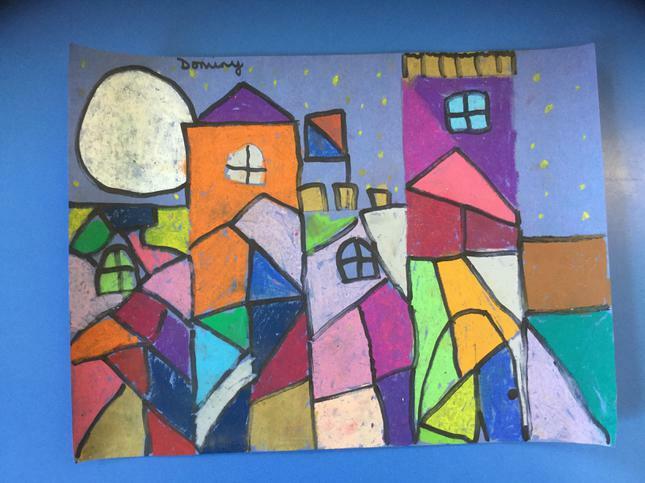 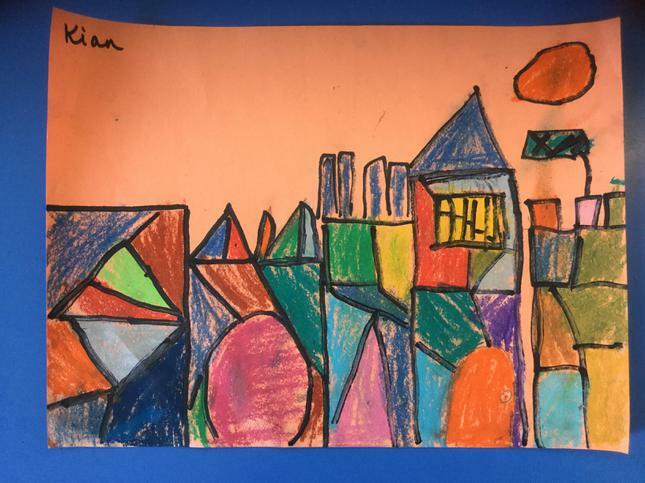 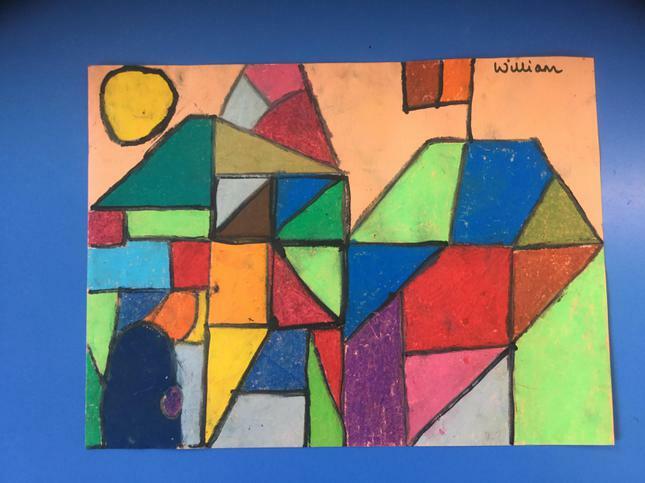 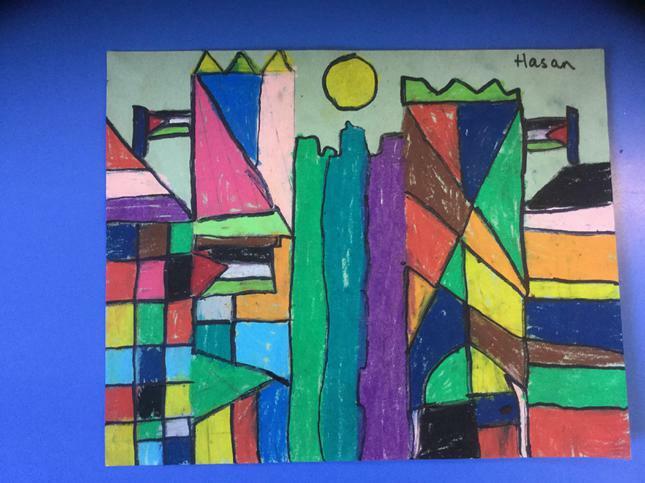 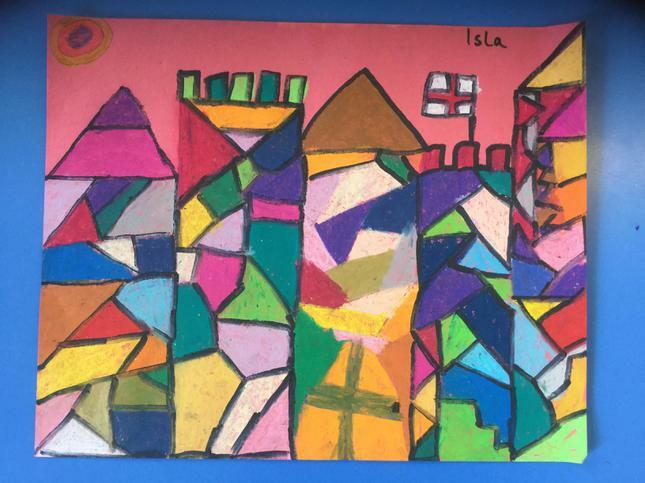 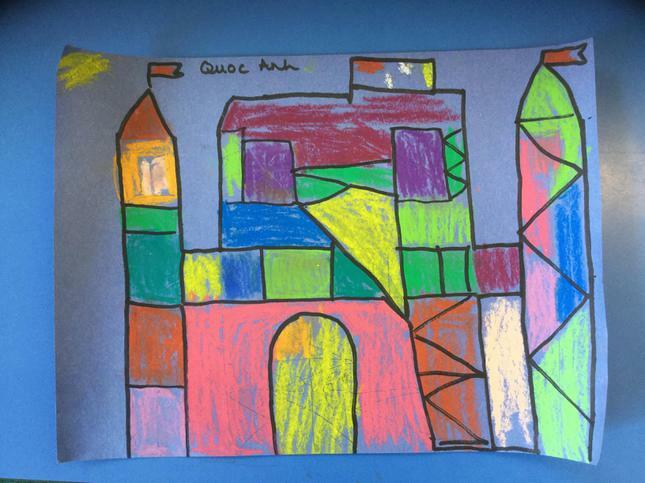 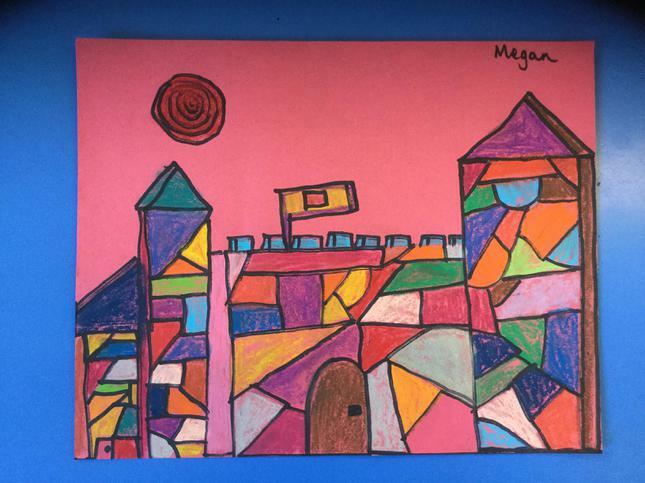 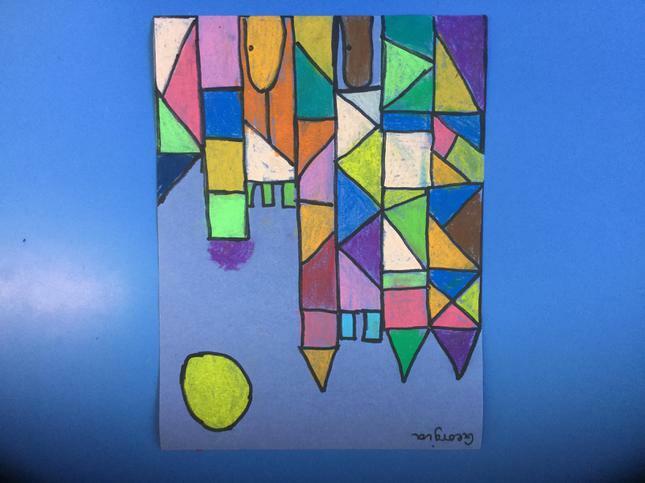 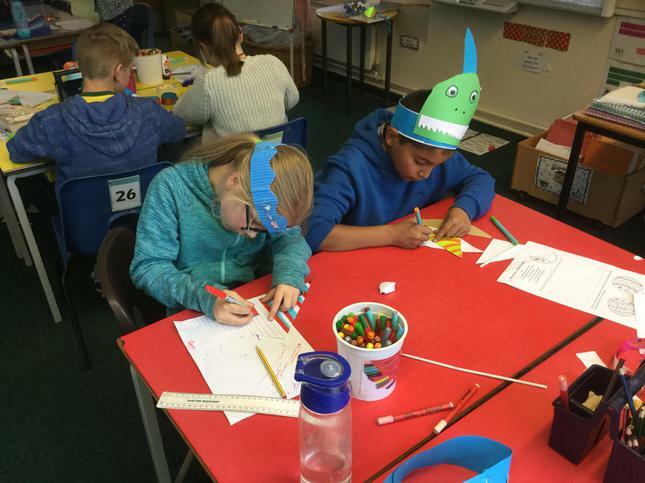 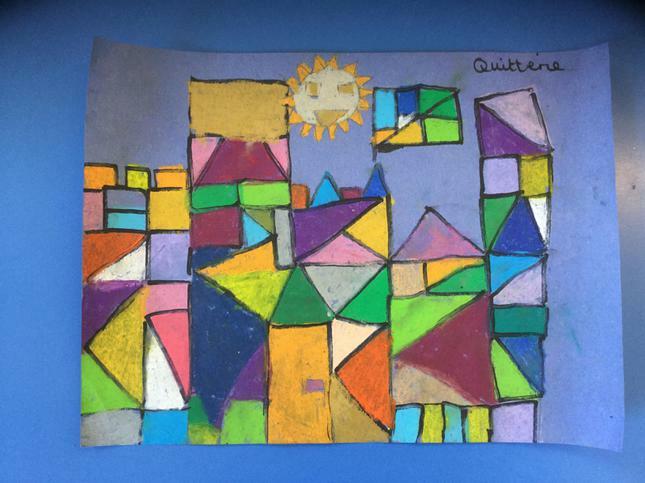 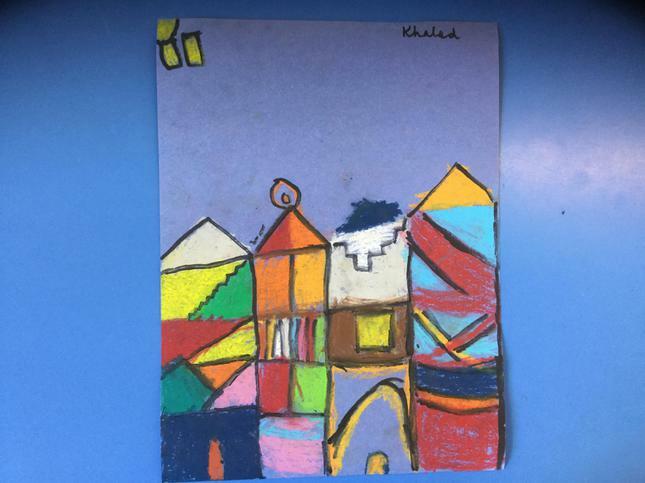 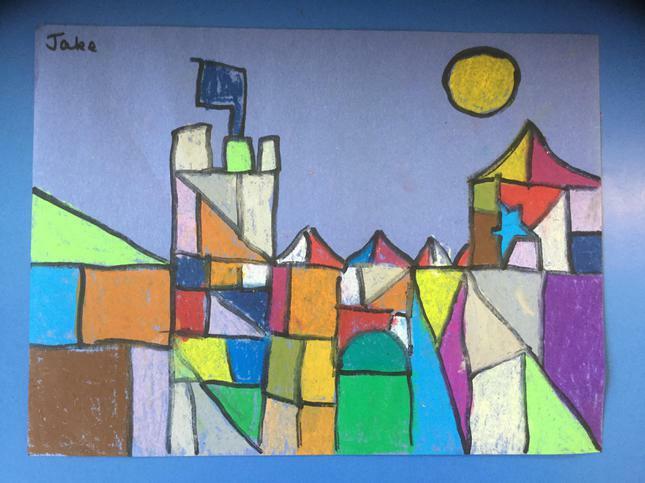 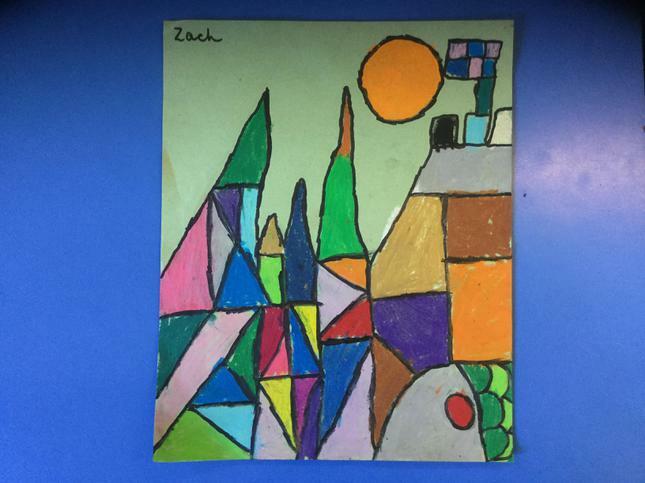 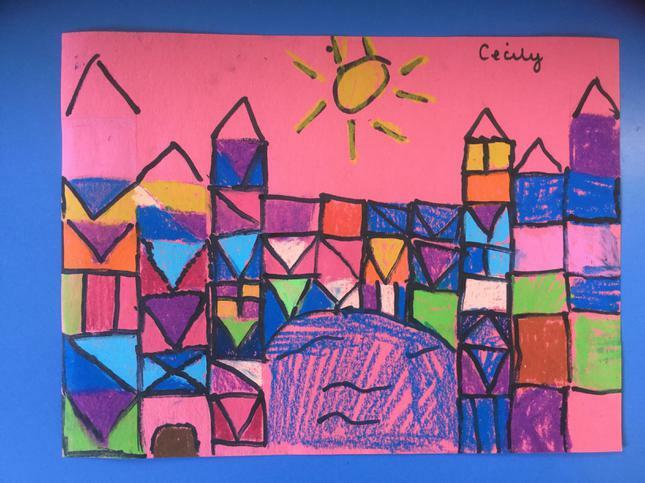 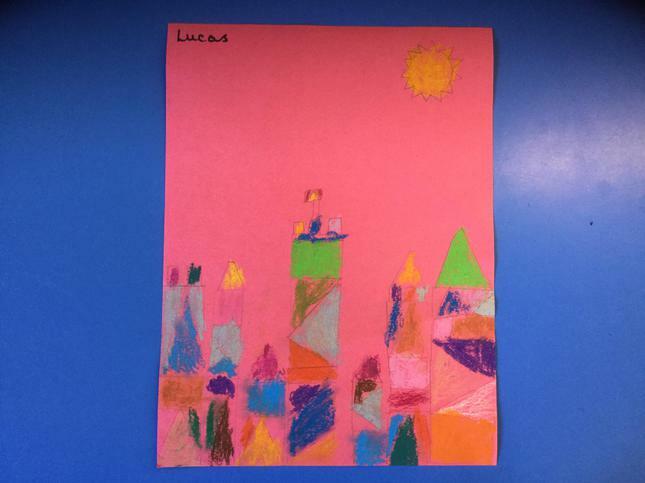 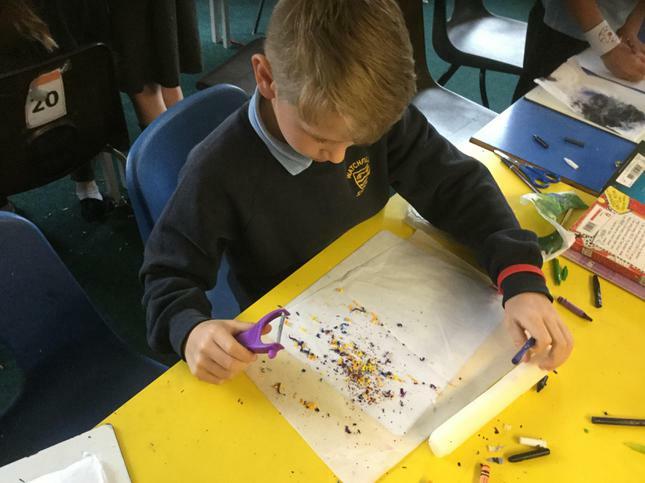 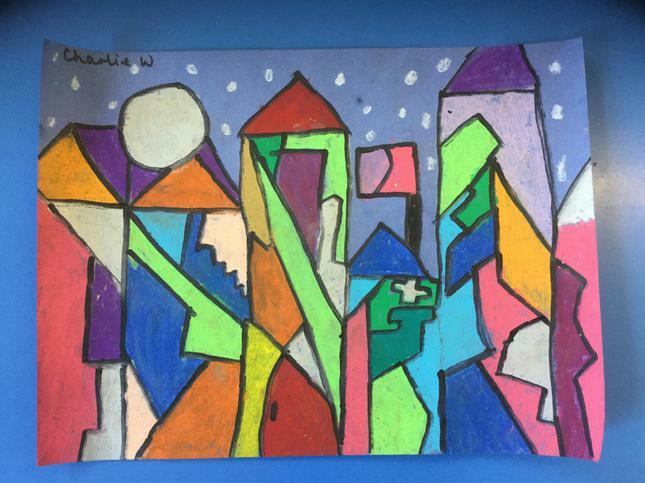 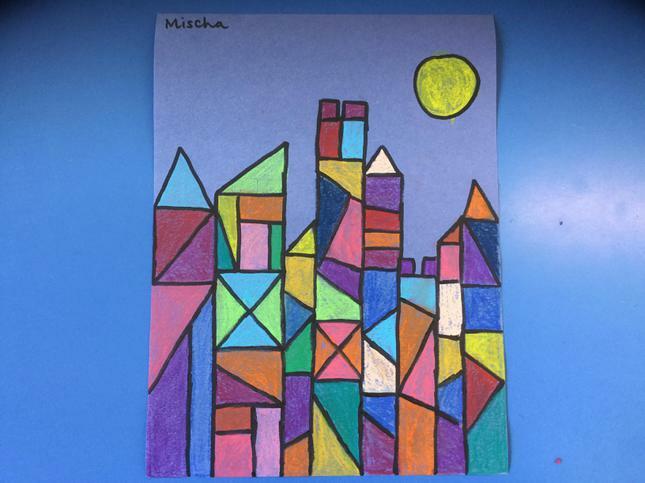 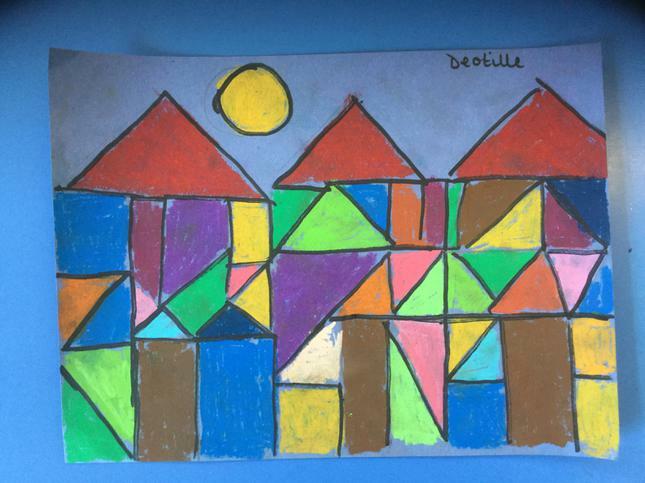 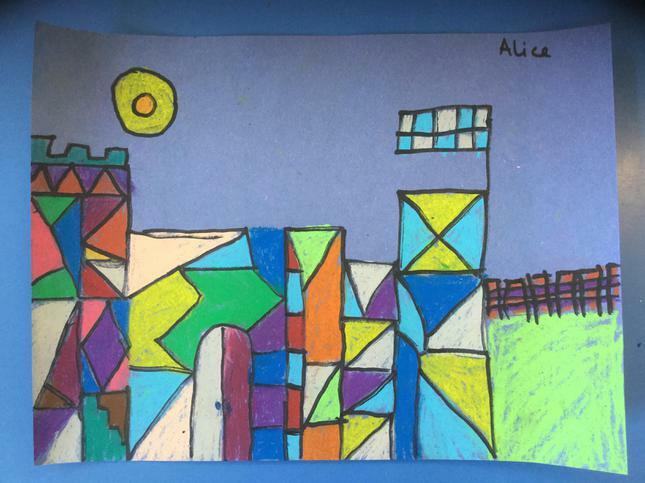 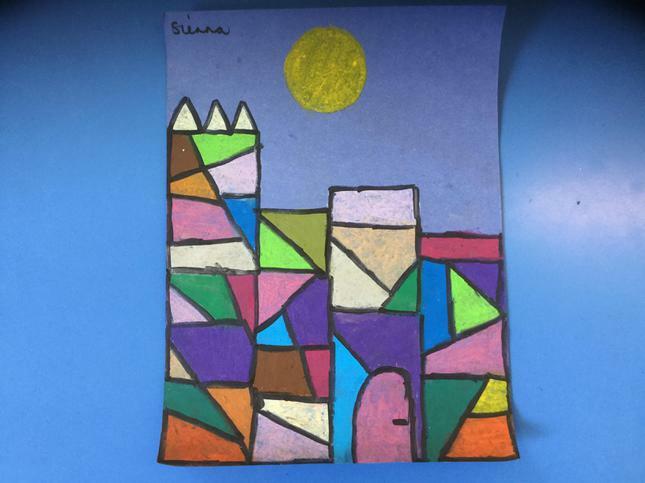 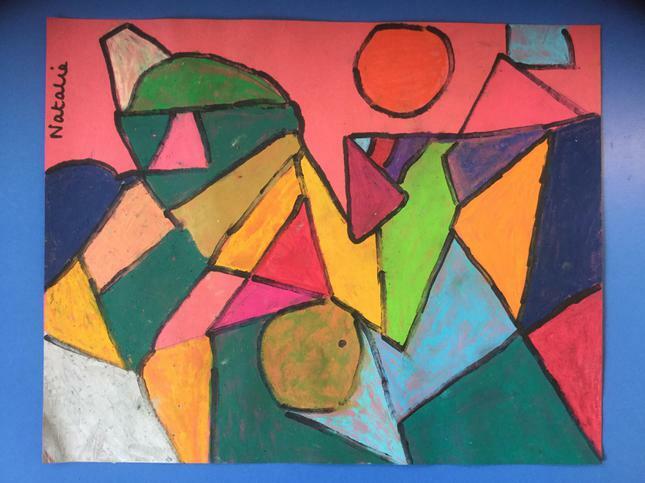 We used oil pastels to create amazing art inspired by Paul Klee's 'Castle and Sun'. 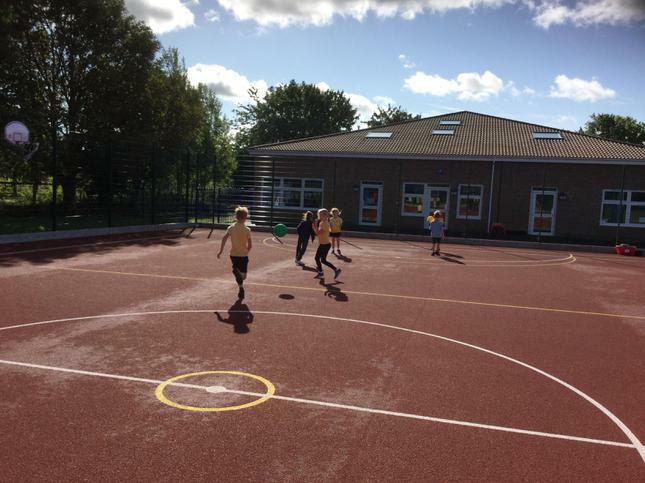 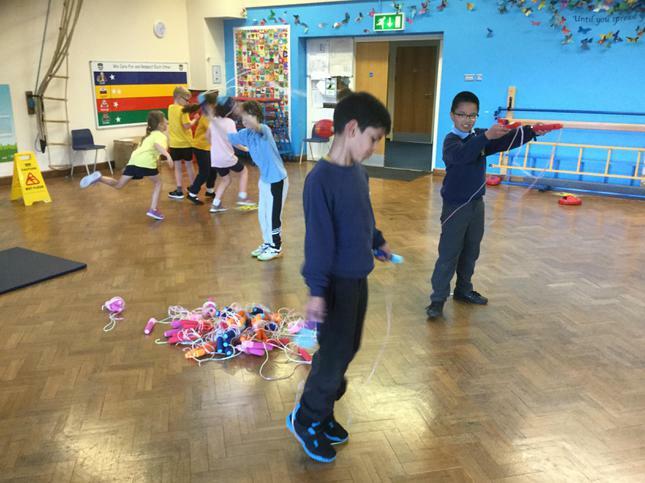 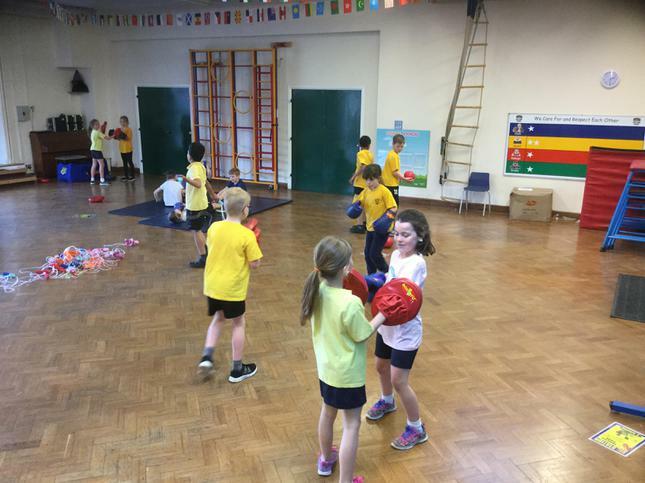 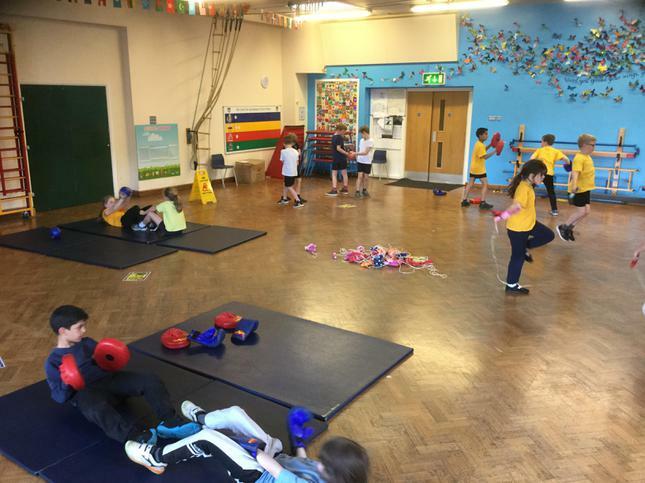 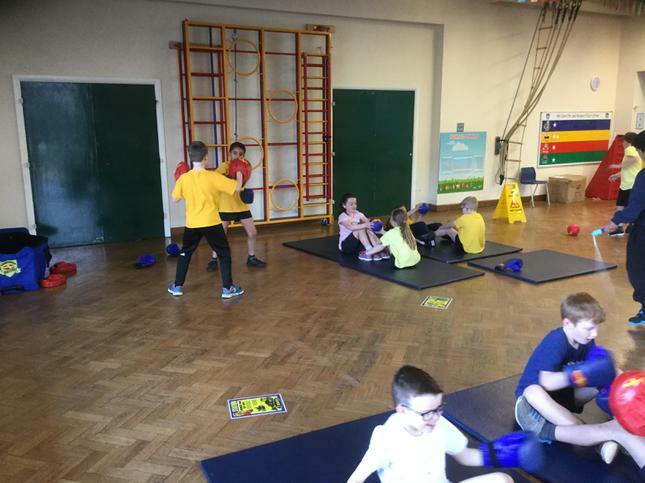 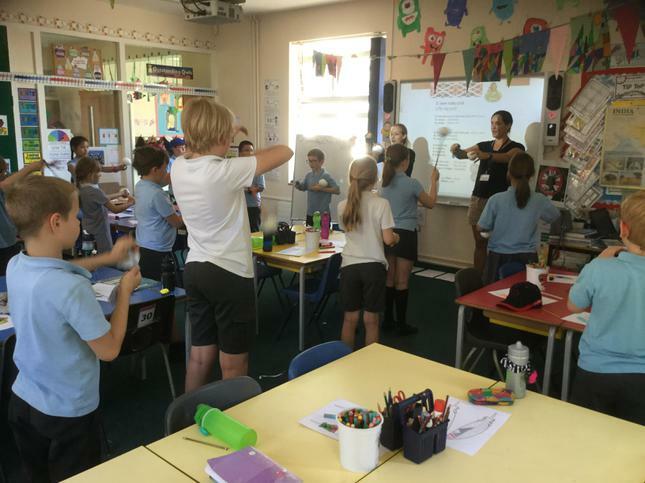 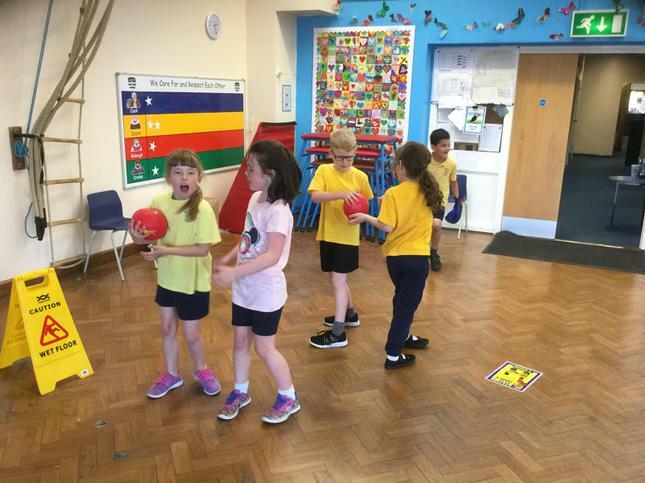 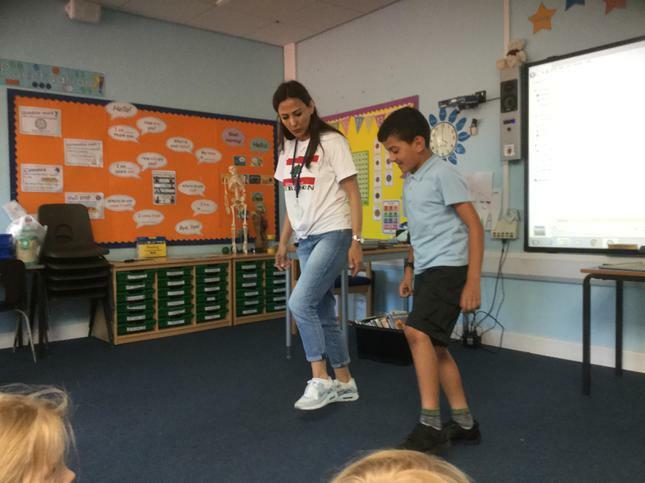 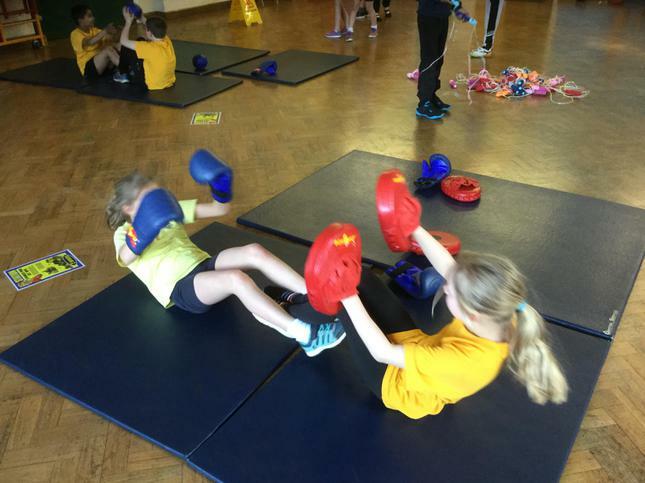 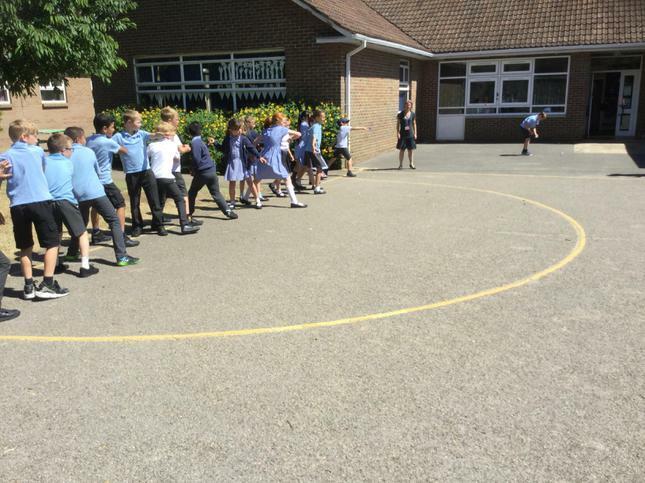 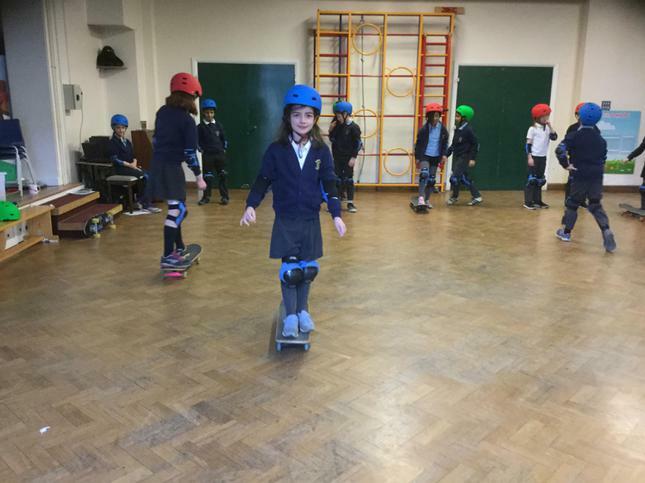 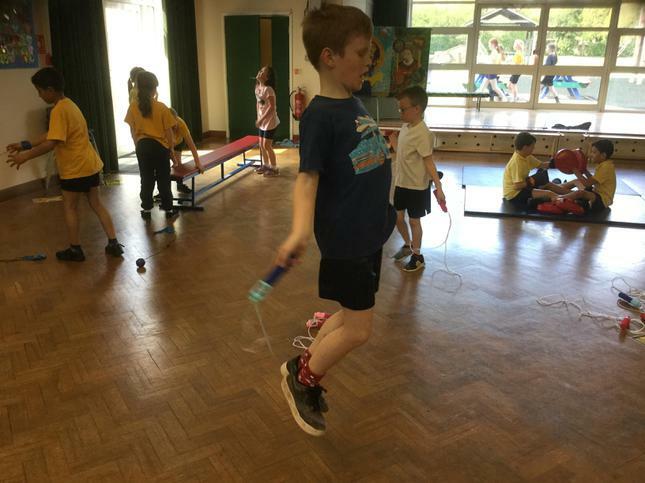 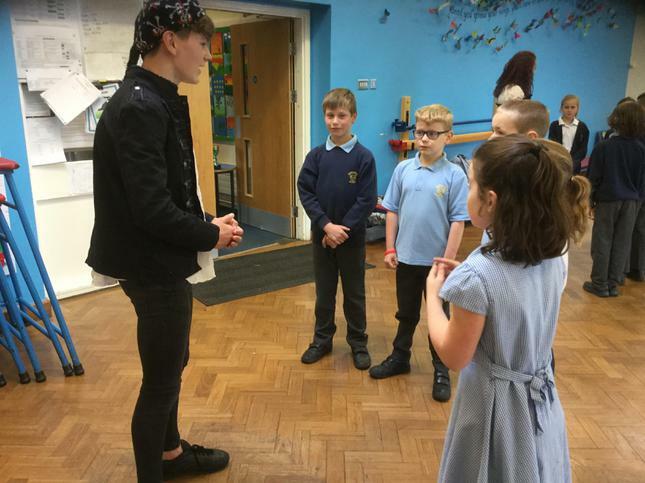 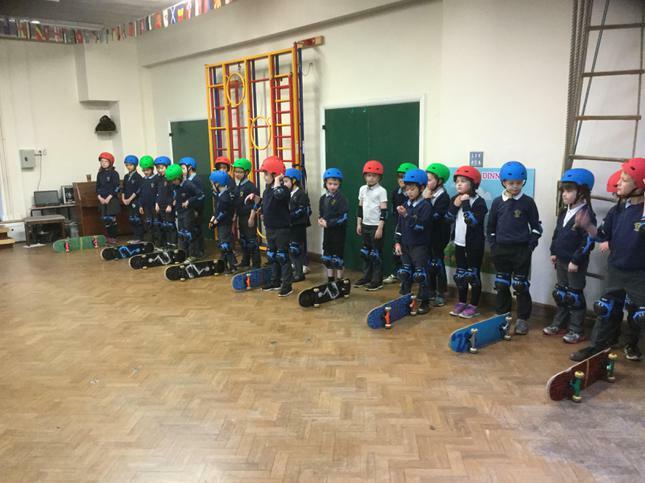 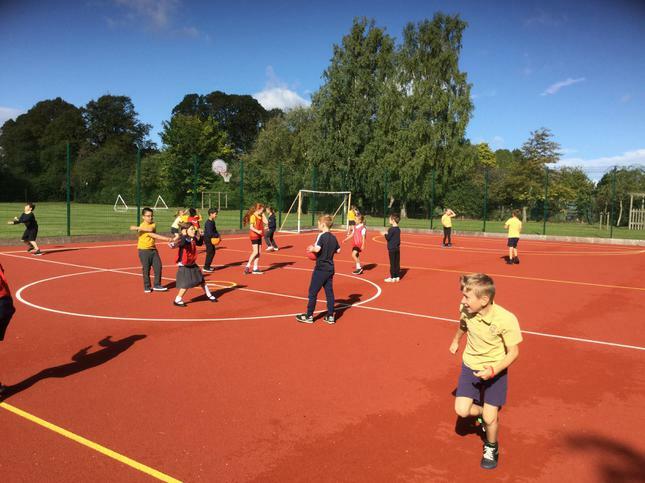 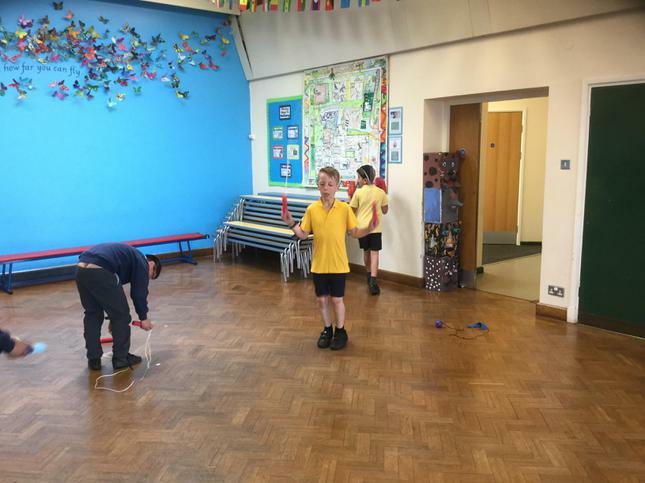 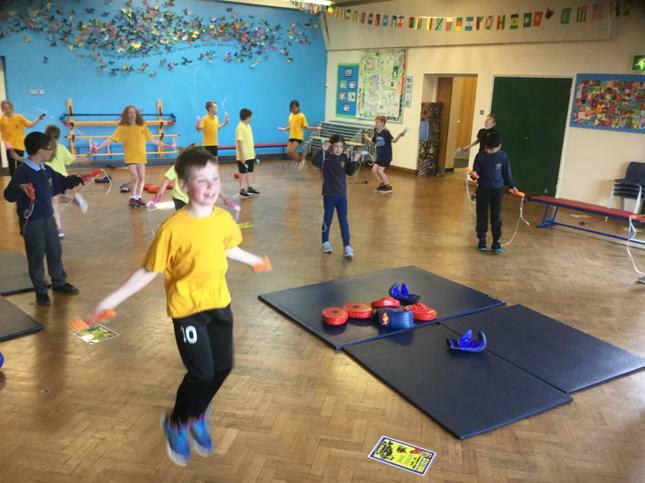 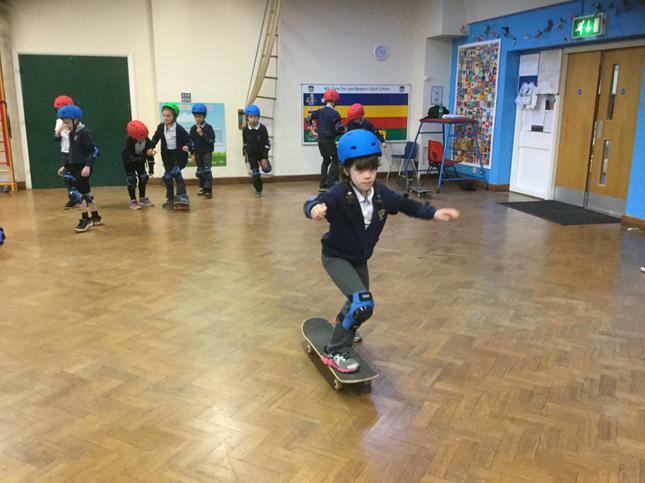 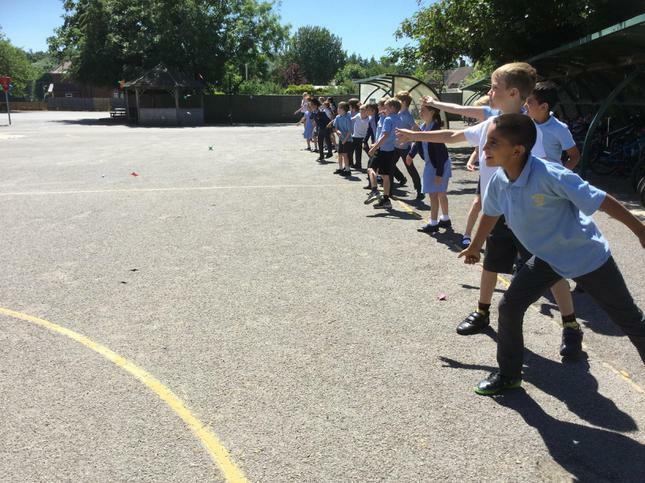 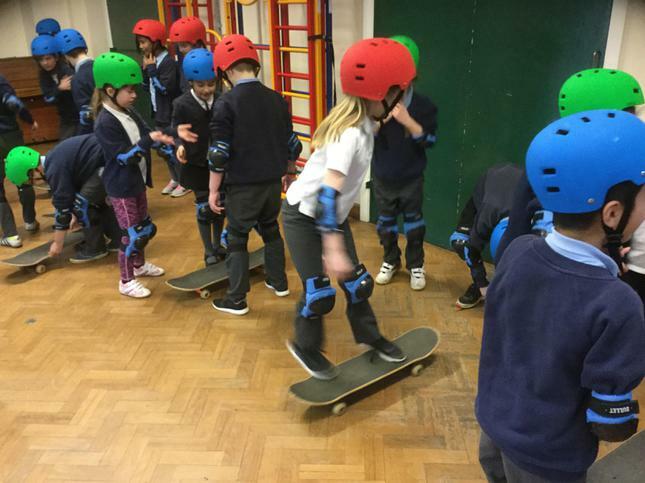 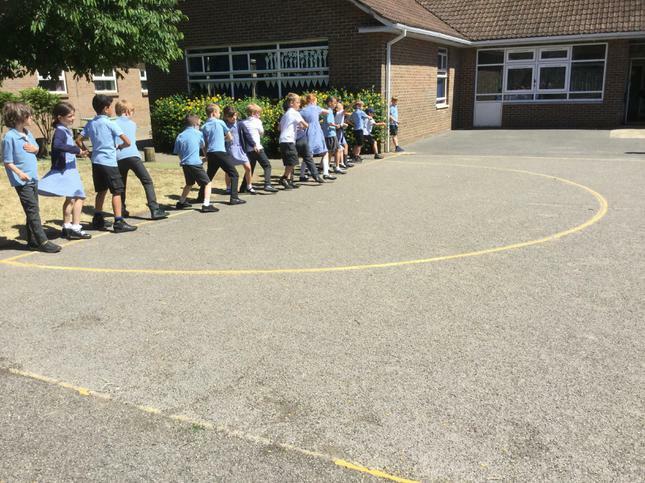 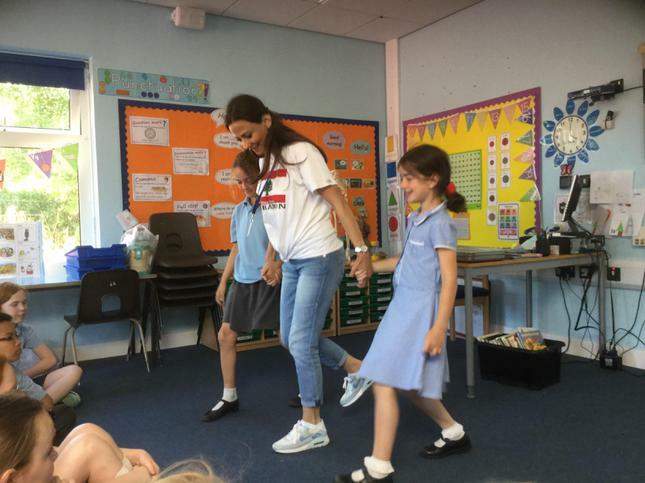 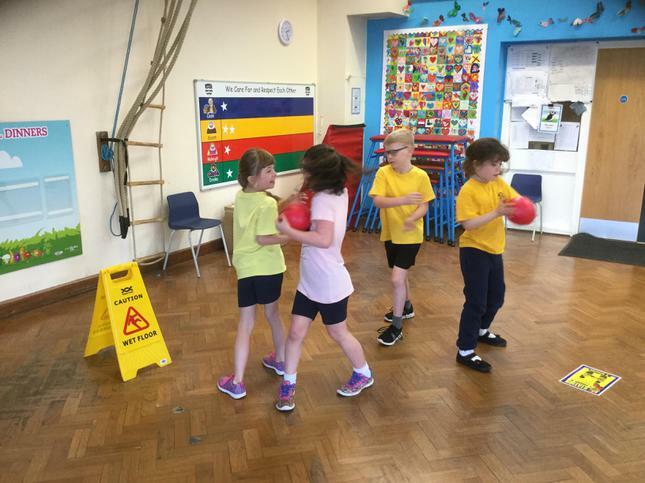 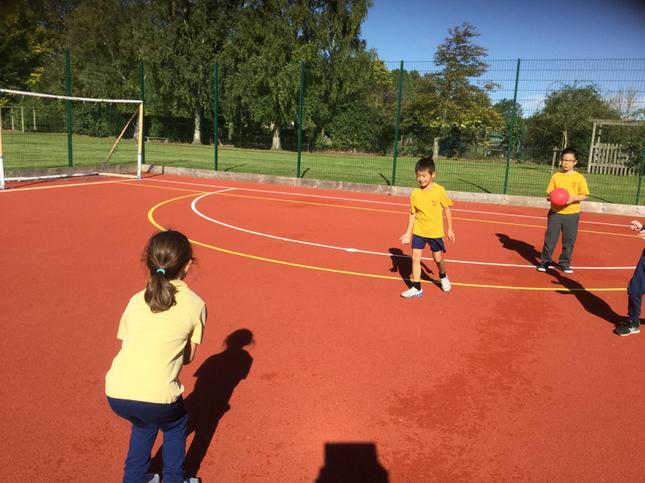 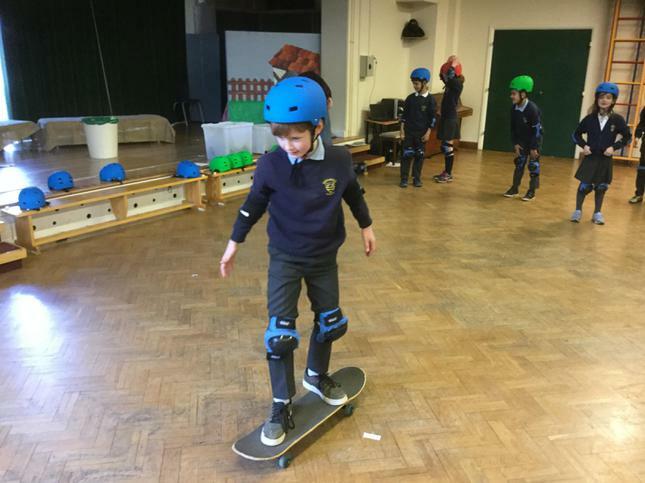 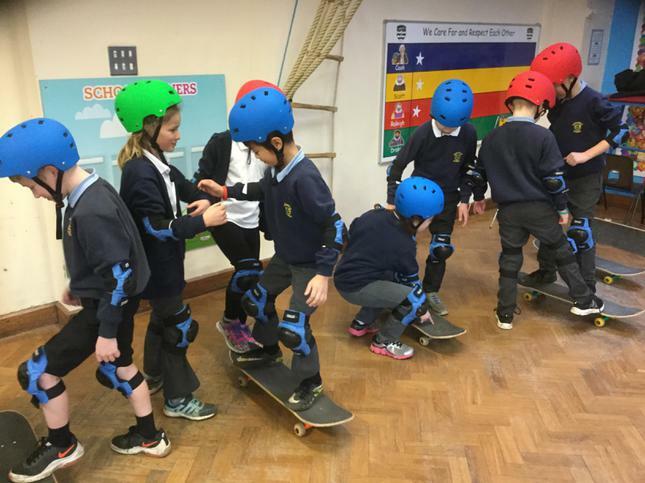 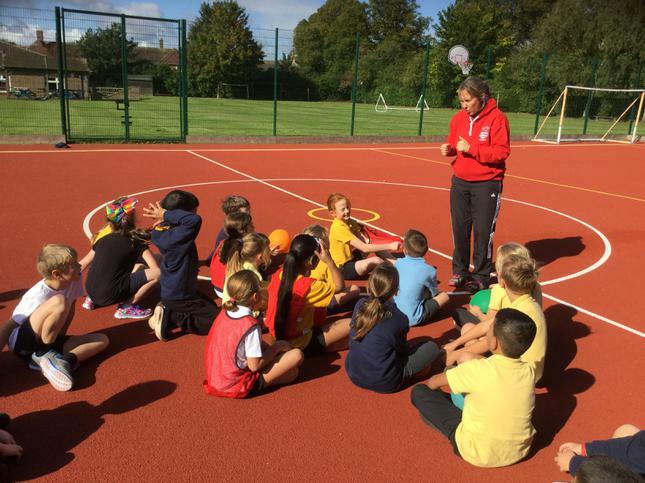 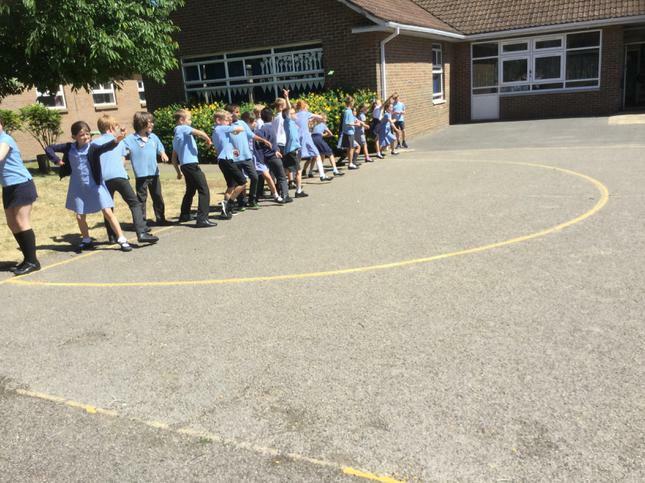 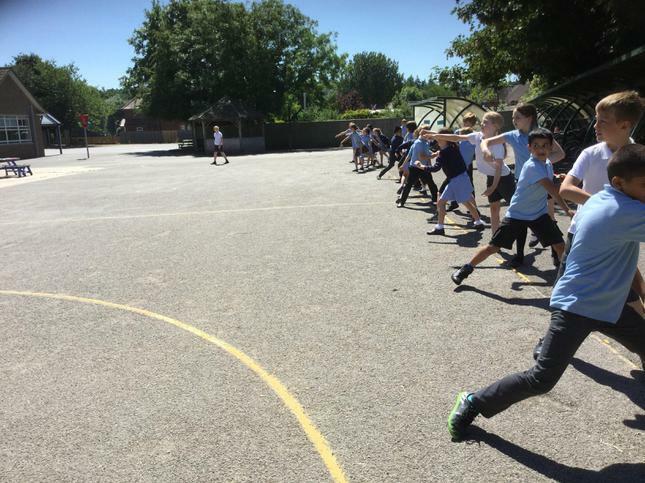 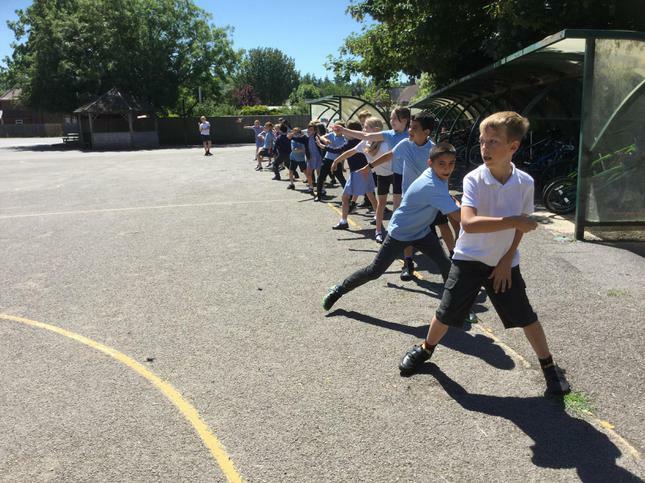 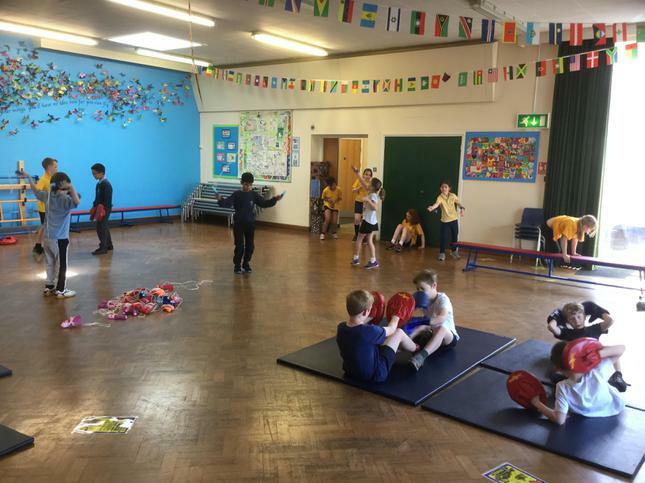 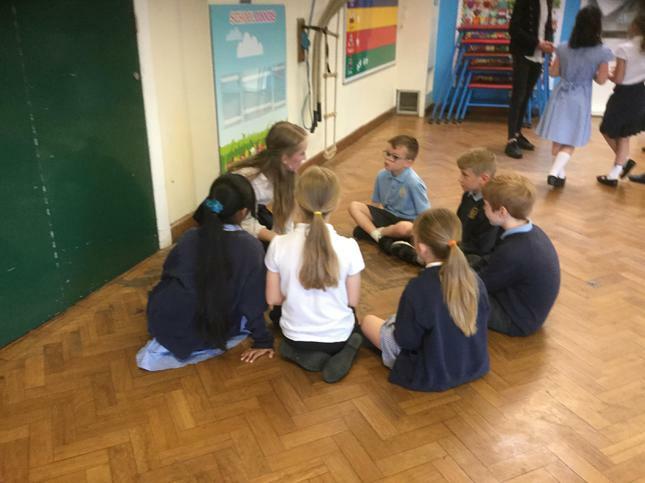 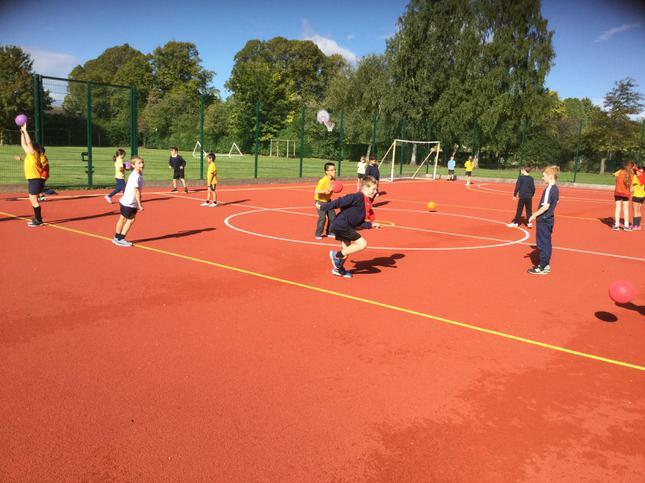 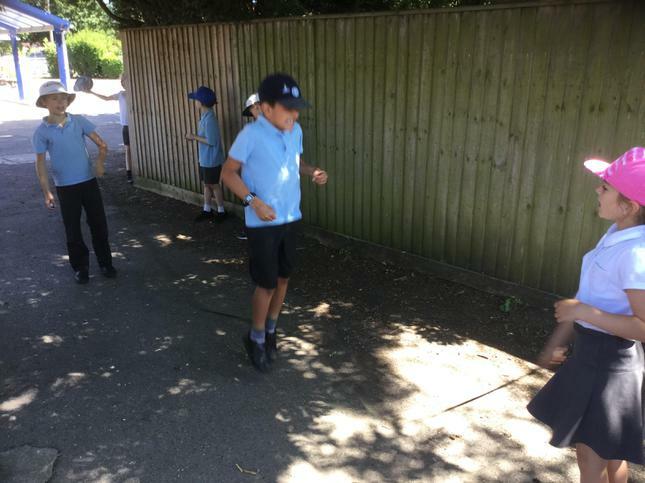 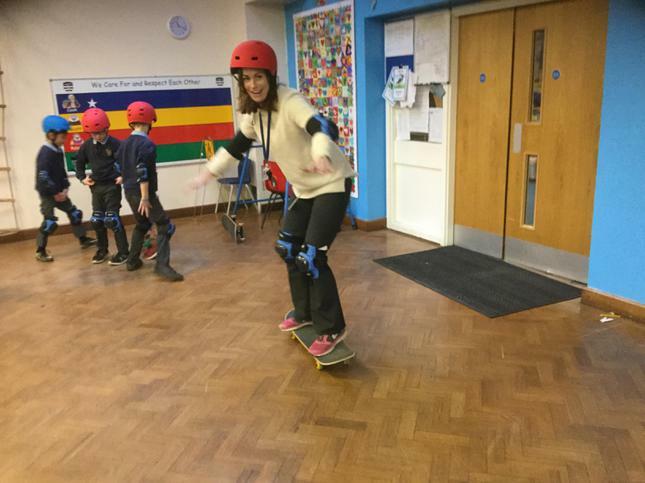 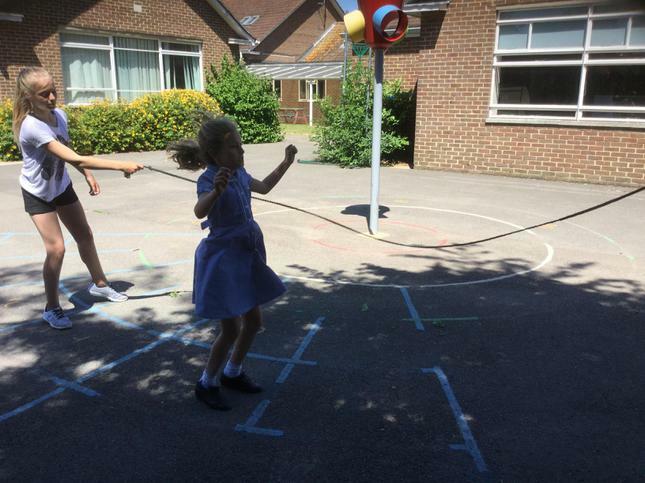 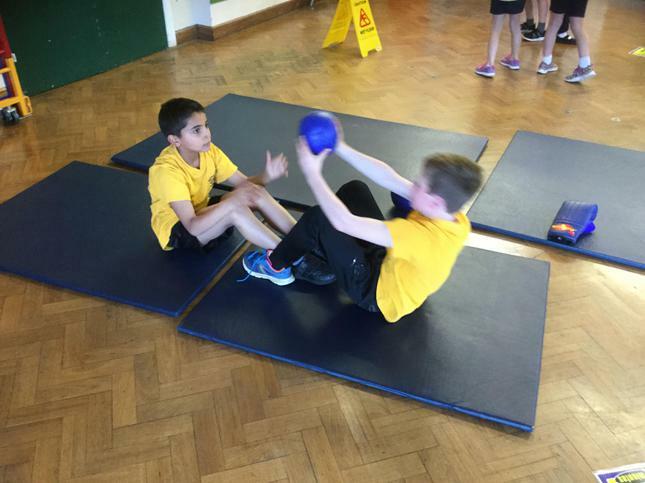 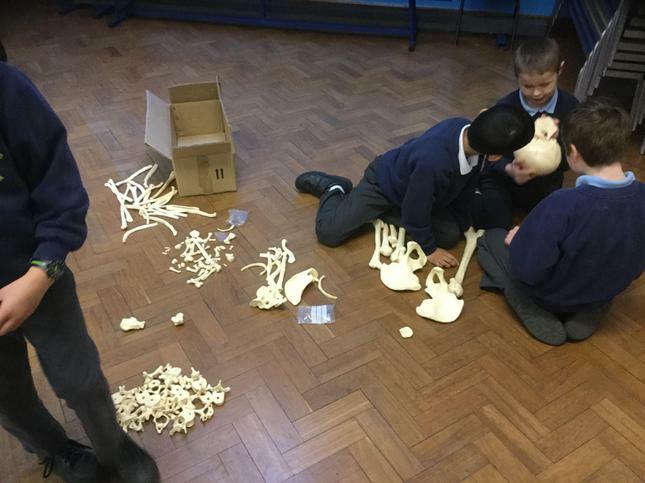 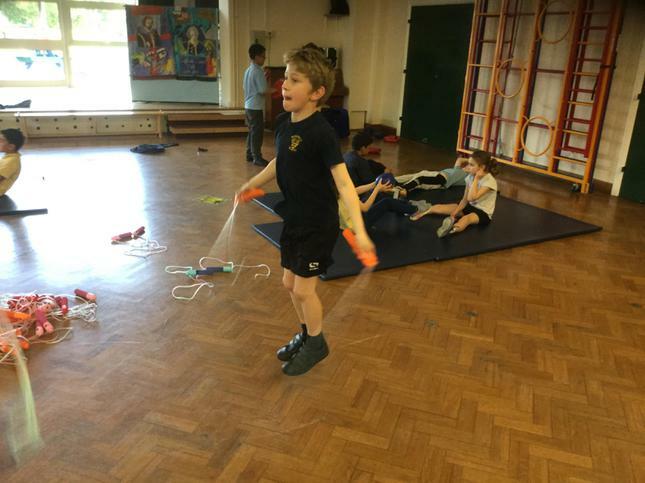 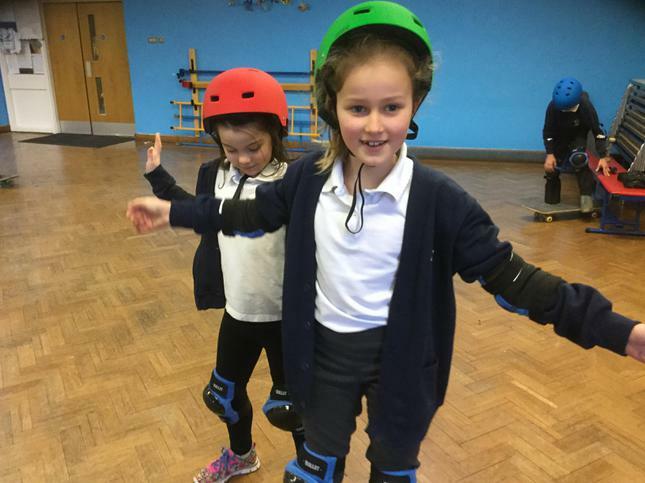 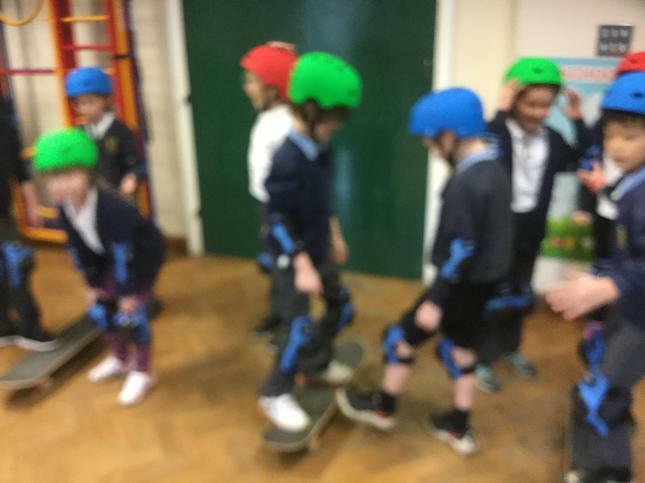 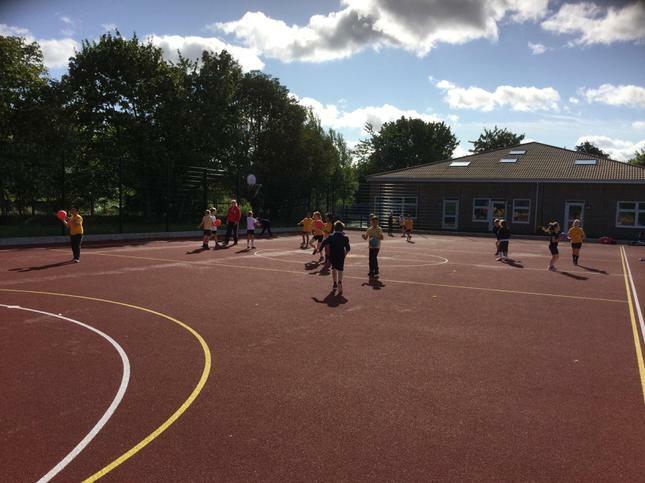 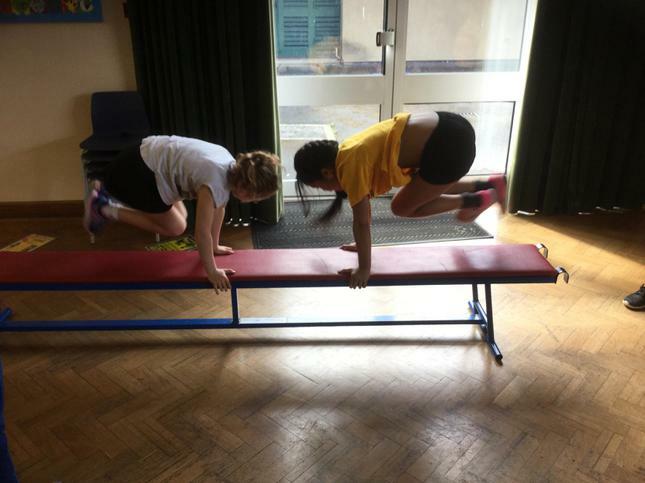 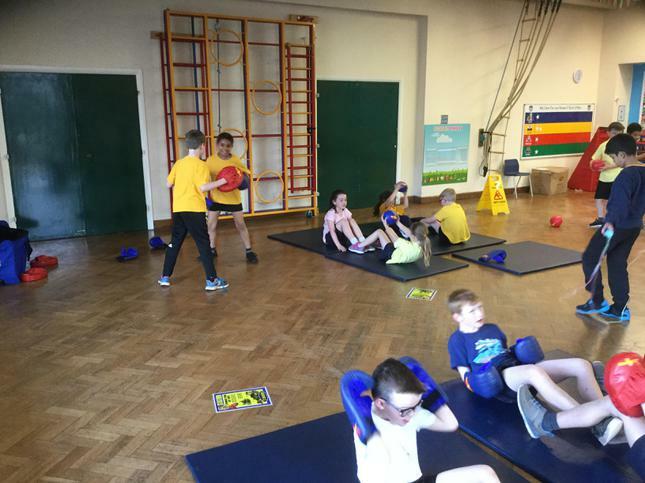 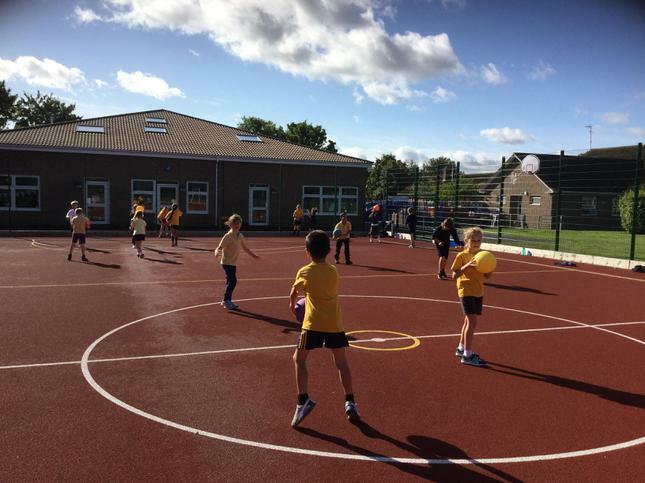 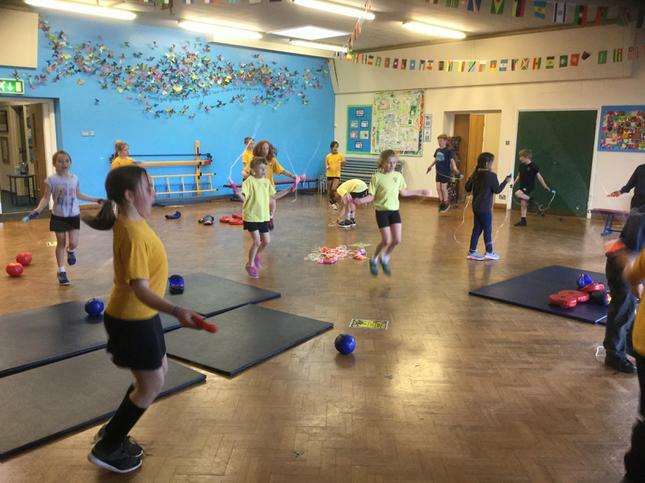 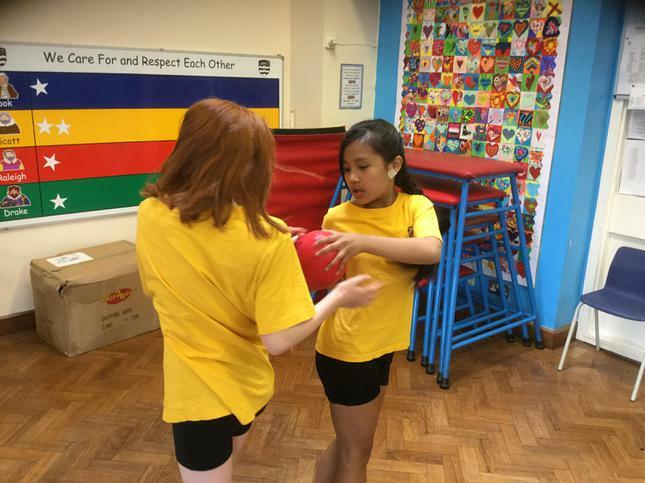 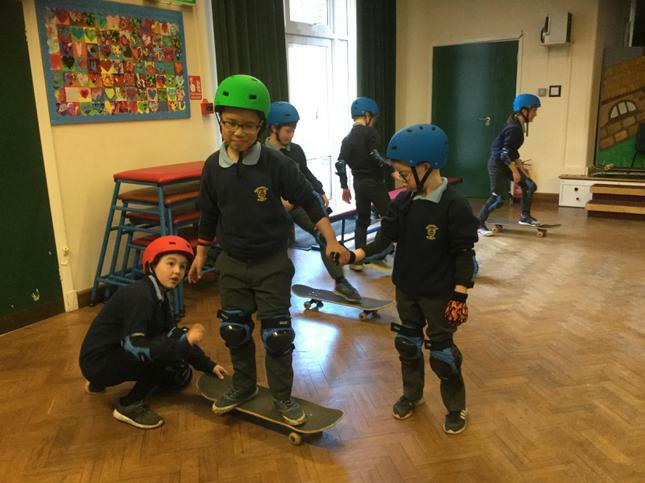 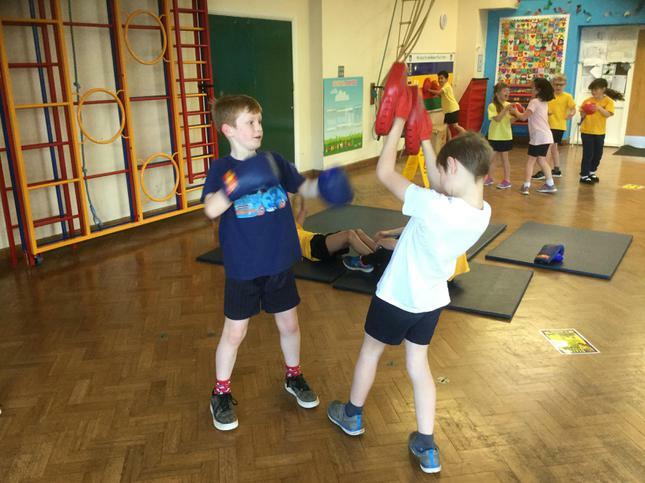 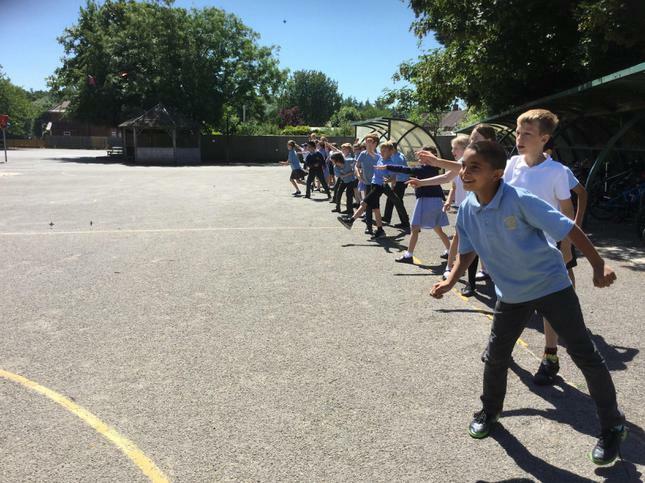 This term we have been improving our fitness during our 'Box 2B Fit' sessions. 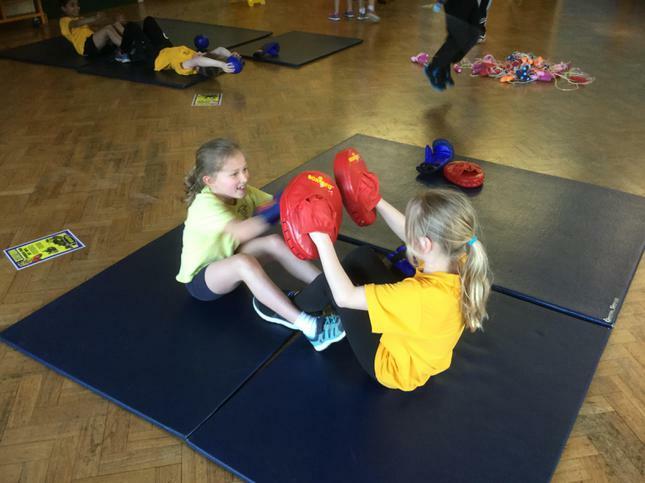 EYE OF THE TIGER! 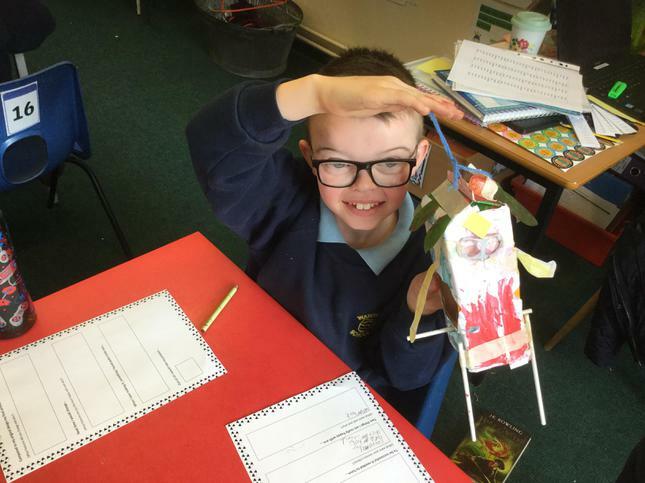 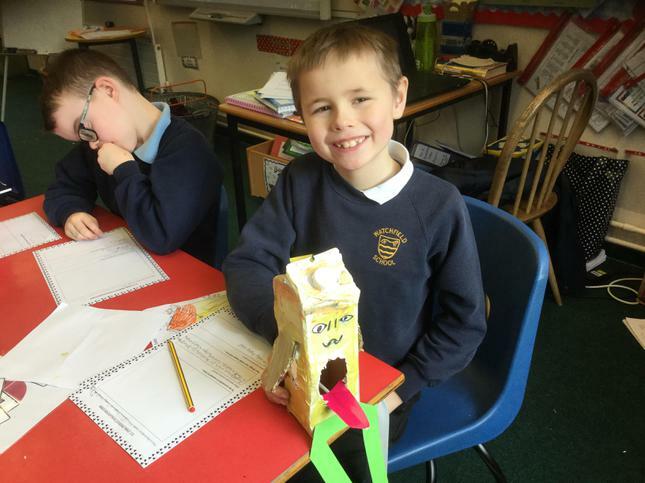 We have enjoyed getting started on our new topic: Robots! 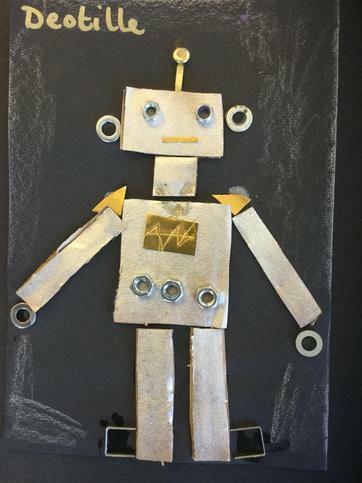 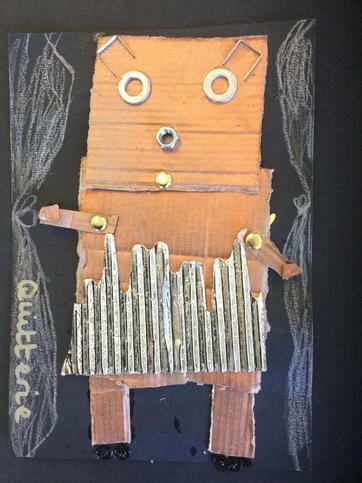 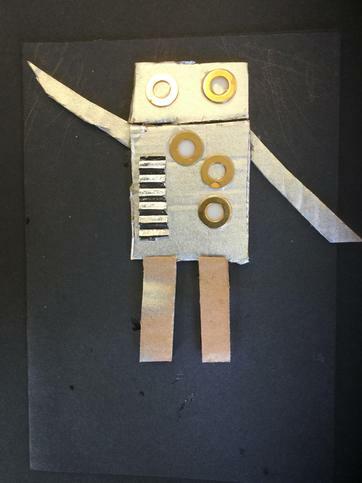 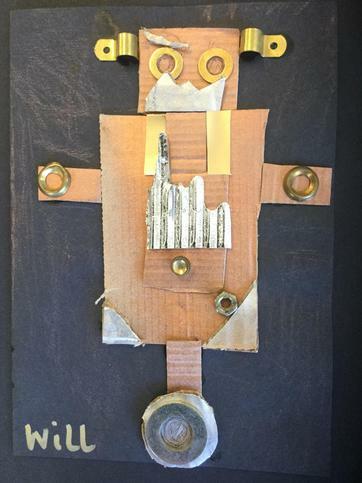 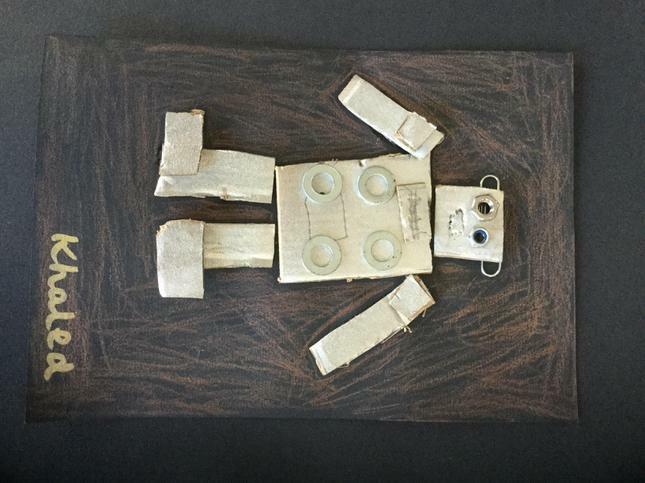 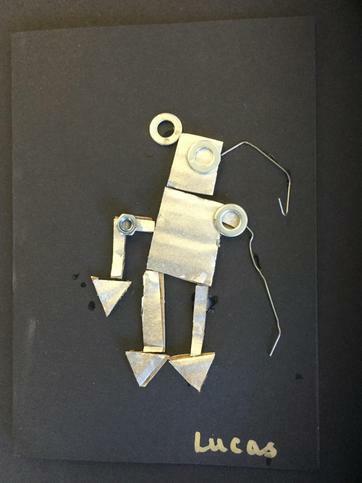 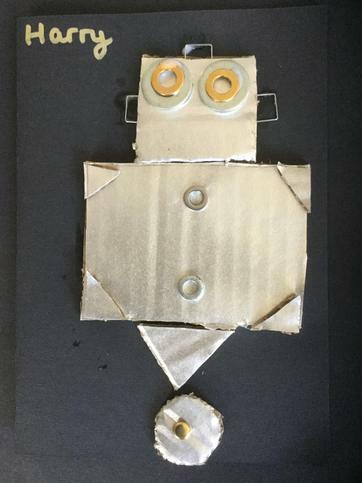 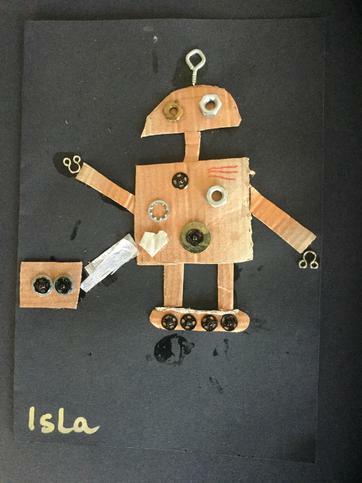 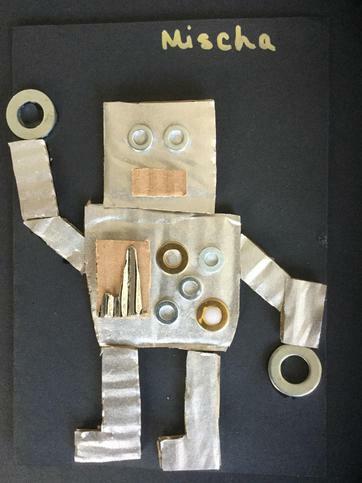 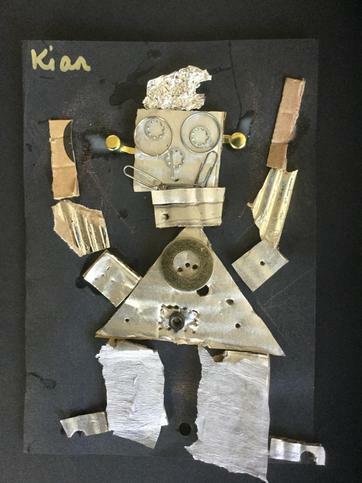 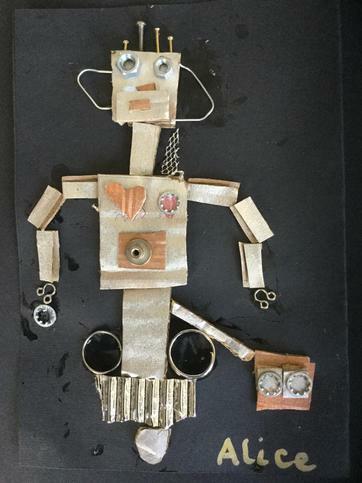 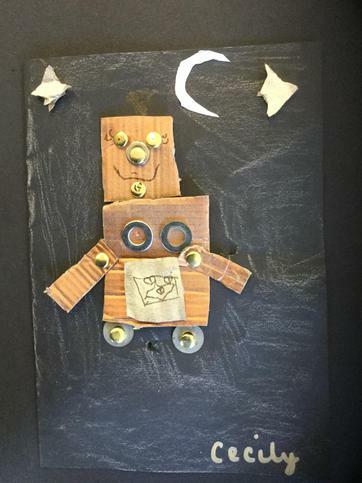 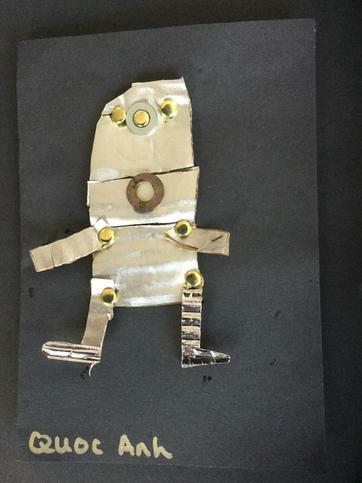 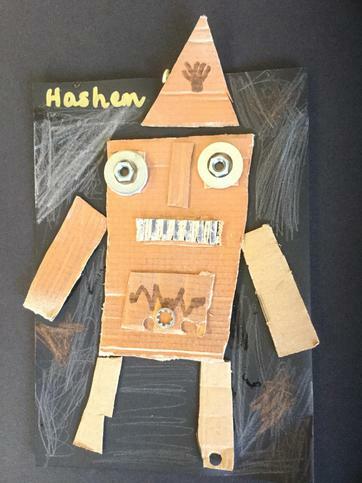 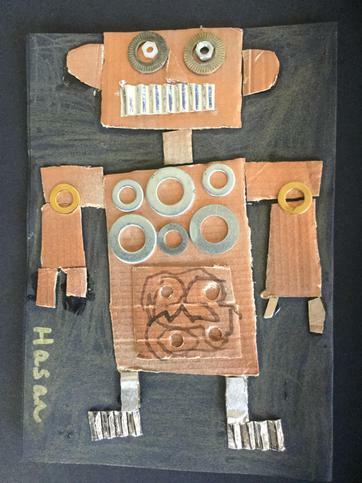 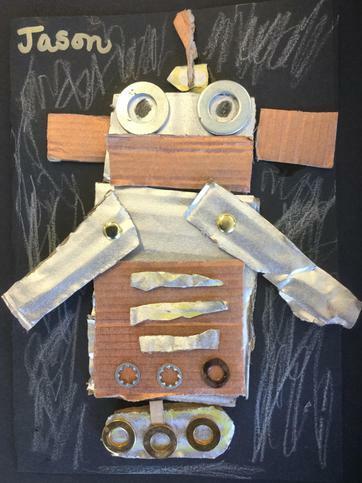 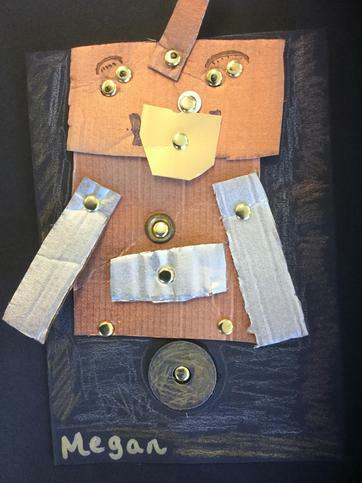 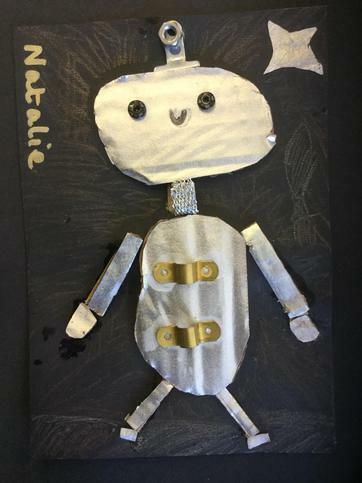 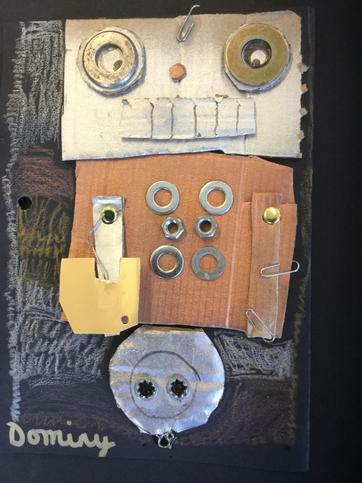 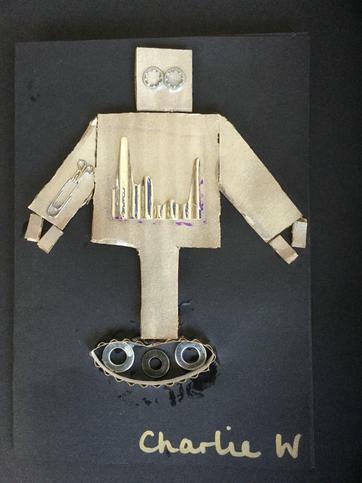 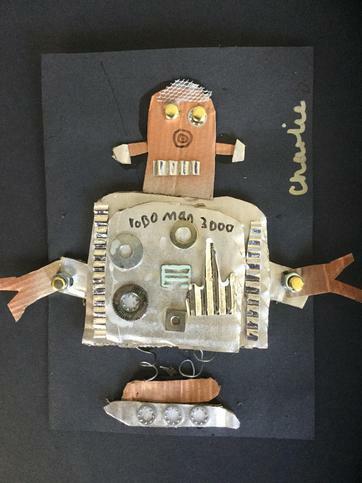 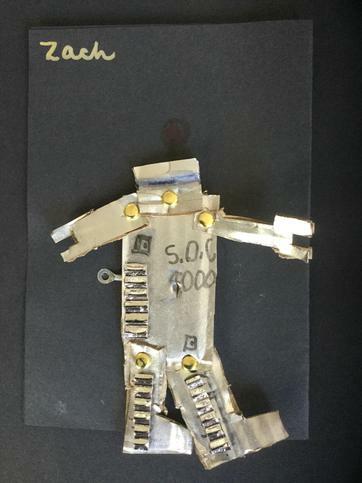 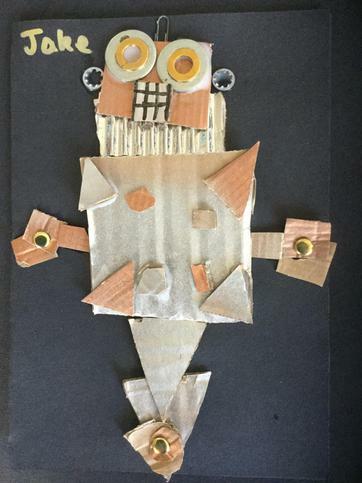 We are pretty pleased with these awesome mixed media robot collages we made! 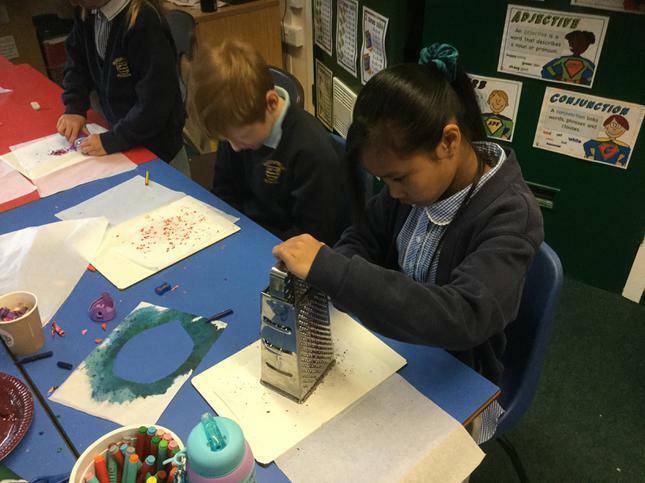 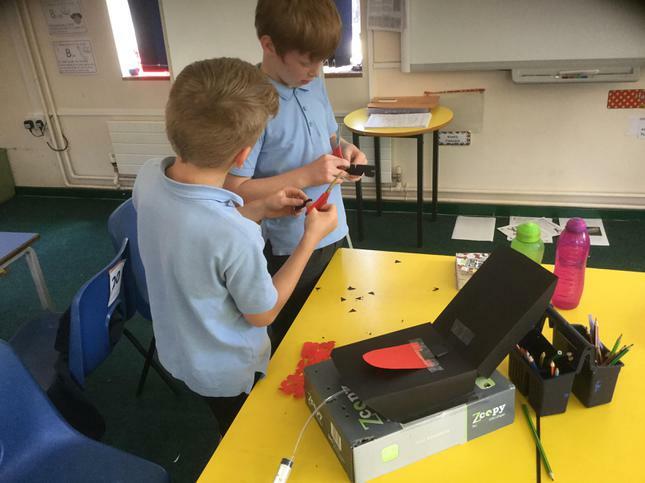 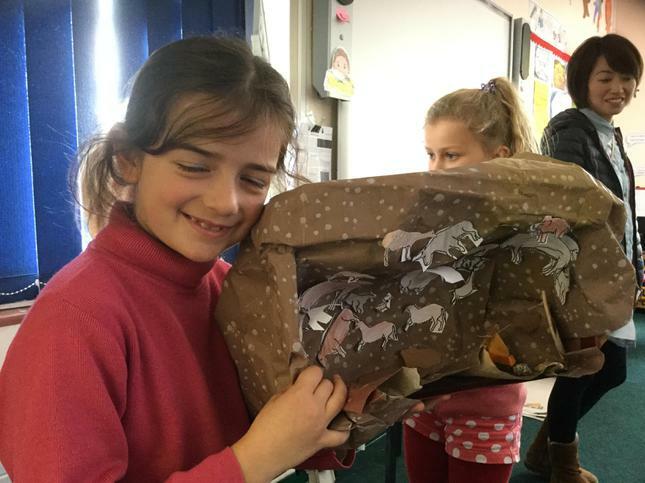 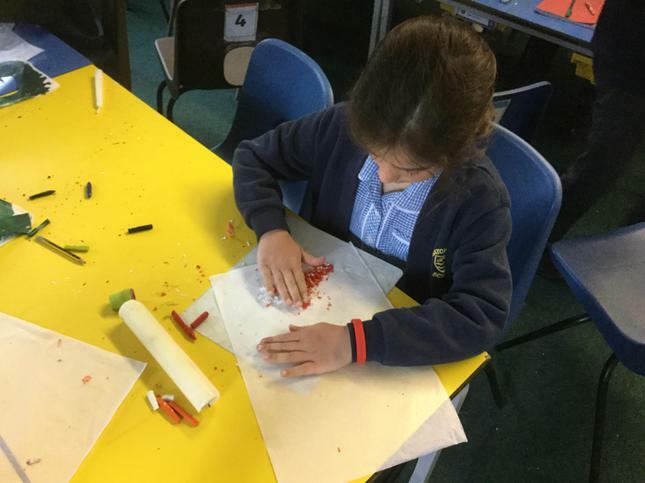 in DT we have been recycling and reusing to help reduce the waste on our planet. 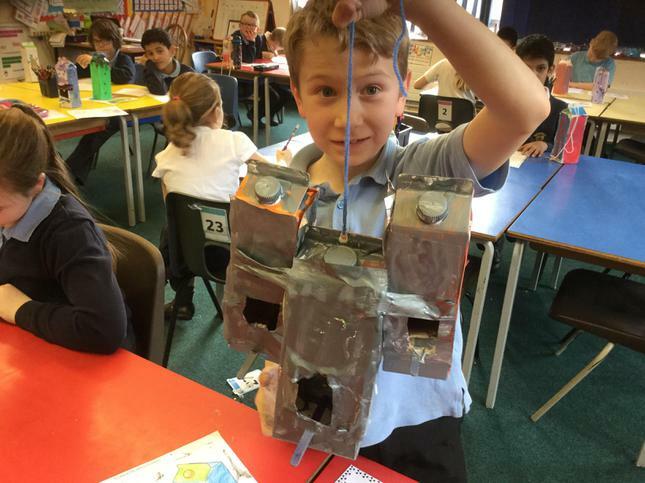 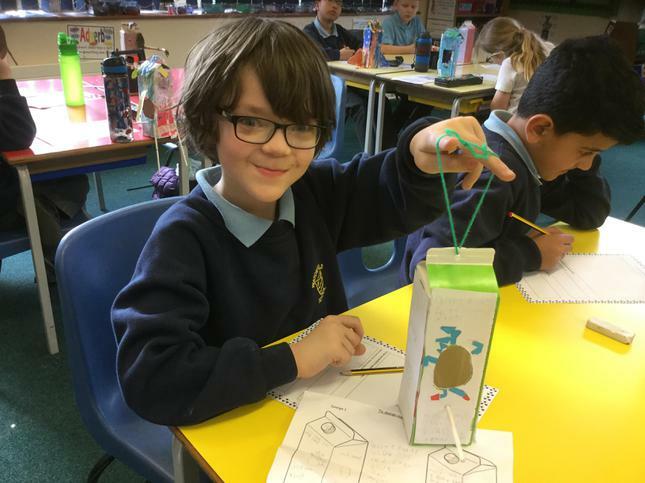 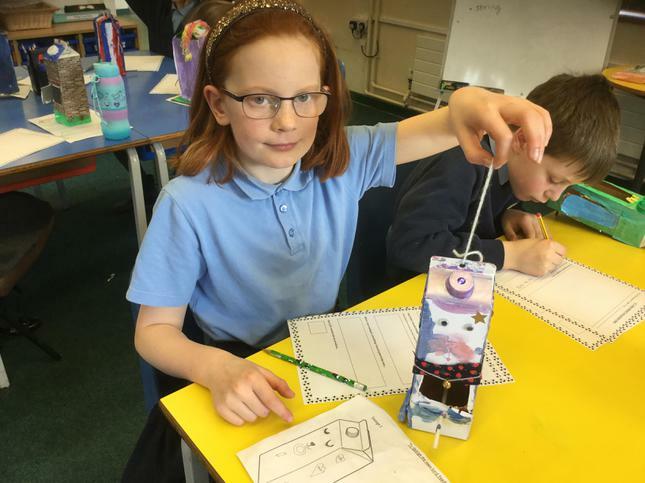 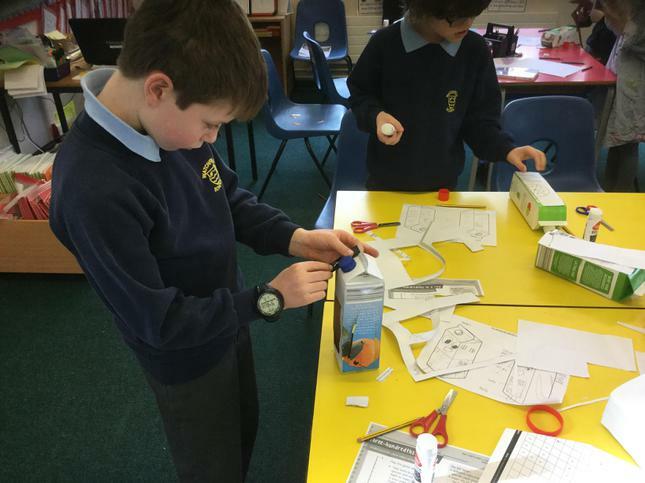 We each turned an old juice carton into a beautiful bird feeder! 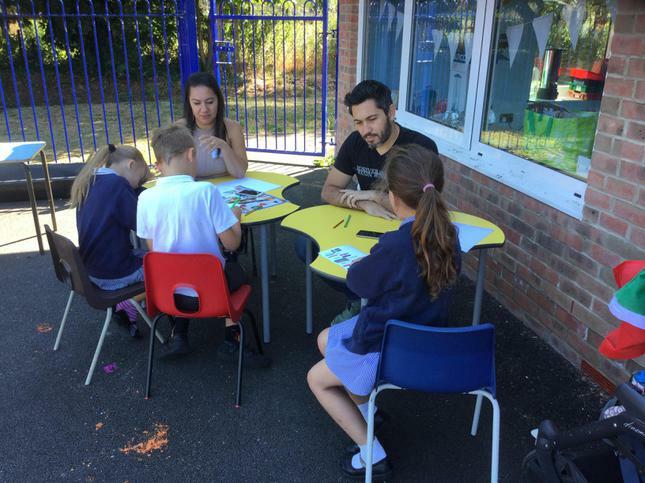 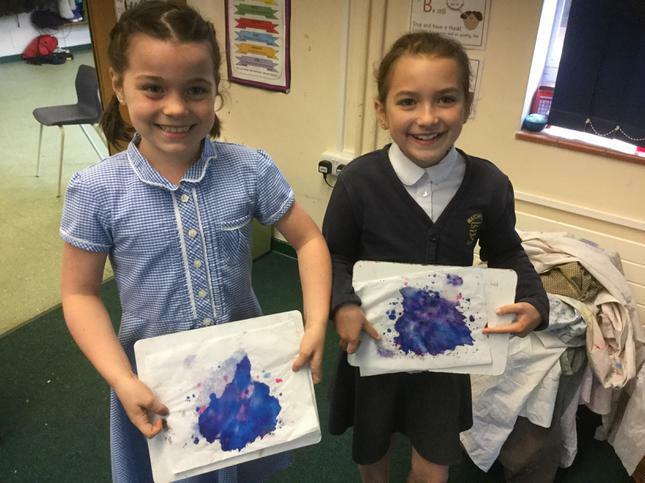 We had fun, got rather messy and had some very creative ideas! 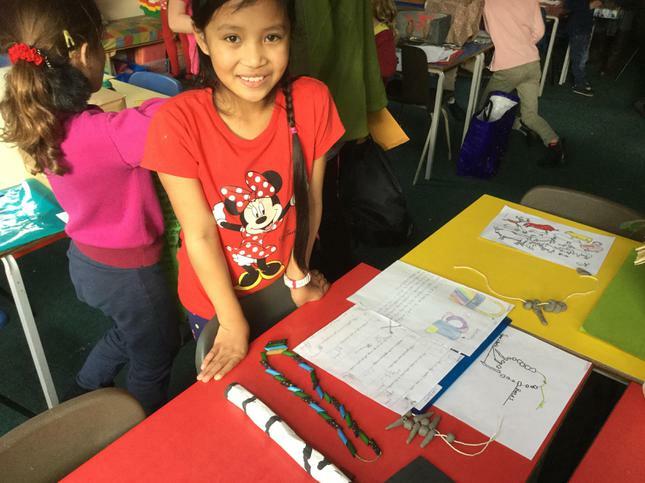 We had a great time during STEM week. 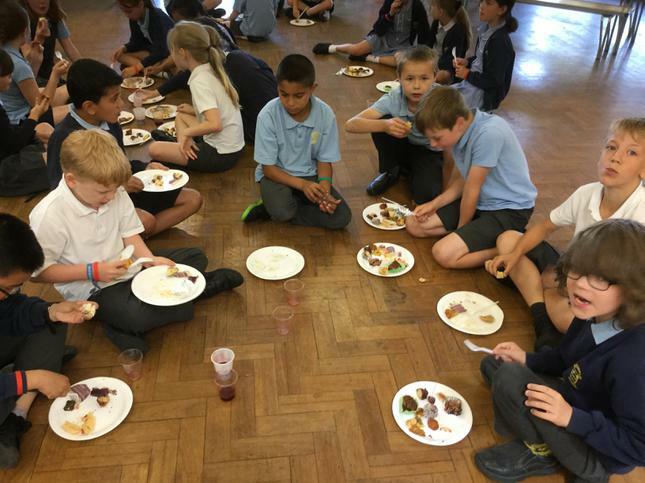 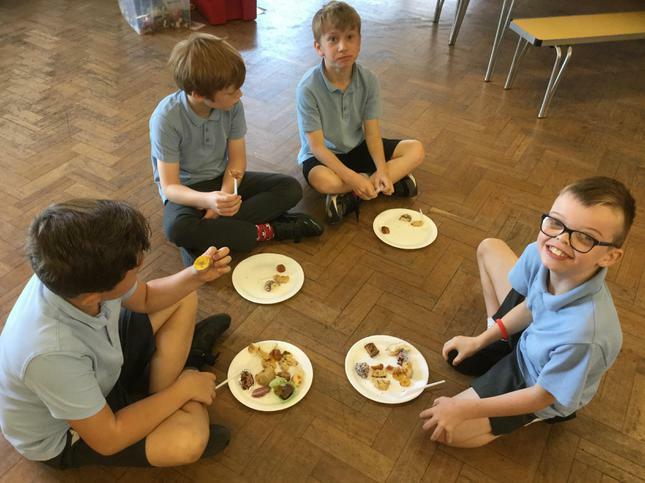 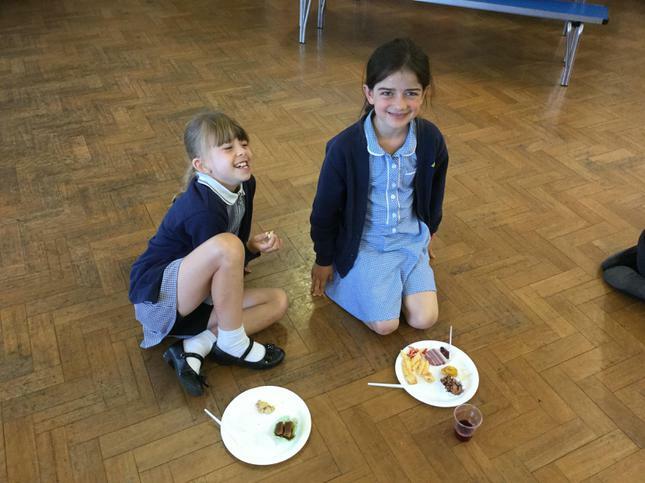 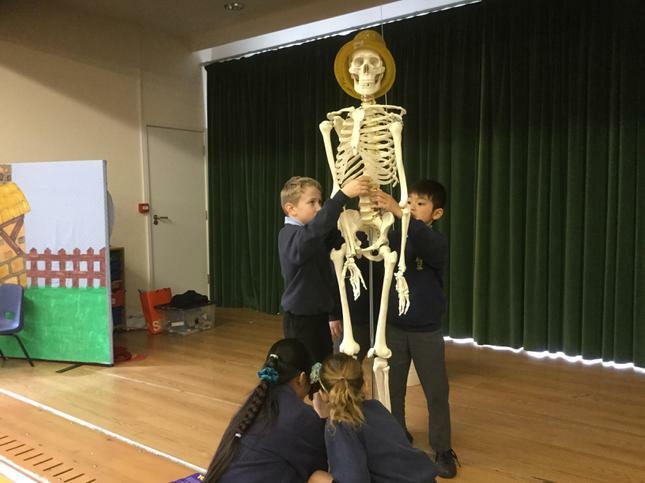 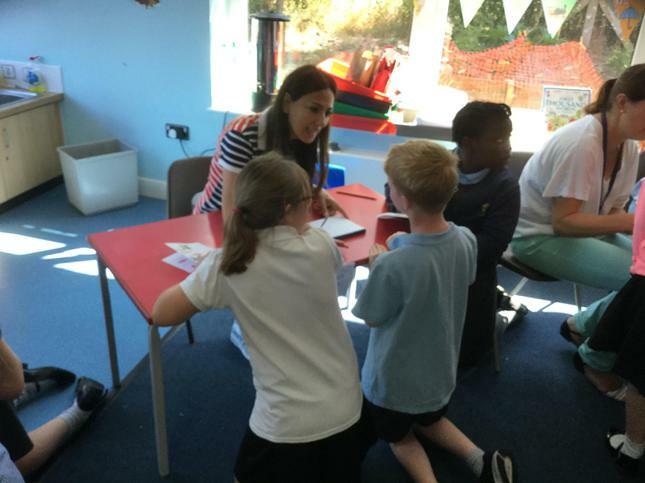 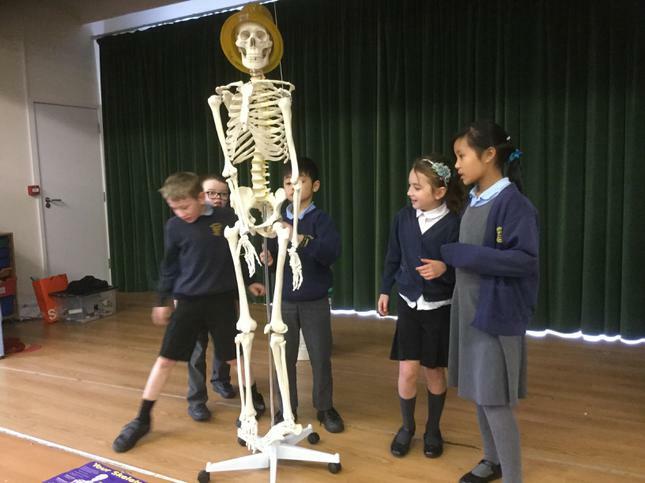 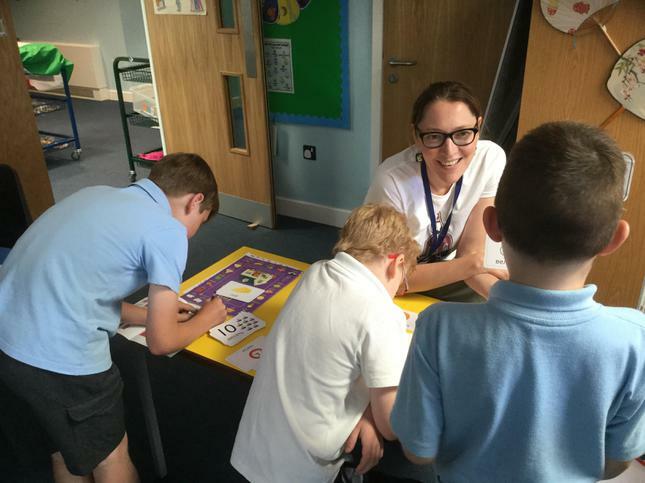 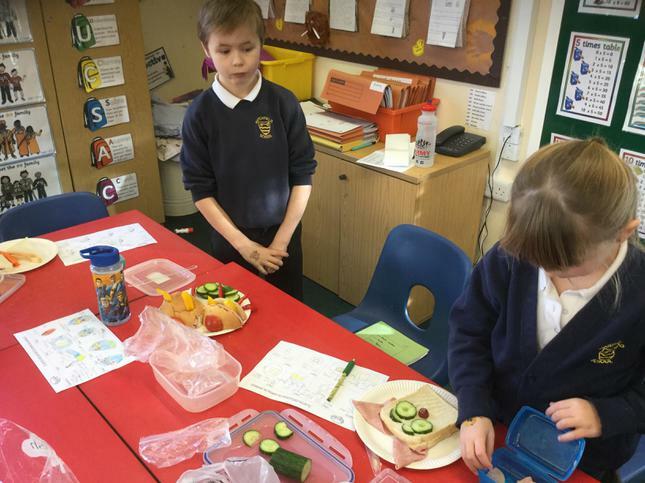 We investigated the importance of healthy eating and exercise for our bodies to help us answer the question: Should we eat chocolate for breakfast? 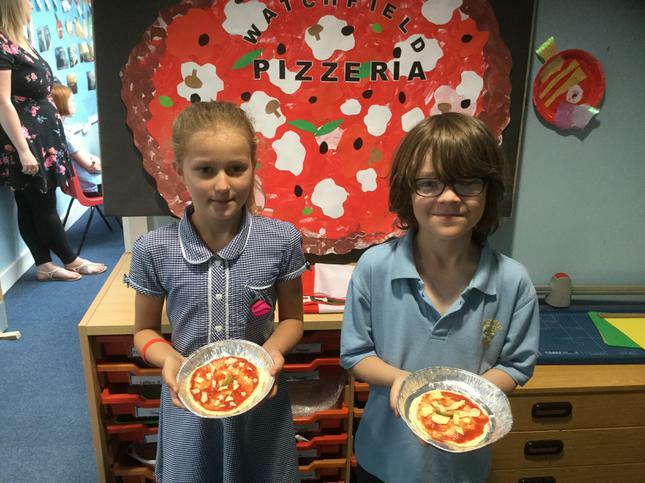 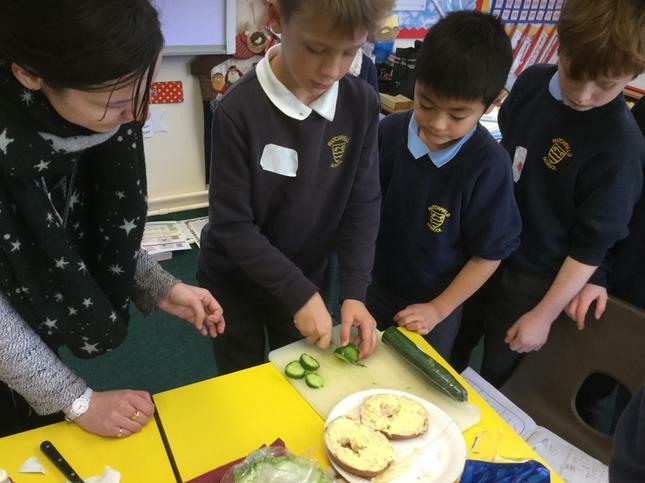 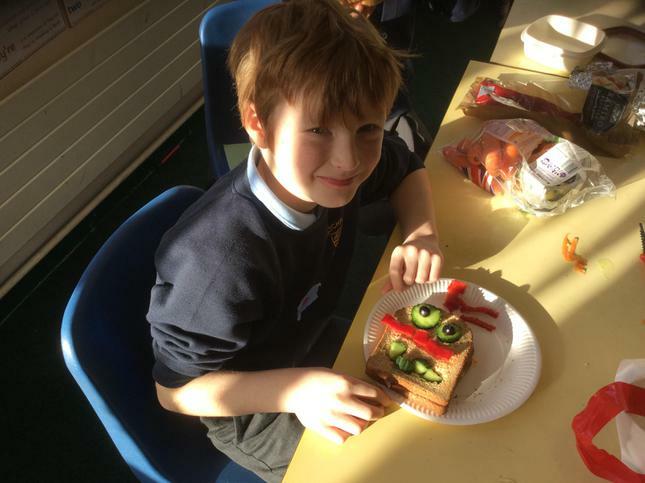 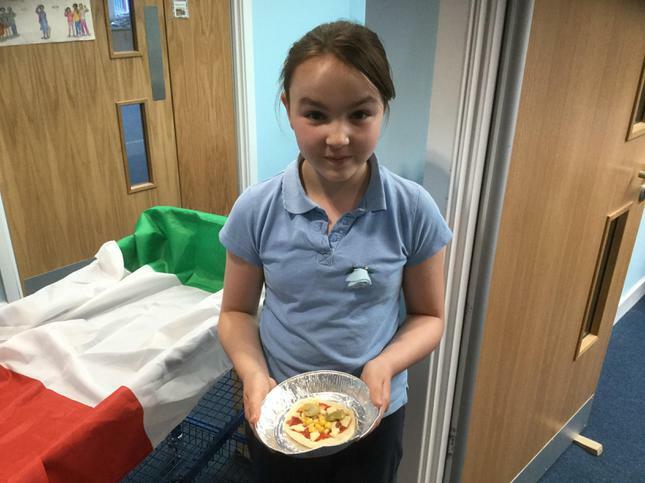 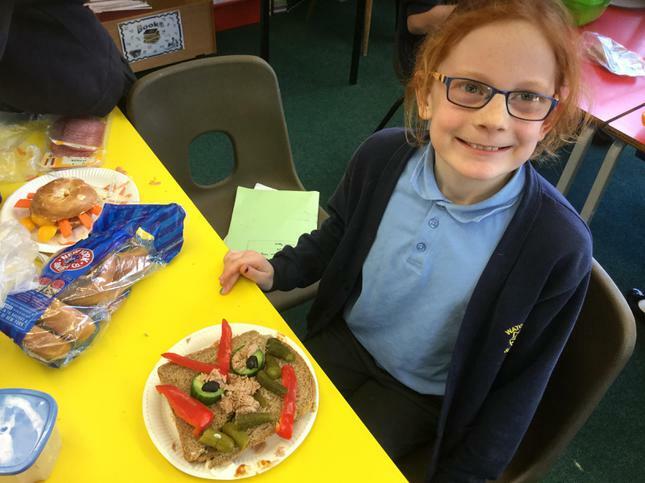 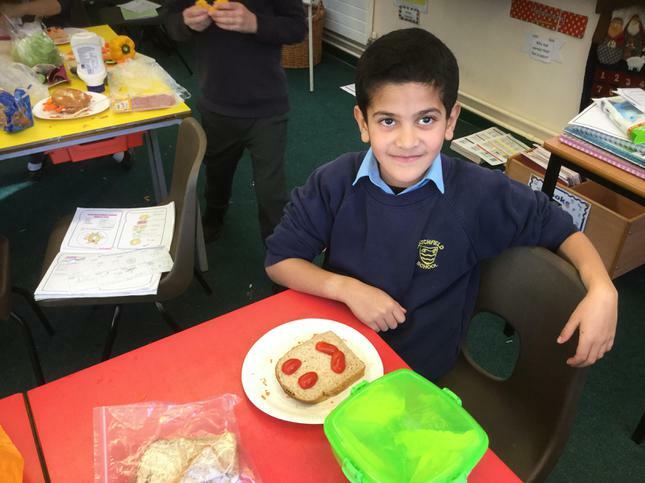 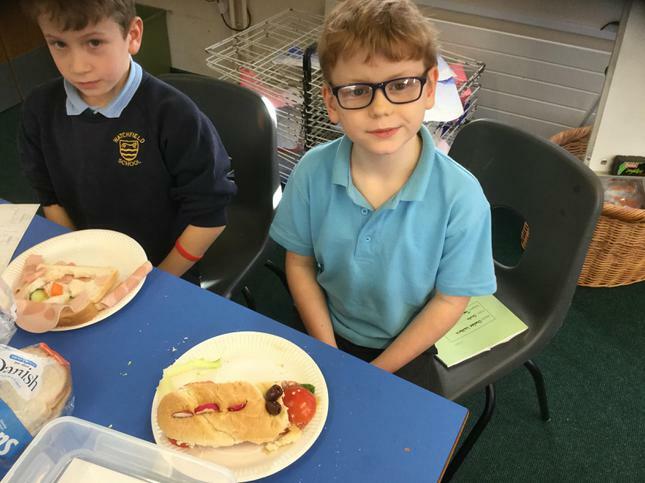 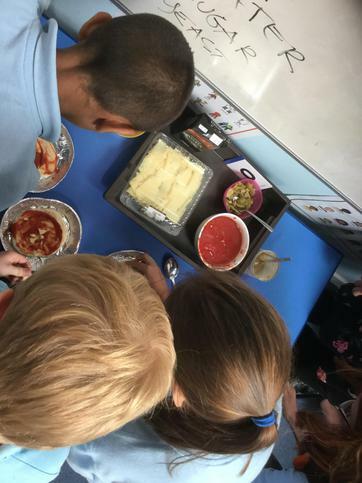 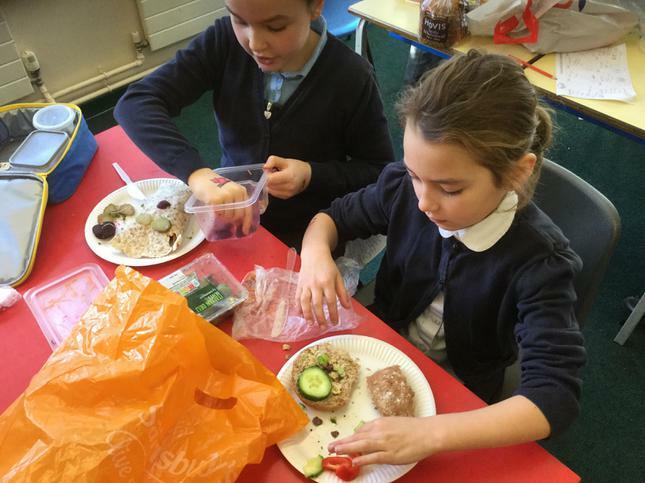 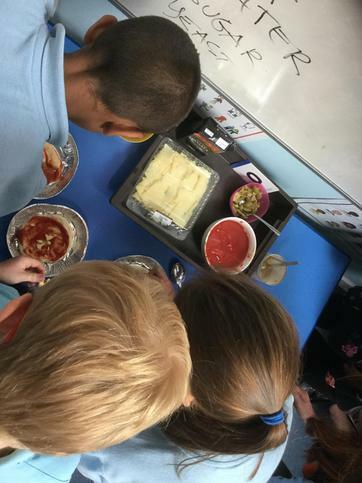 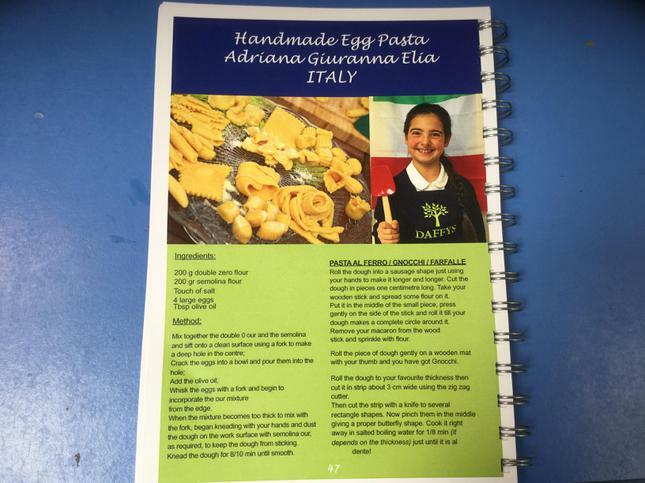 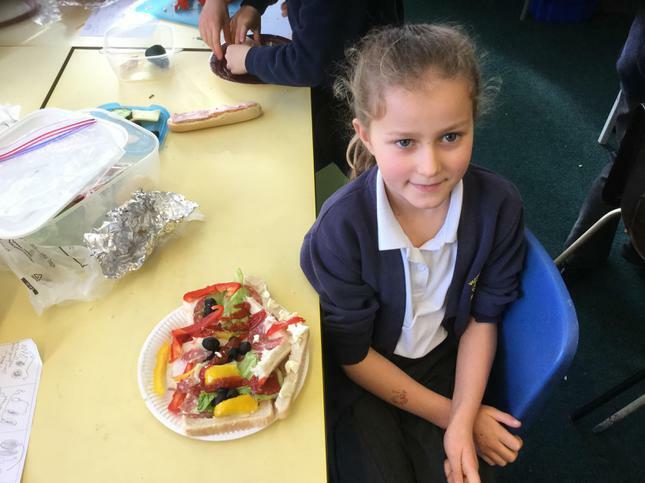 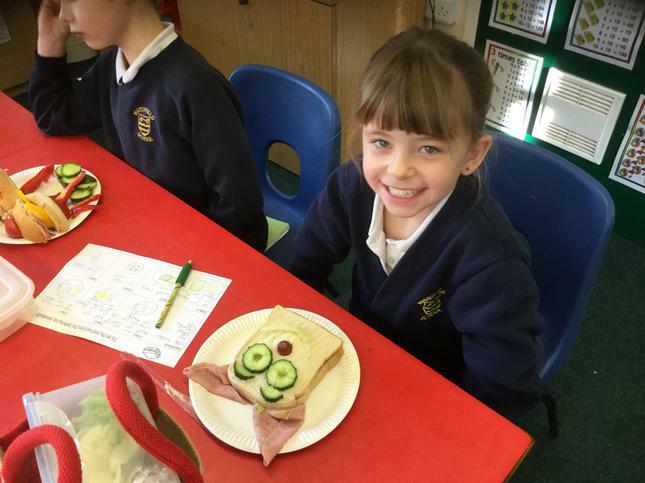 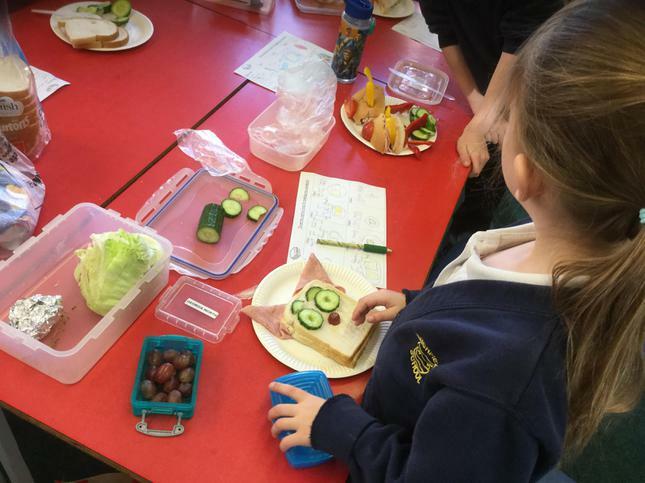 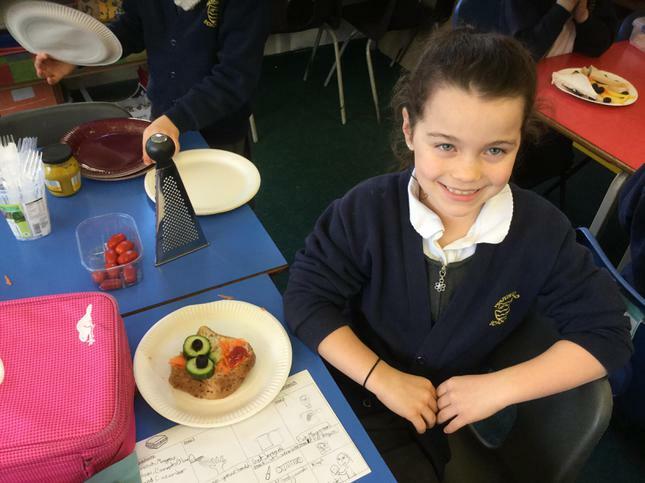 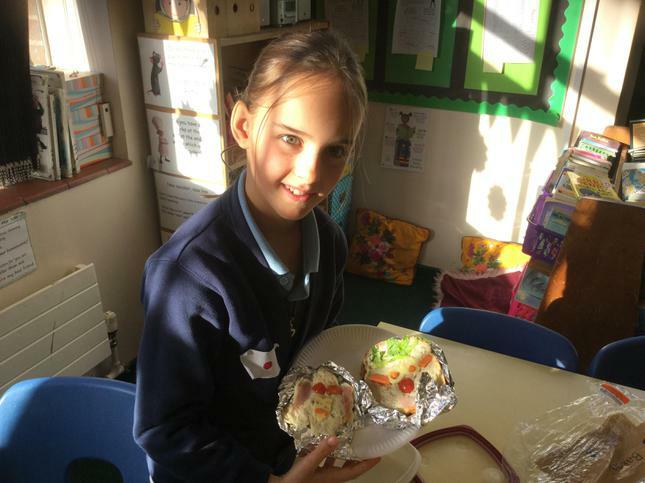 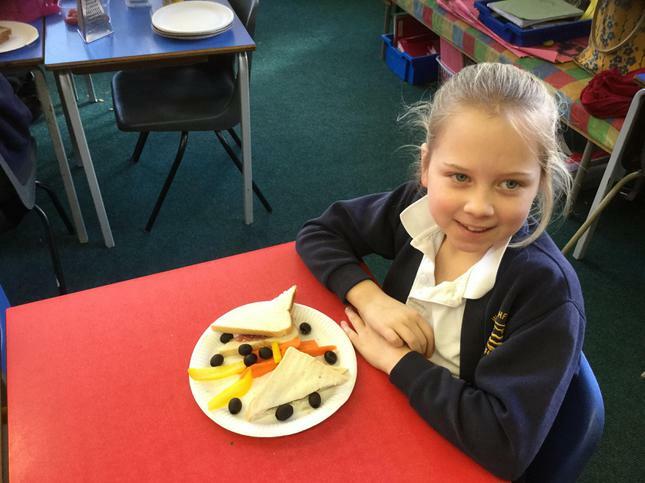 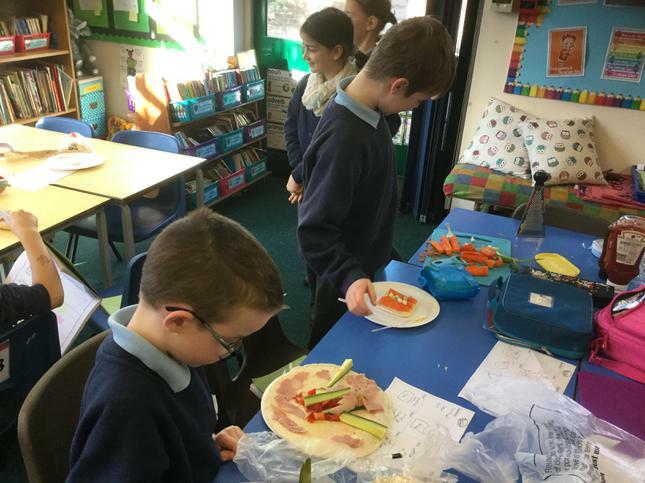 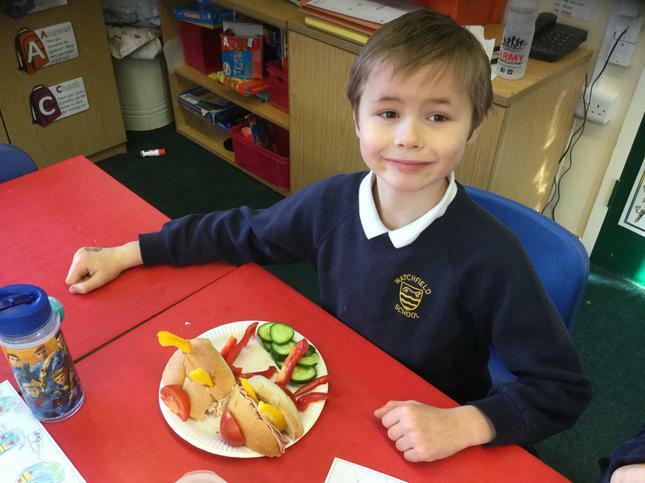 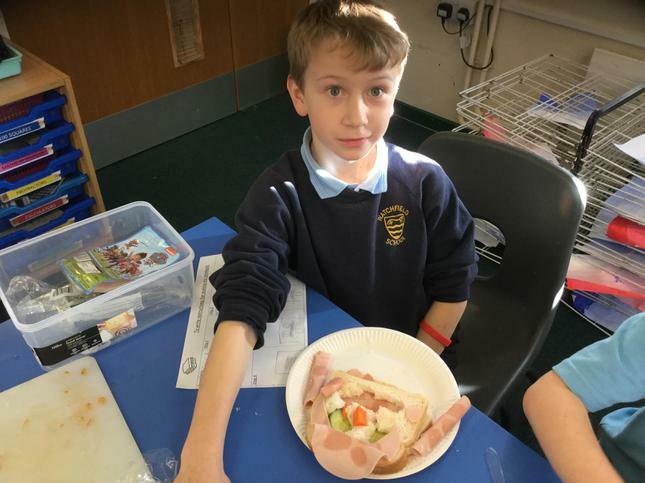 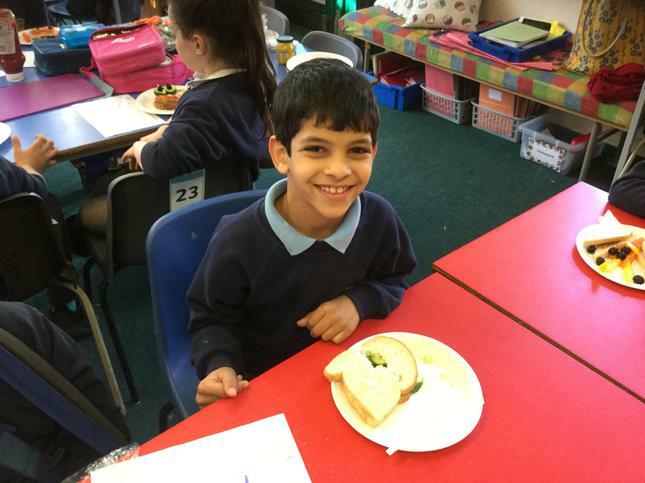 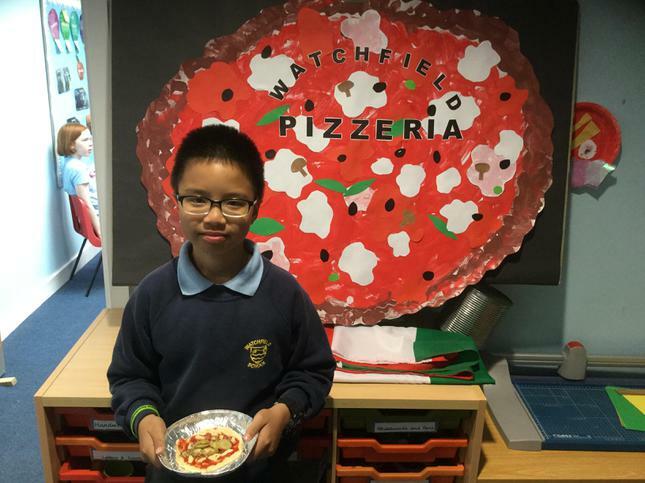 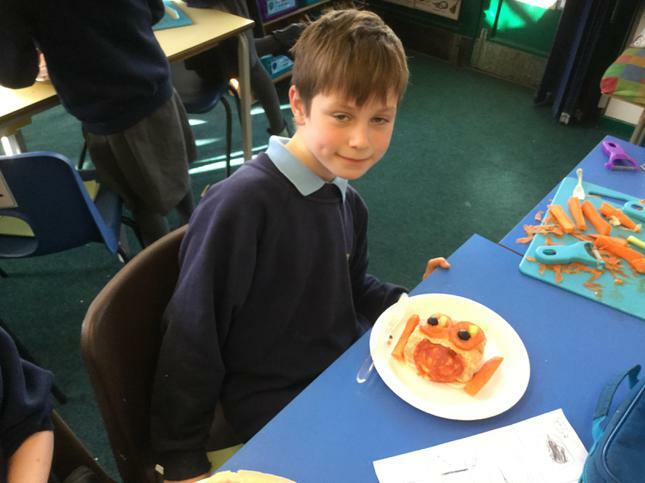 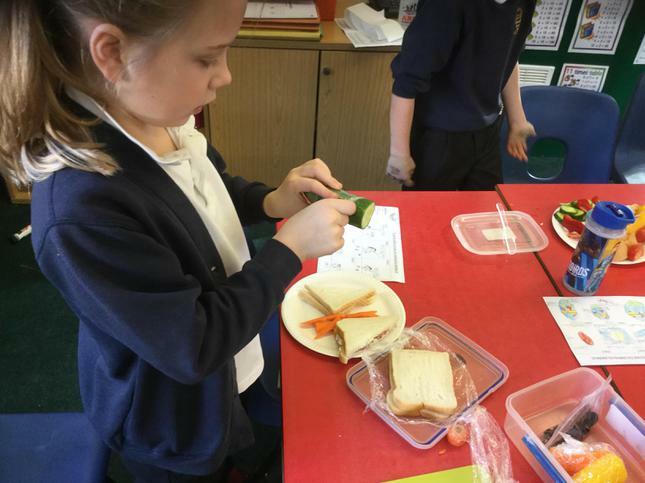 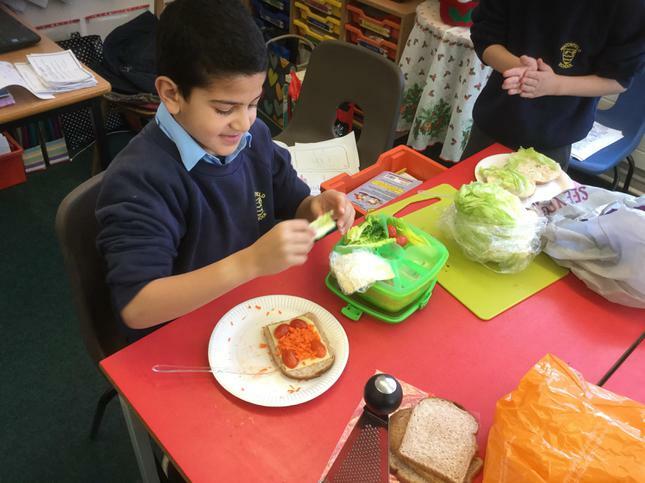 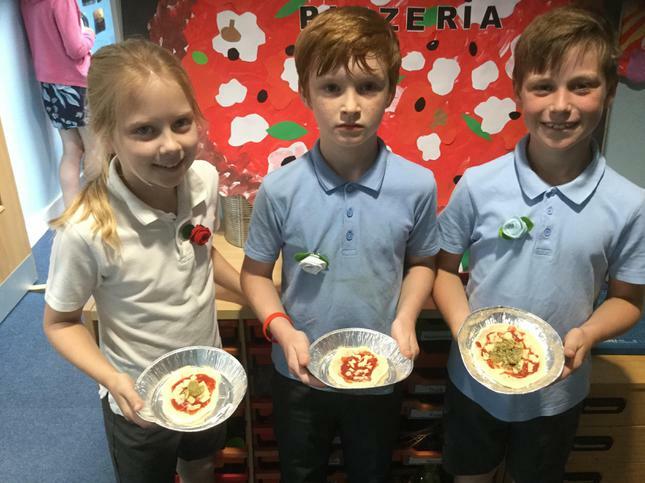 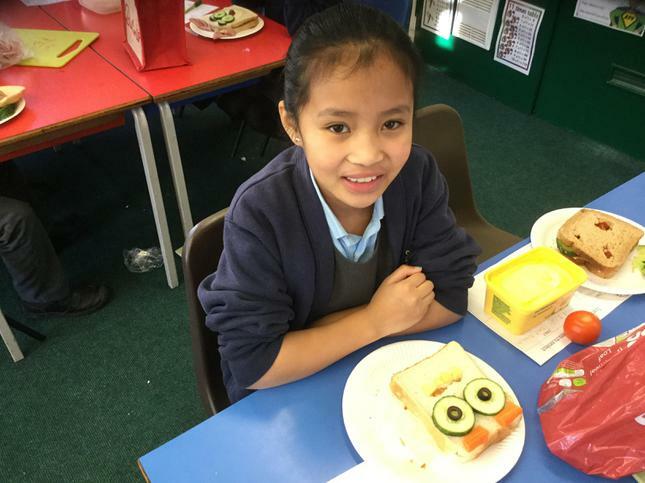 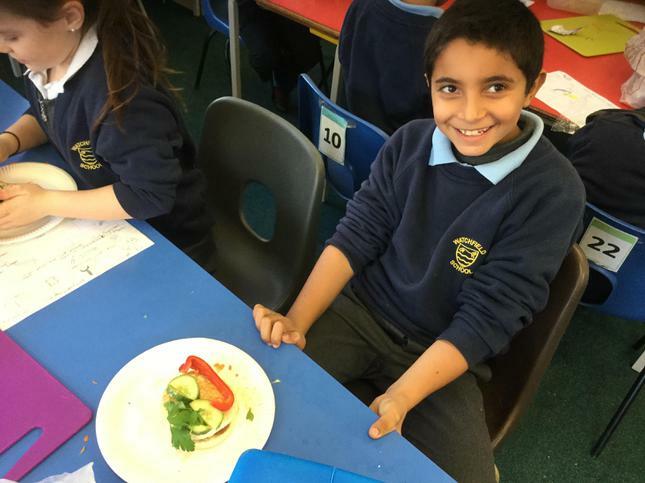 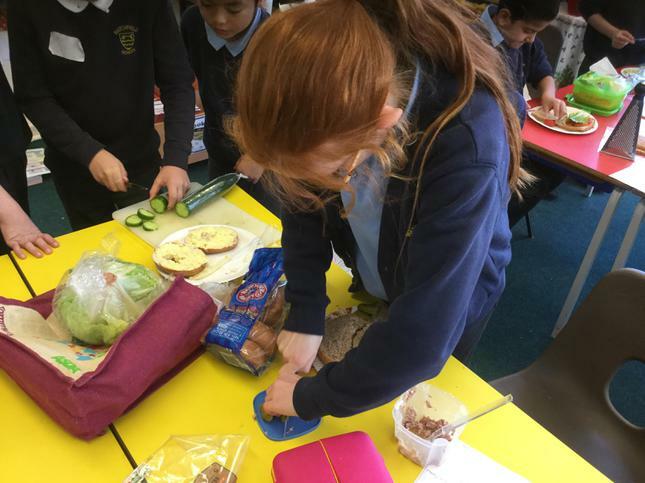 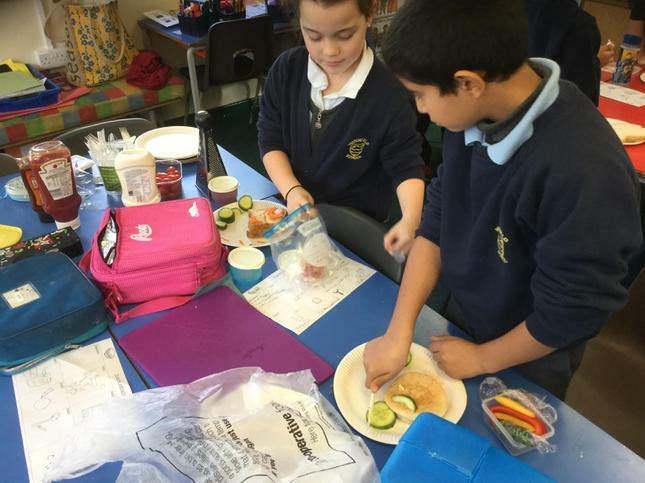 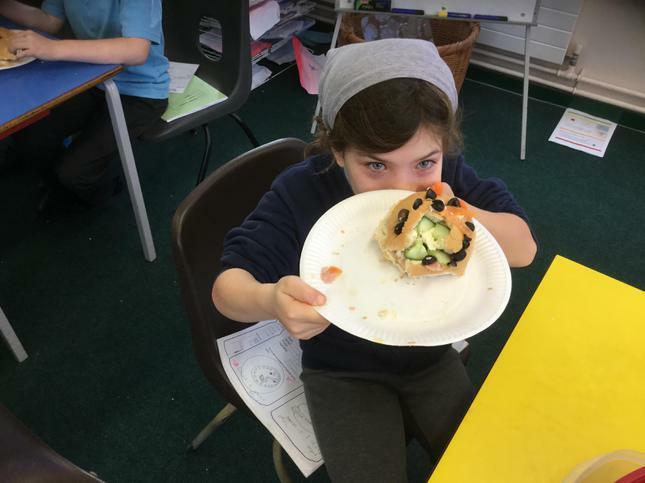 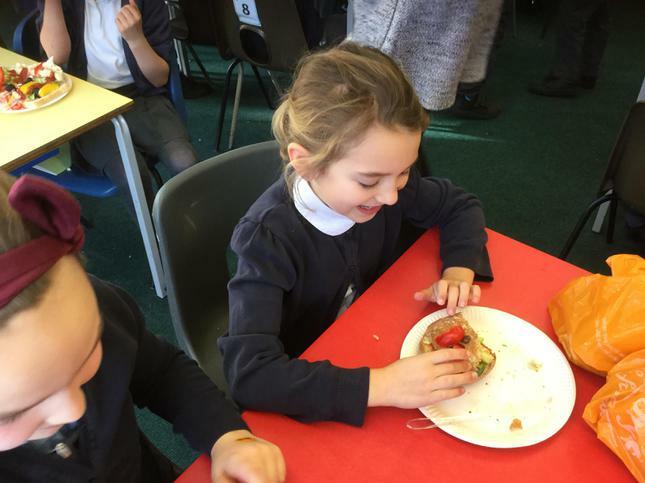 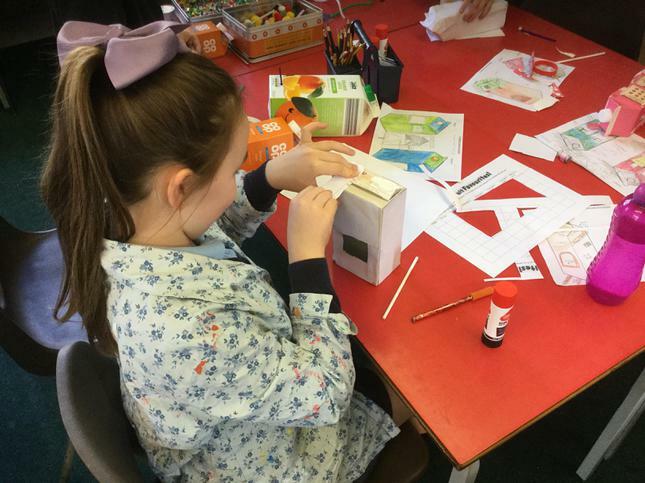 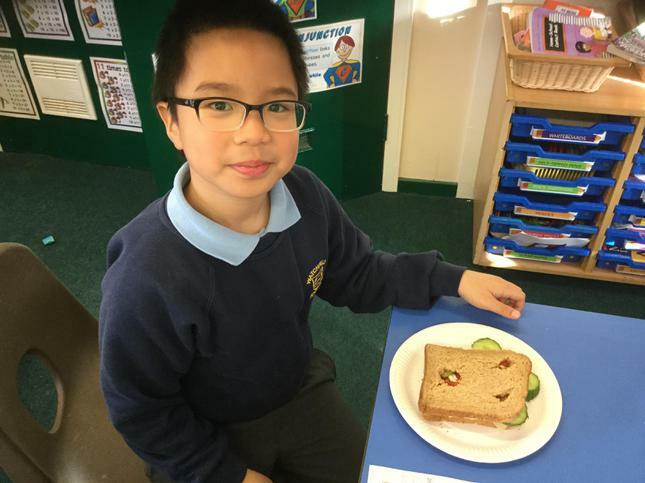 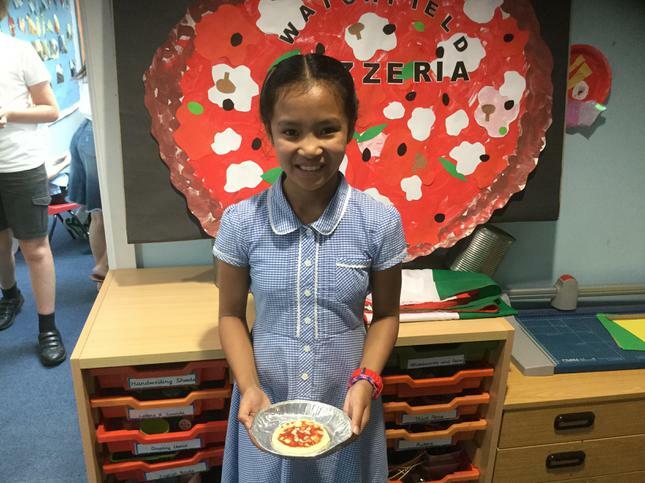 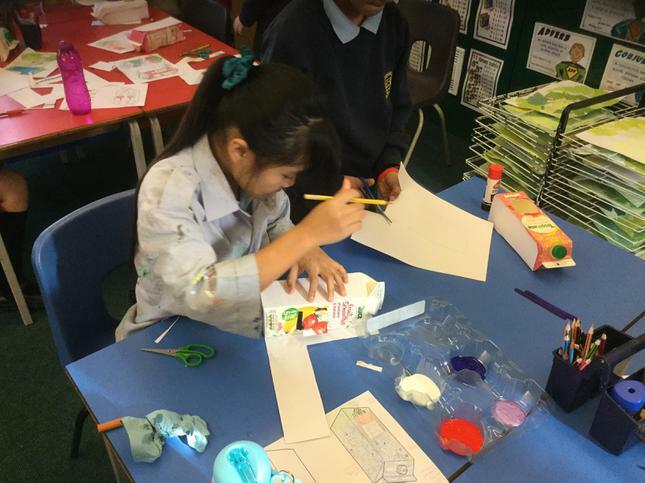 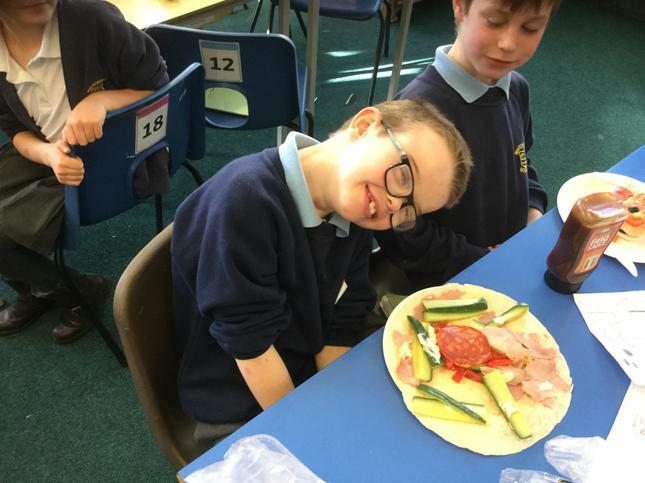 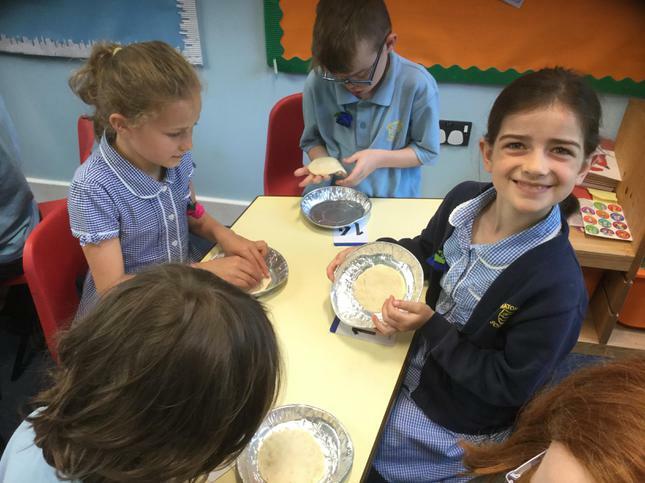 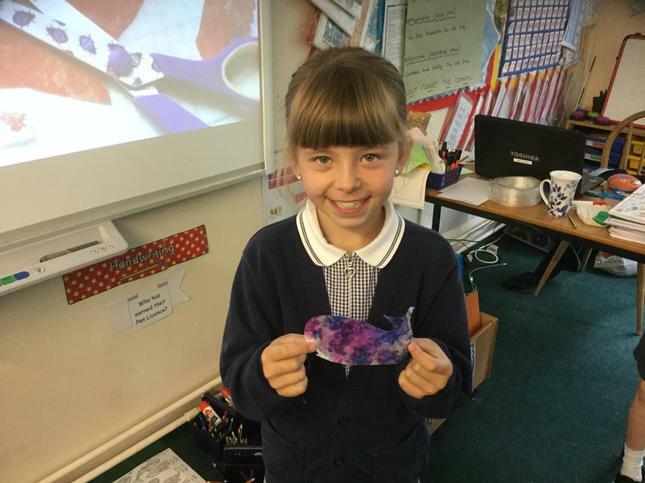 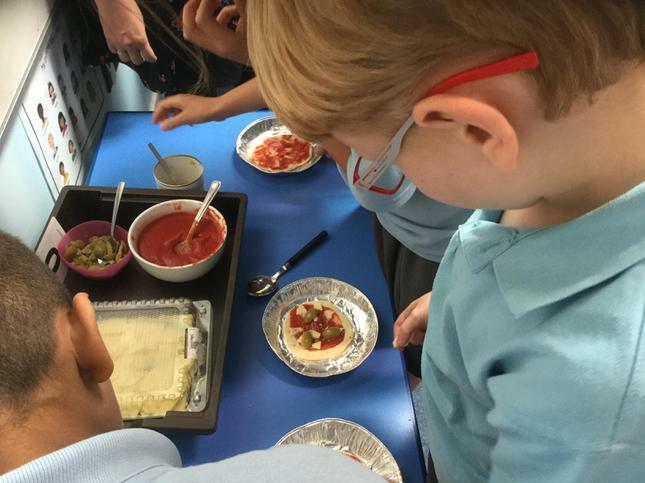 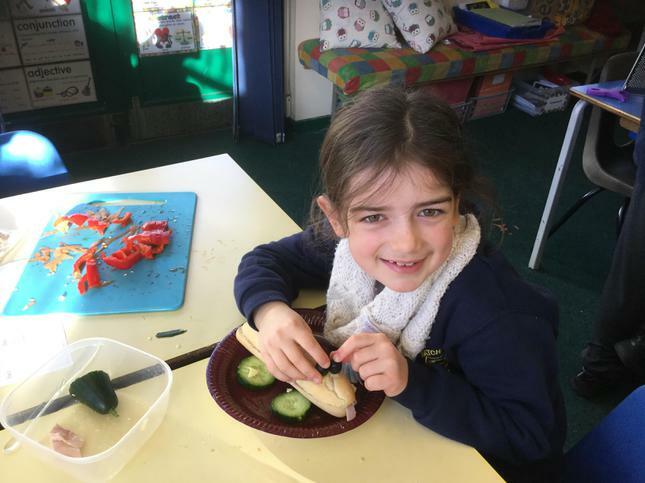 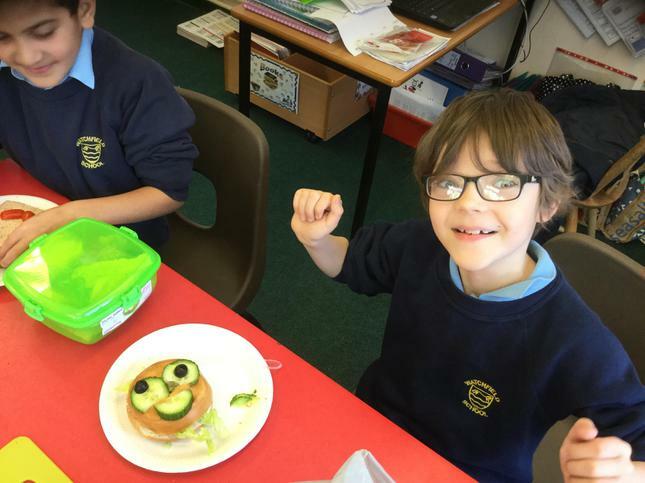 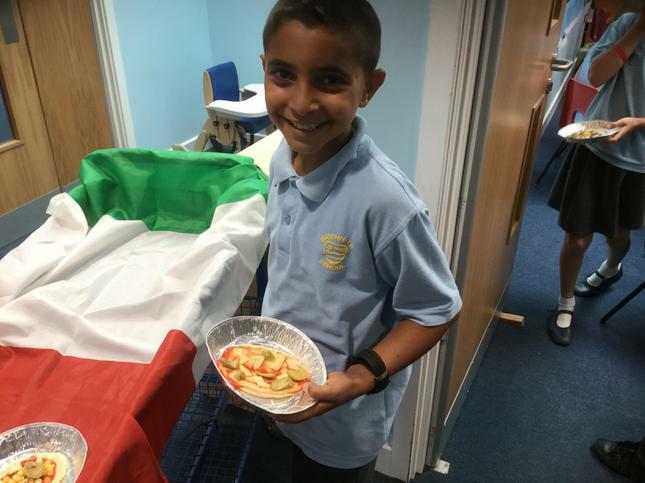 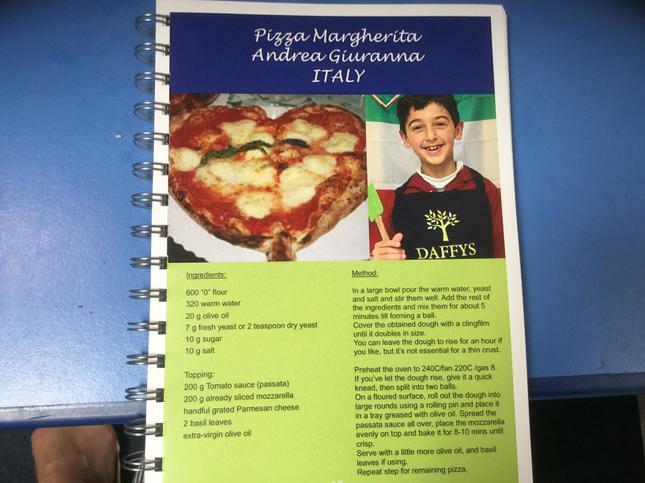 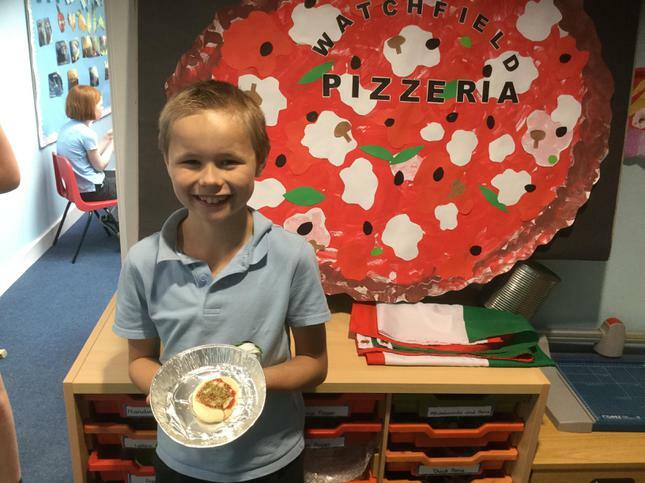 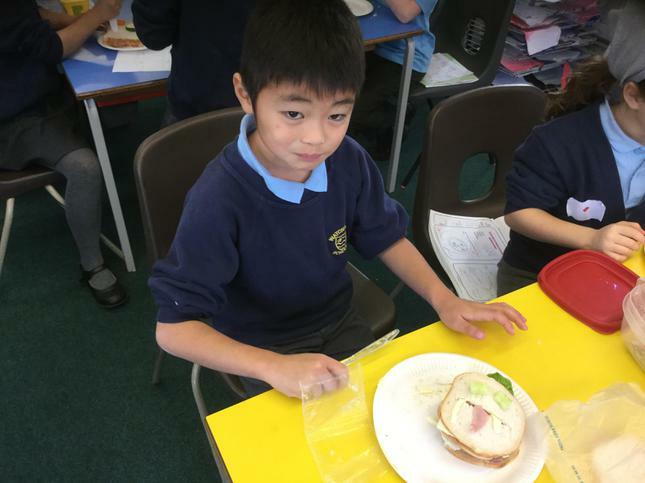 In DT we designed and made sandwich snacks which would encourage younger children to eat healthily and try new vegetables. 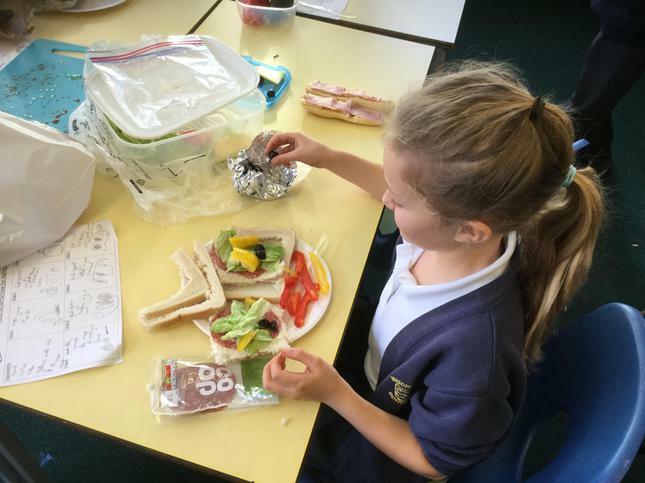 Our sandwich designs we very creative and very yummy! 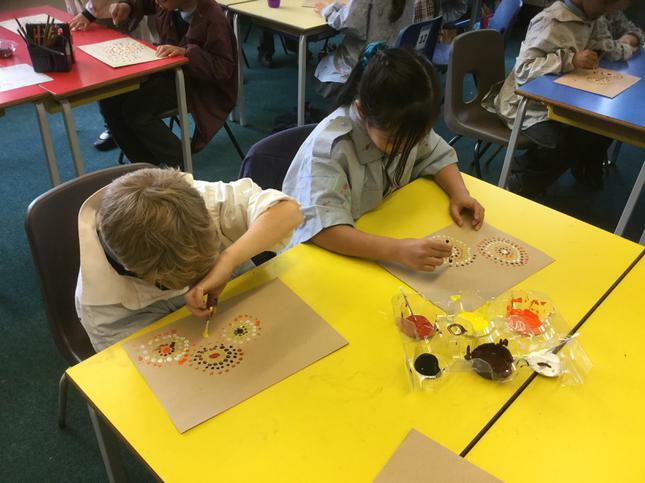 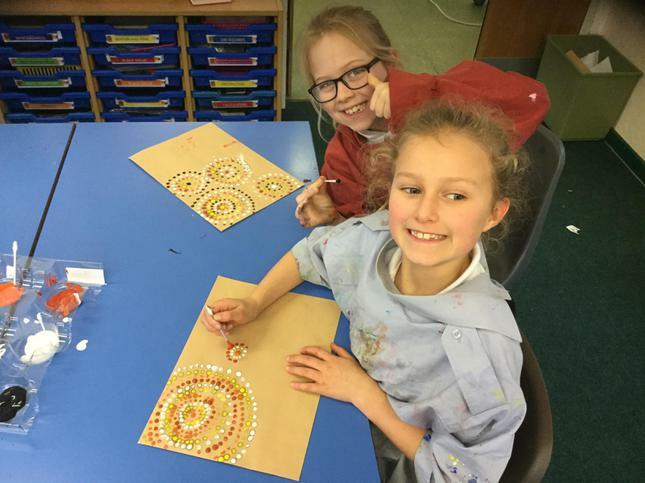 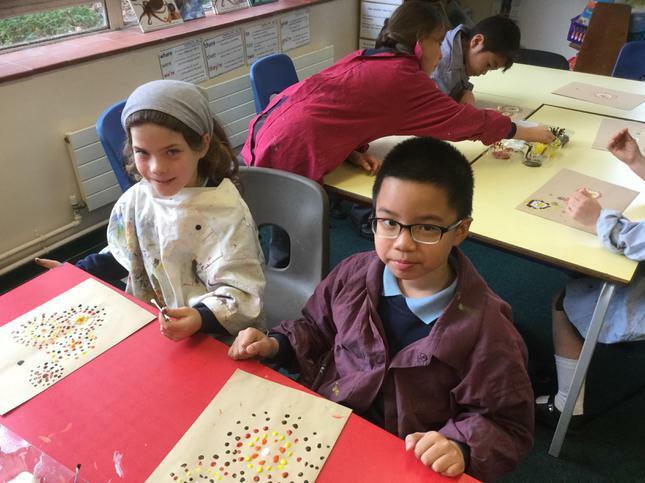 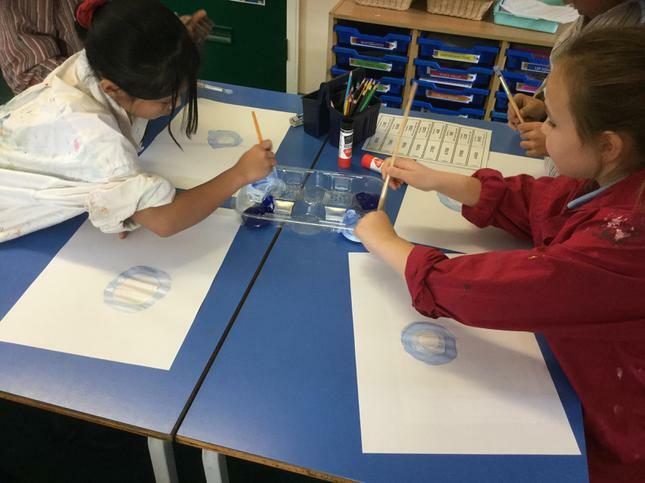 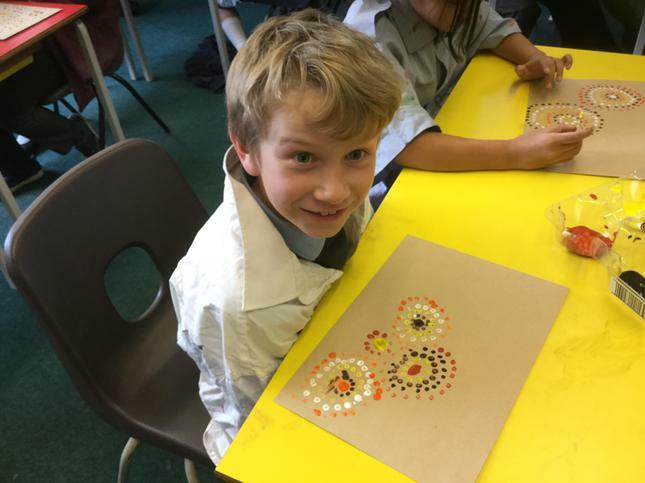 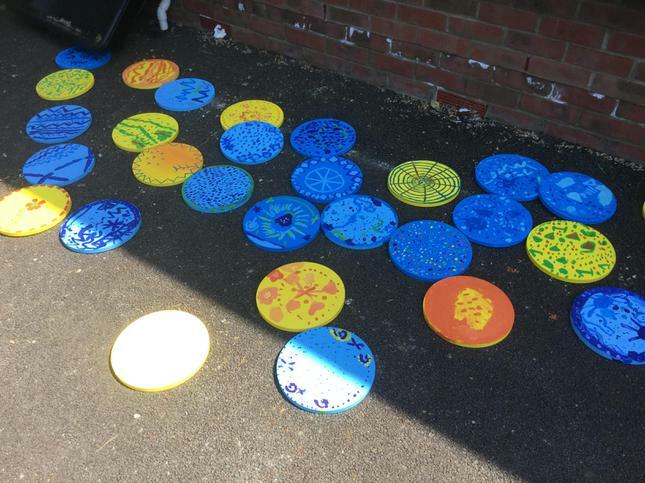 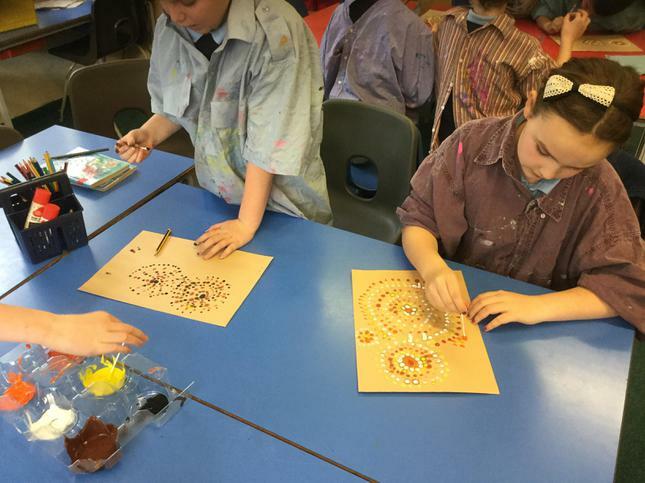 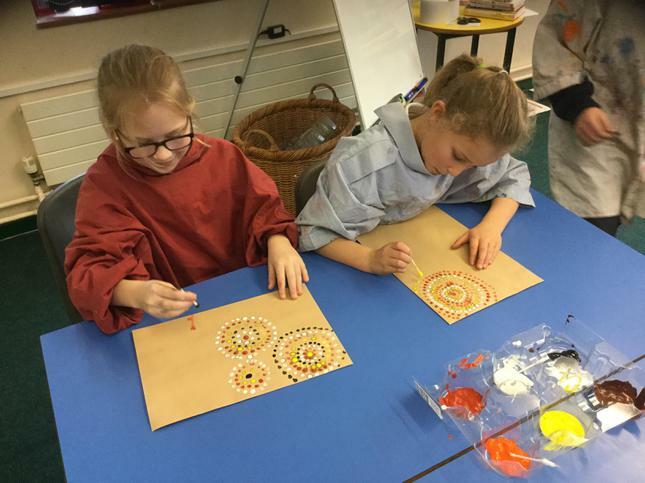 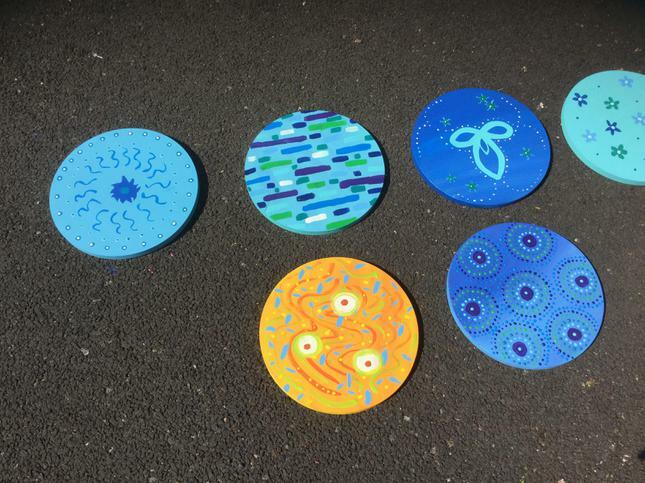 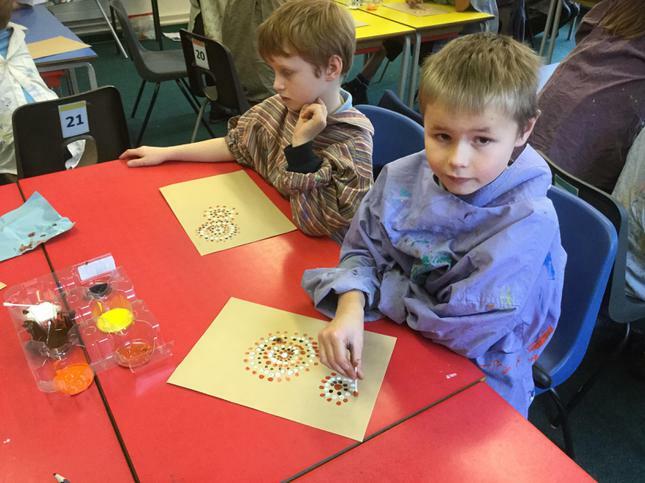 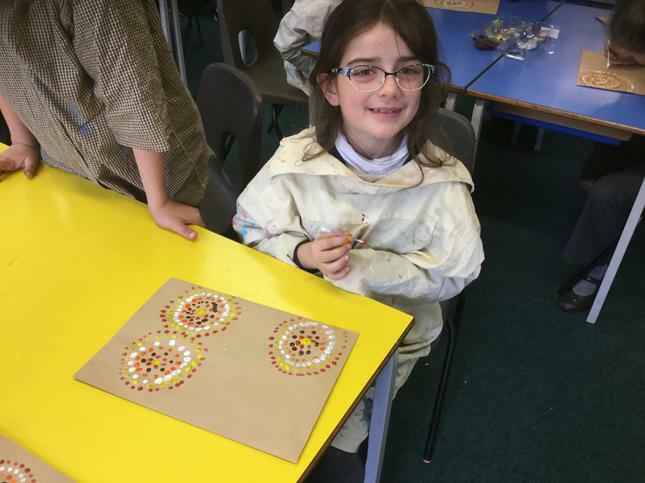 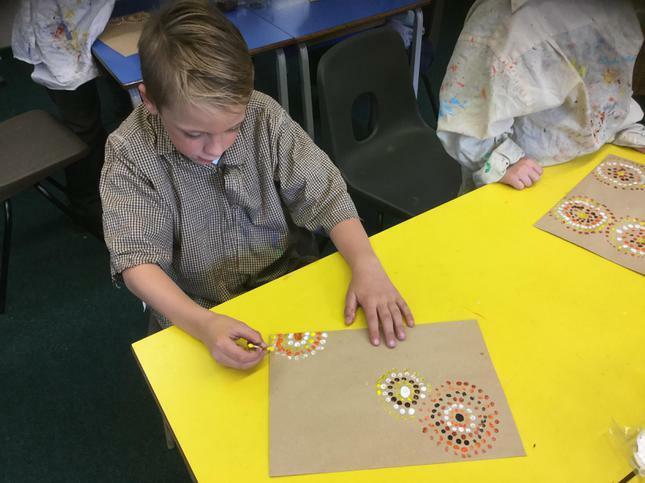 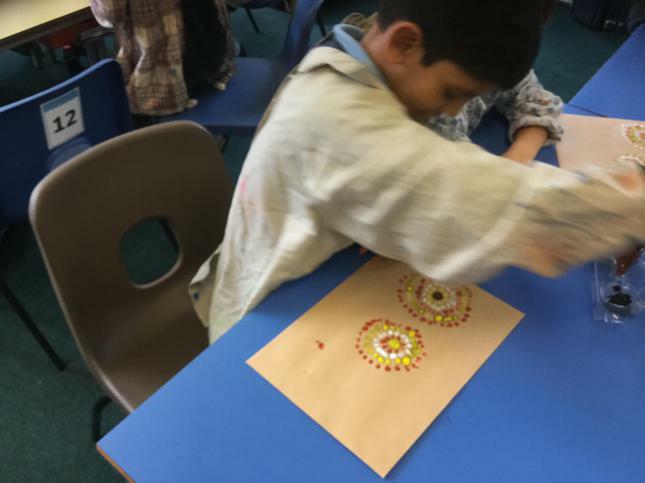 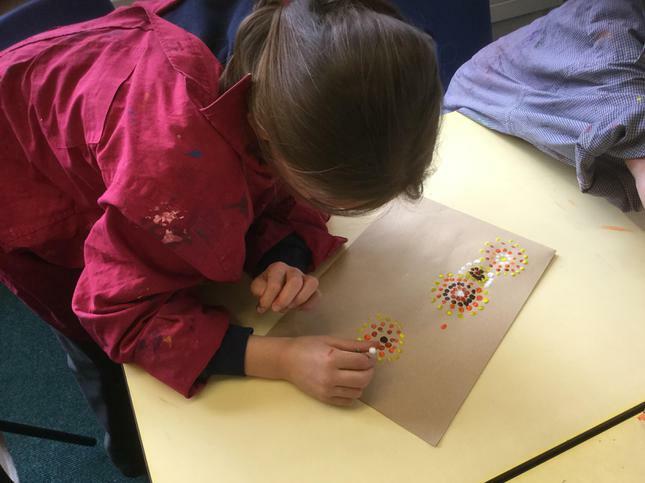 We created our own paintings inspired by Australian Aboriginal designs! 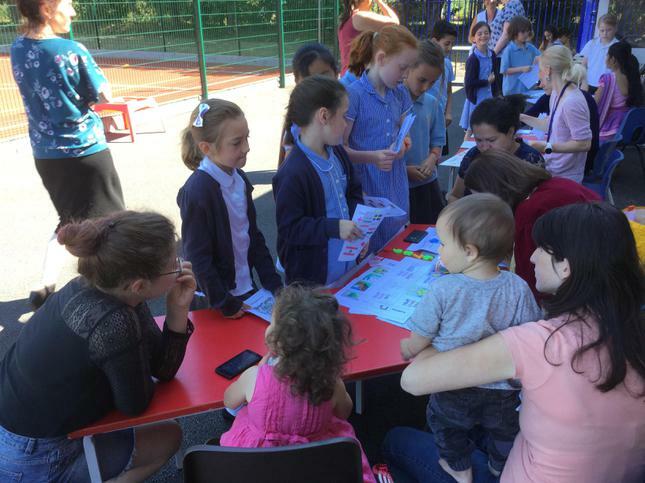 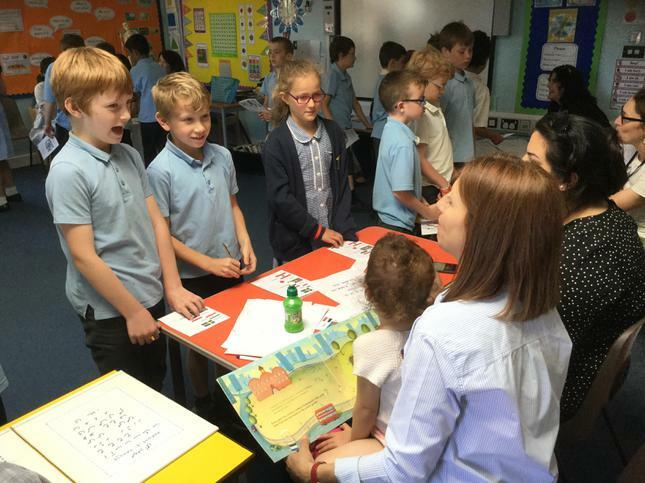 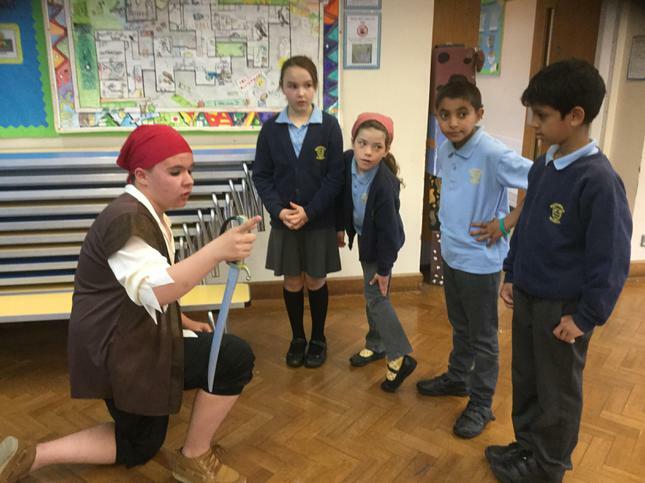 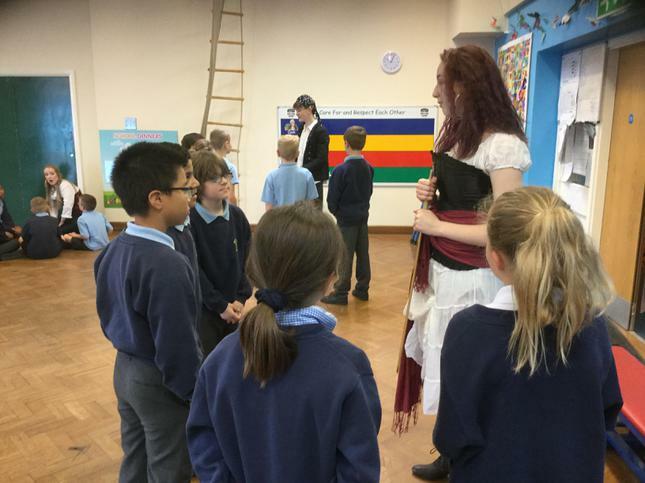 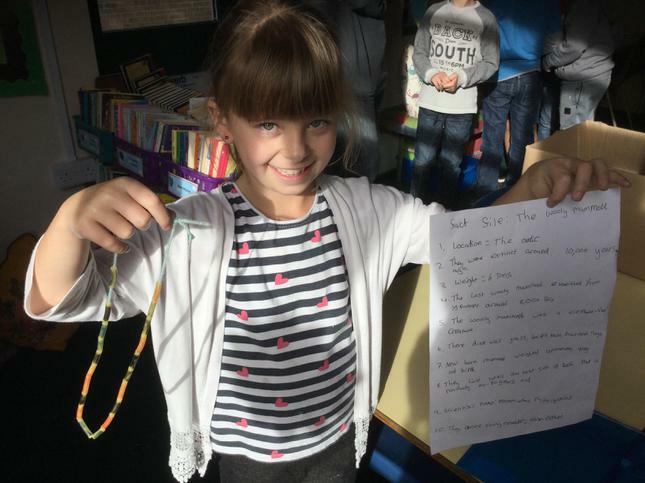 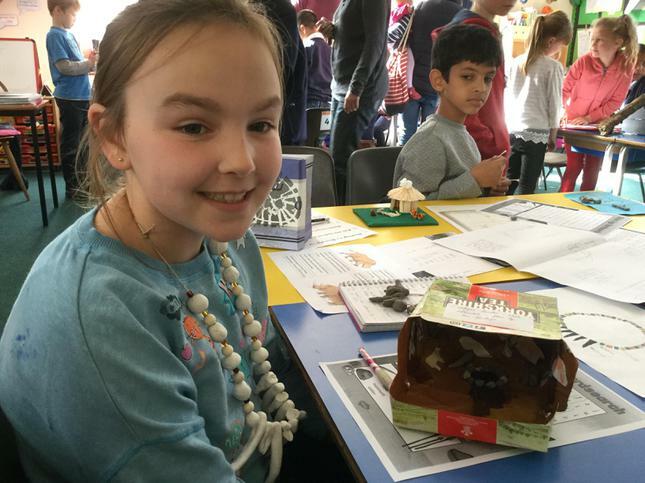 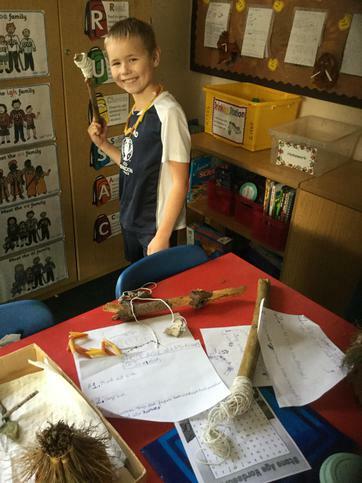 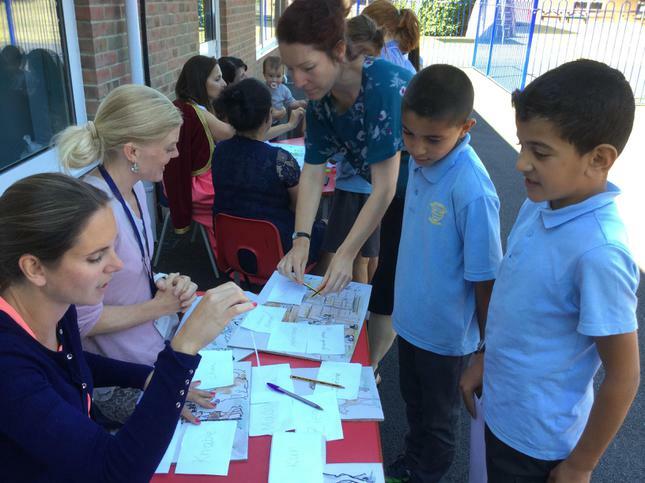 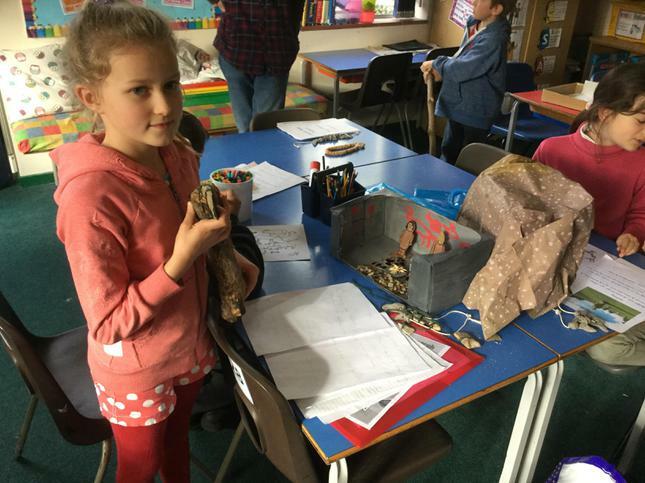 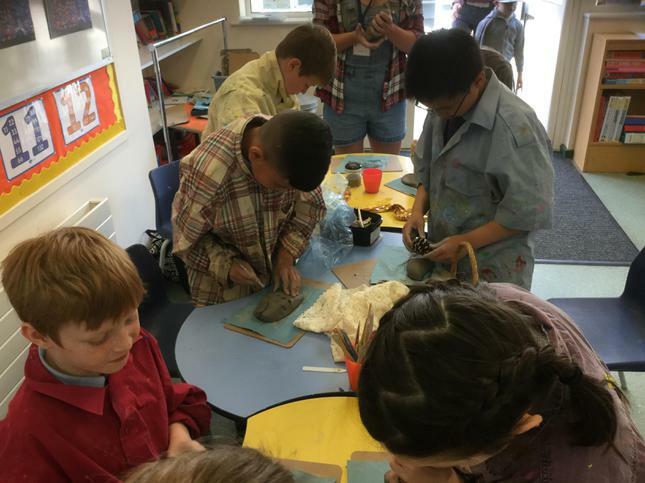 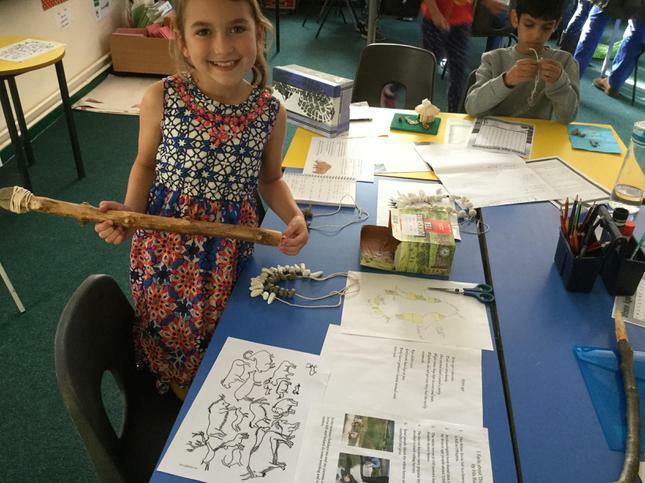 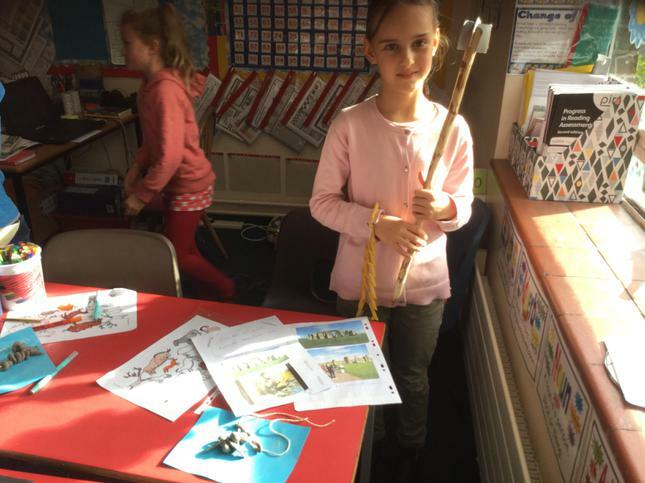 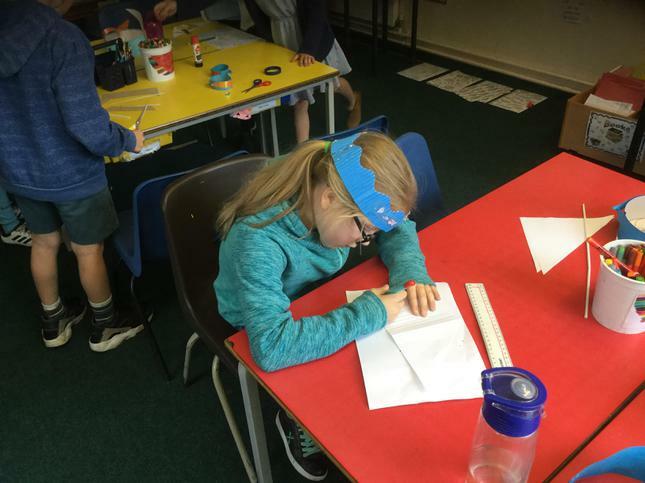 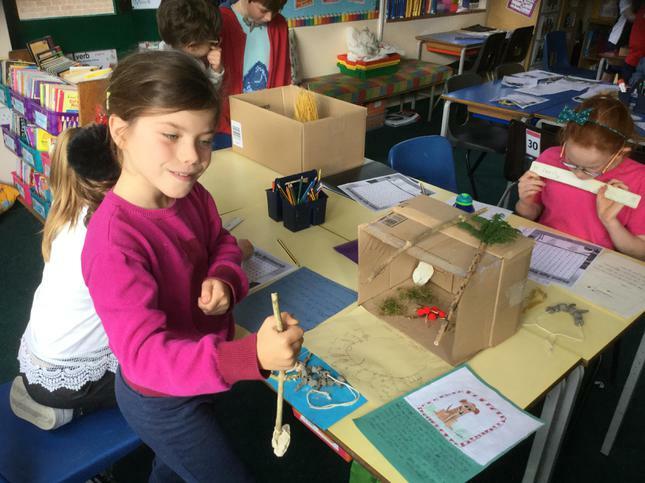 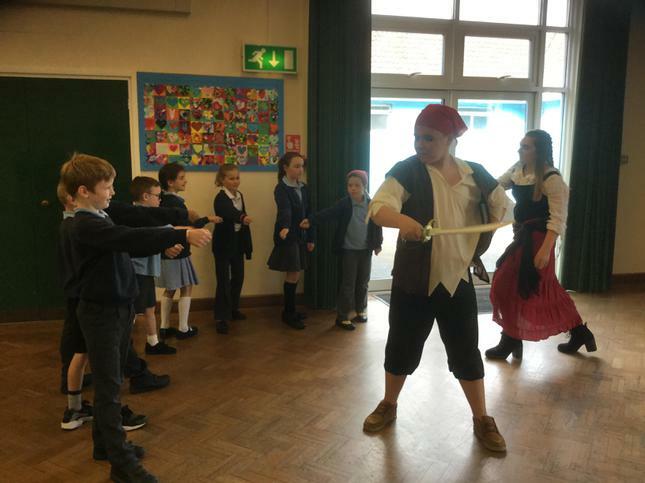 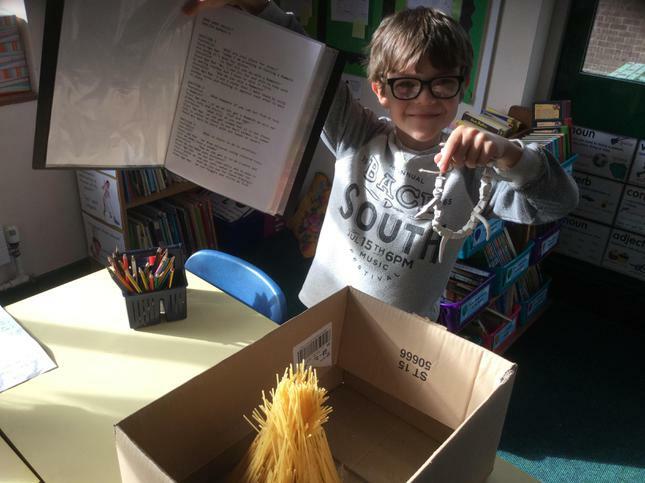 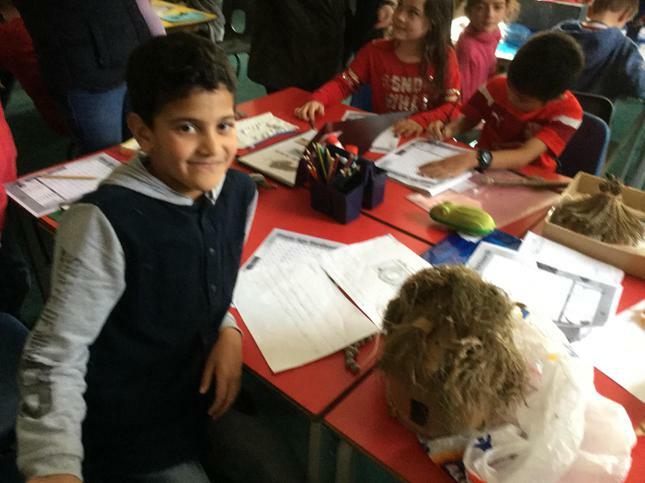 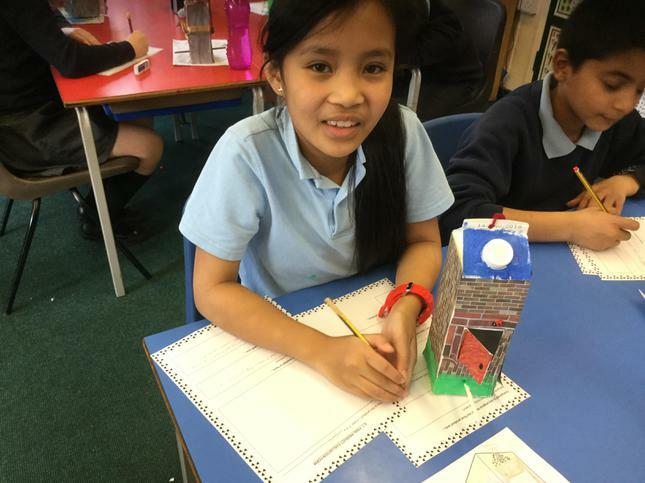 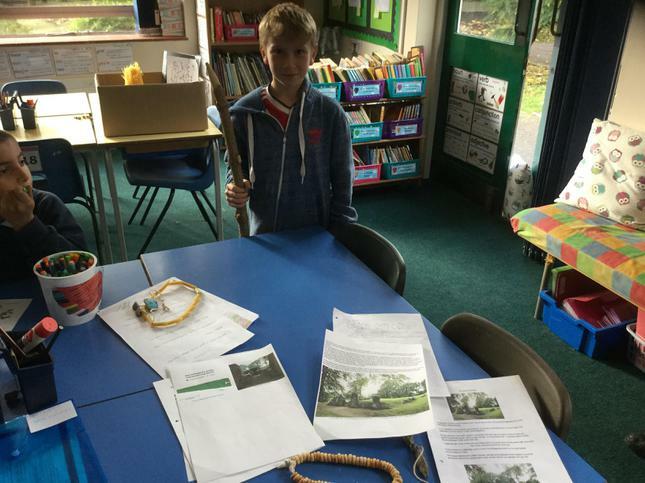 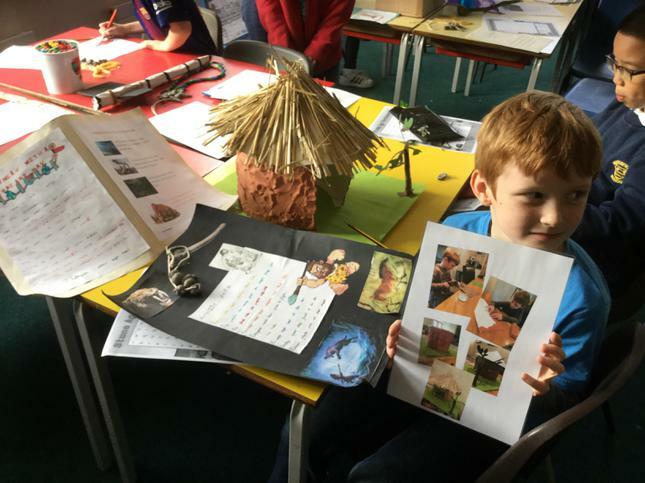 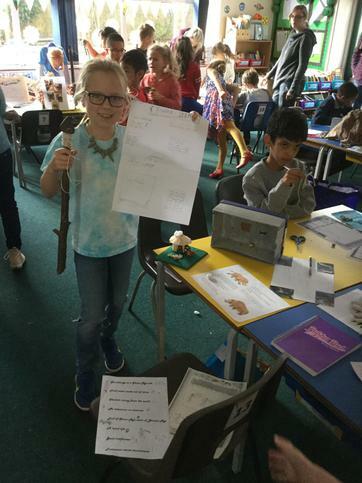 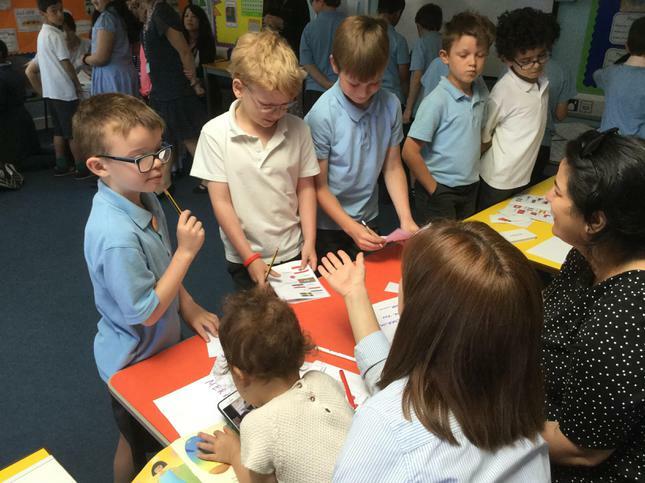 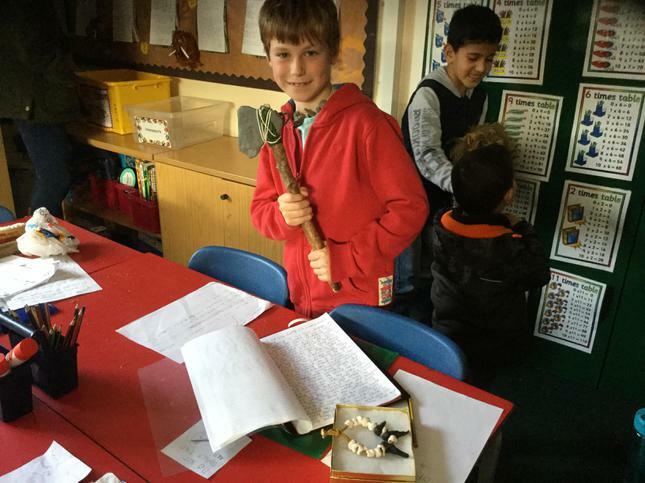 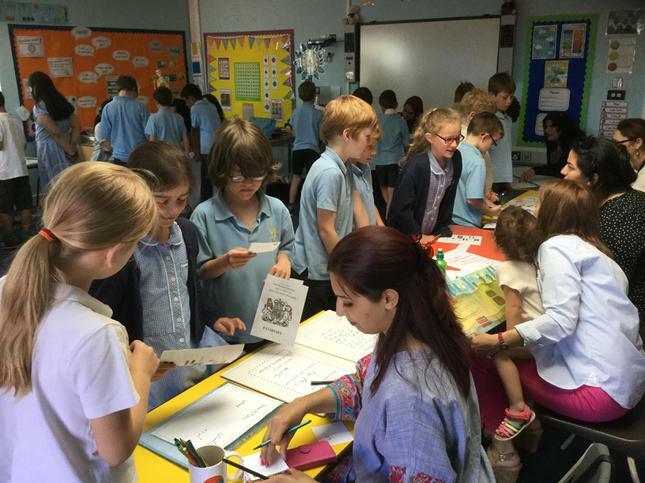 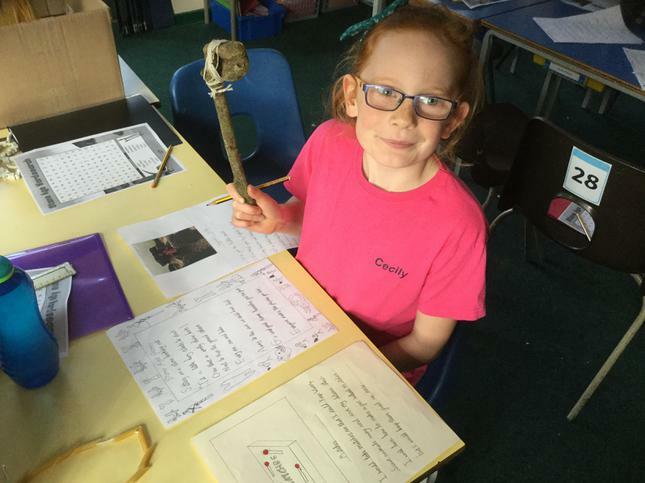 We were super impressed with all the fabulous homework celebrated during our 'Stone Age' open afternoon. 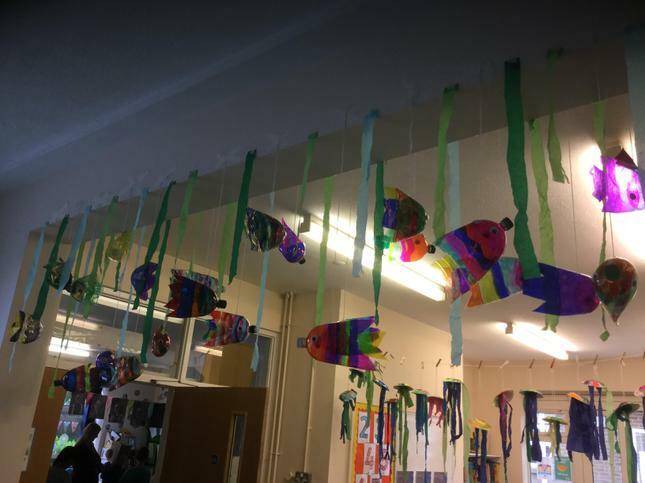 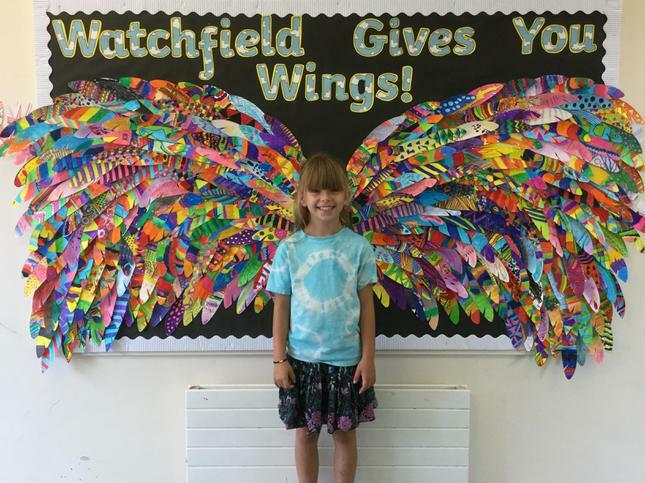 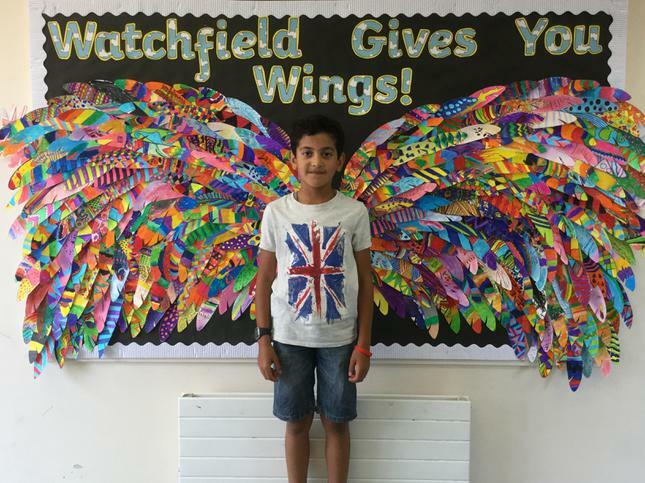 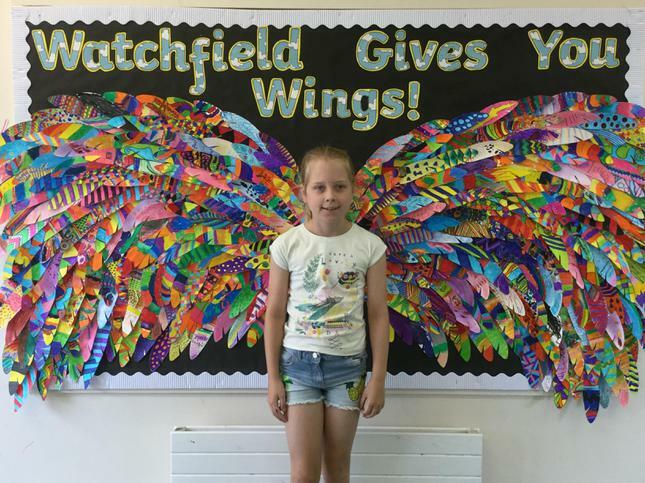 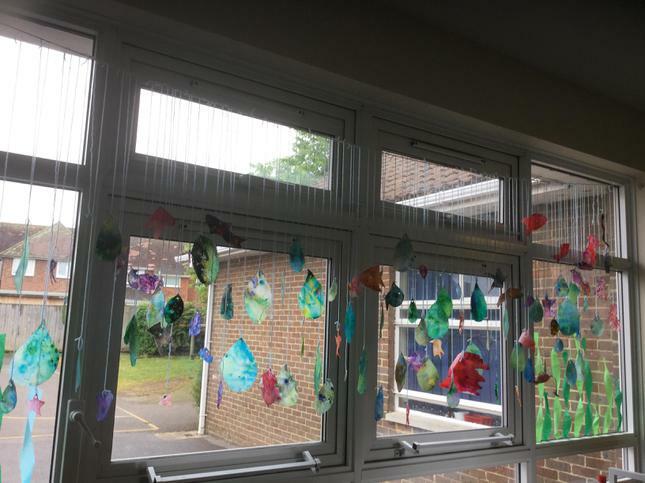 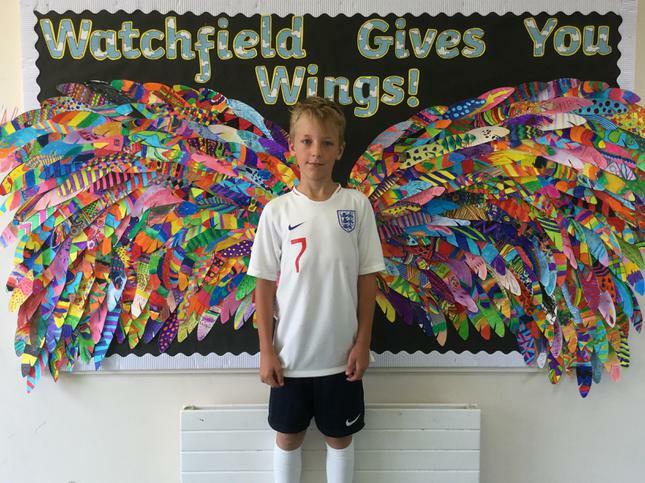 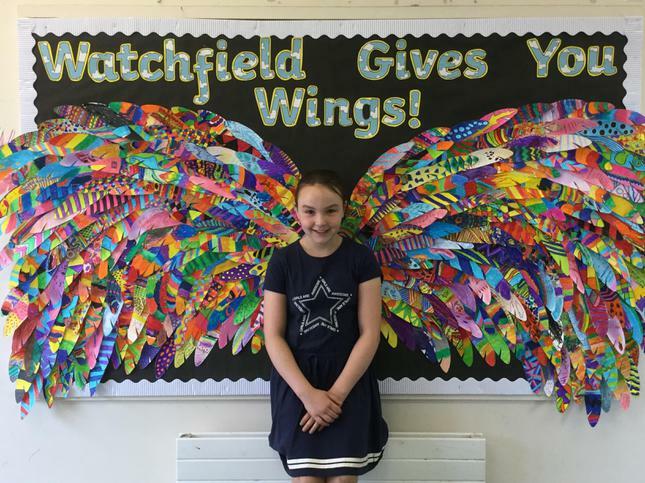 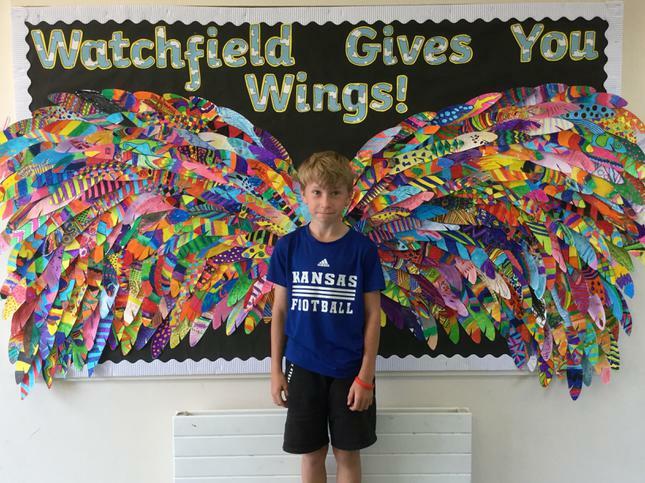 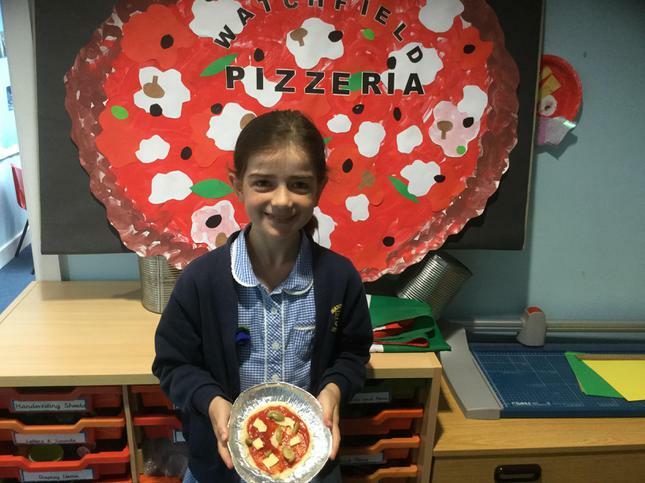 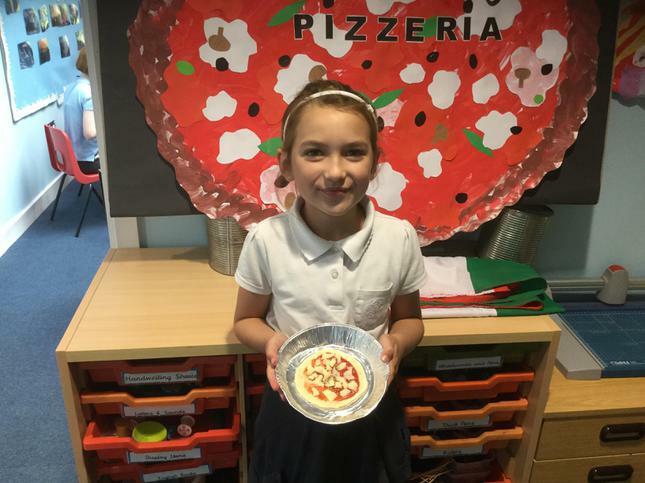 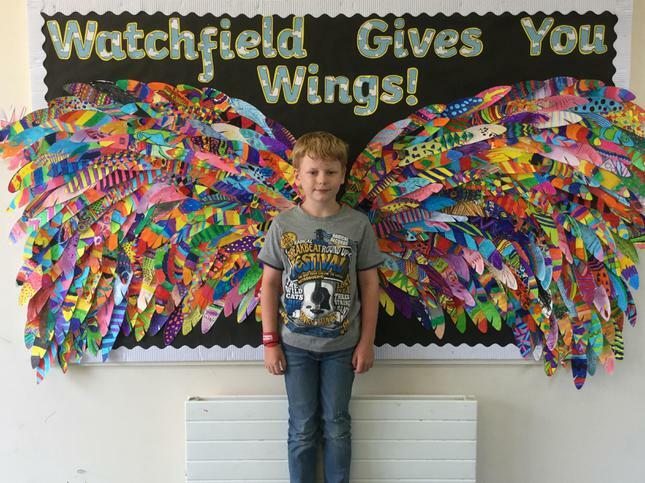 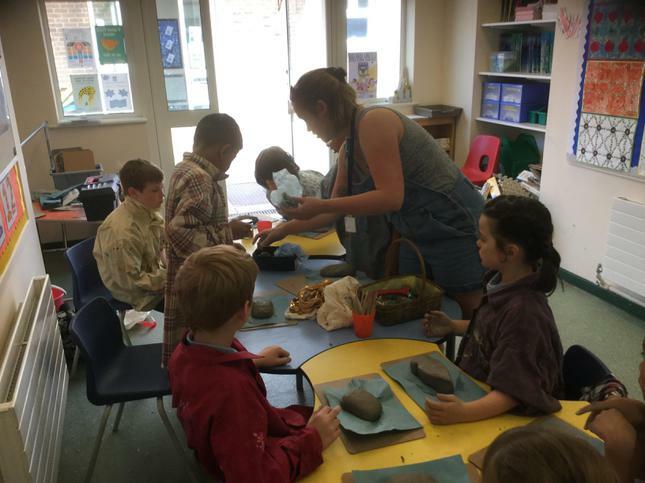 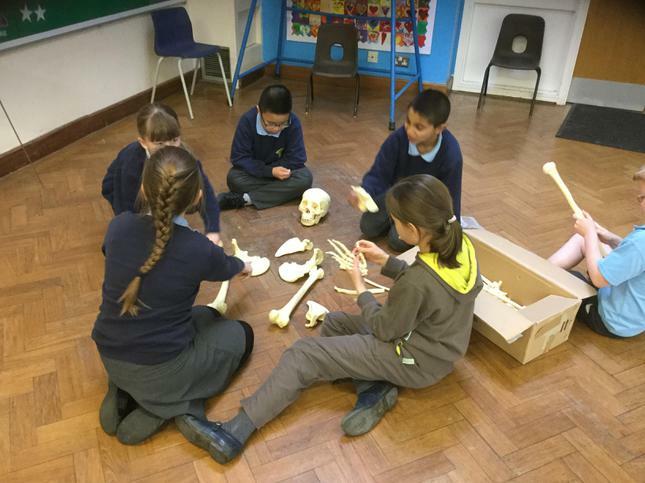 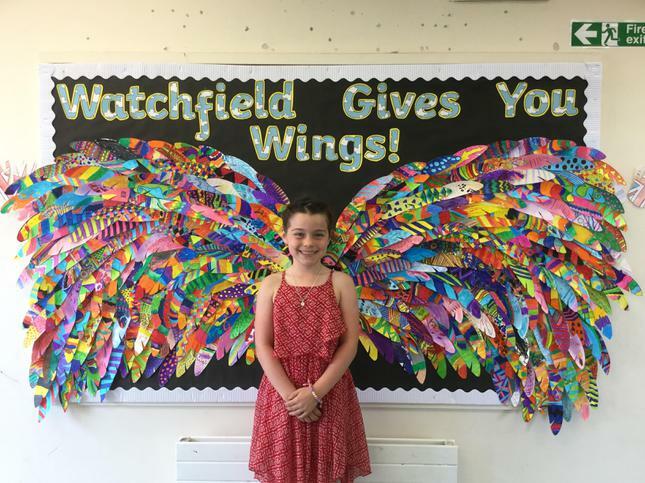 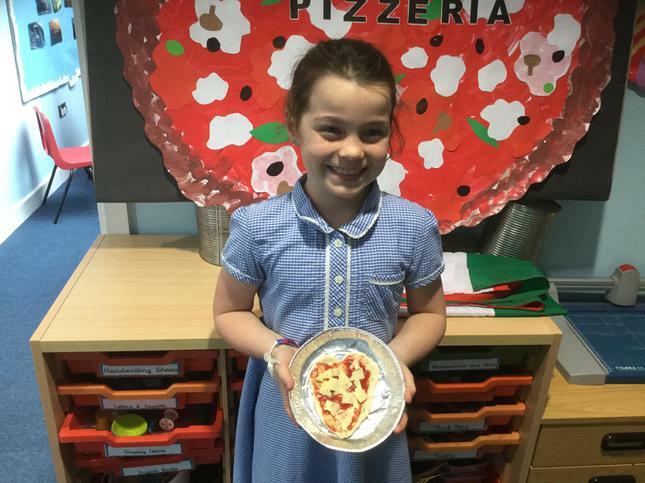 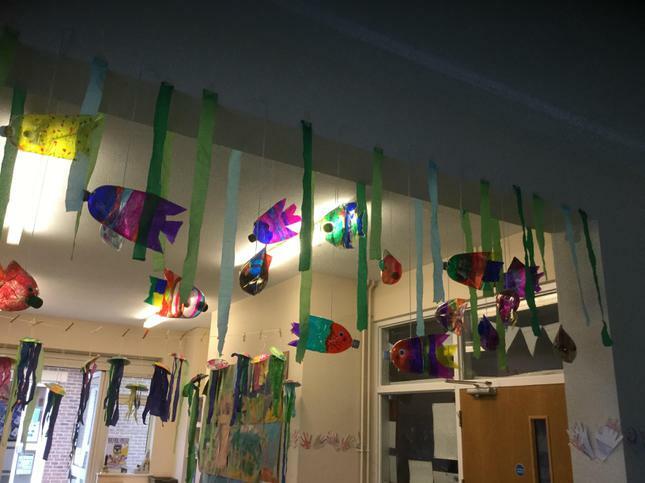 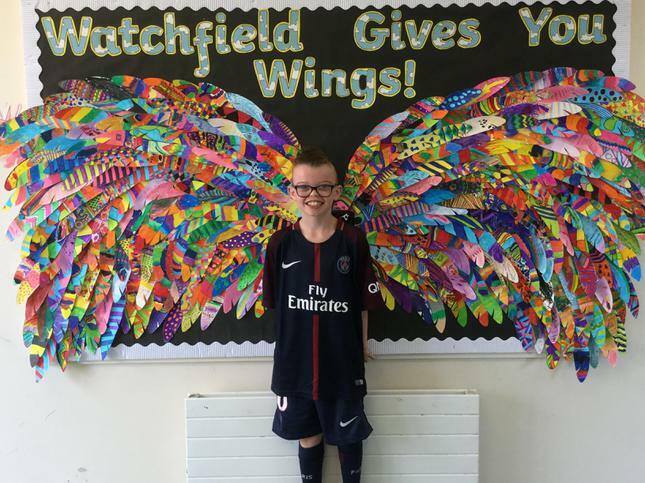 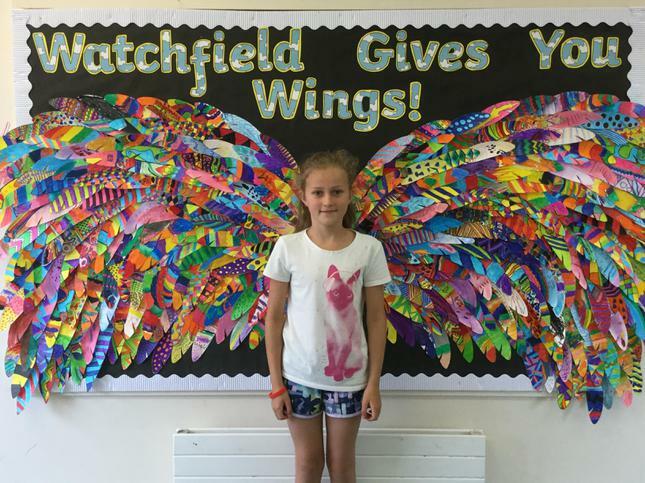 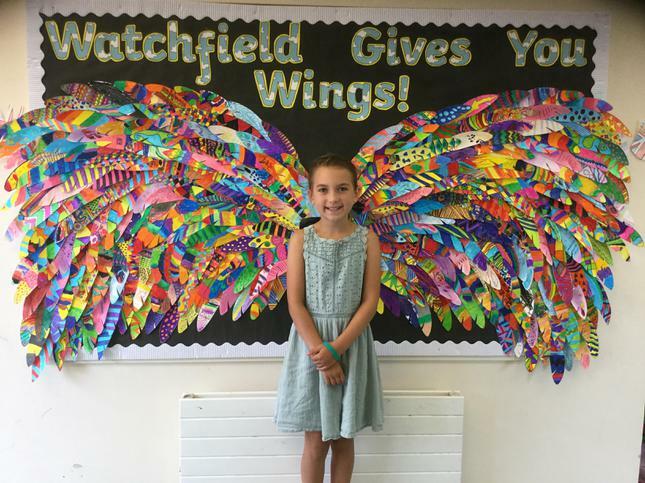 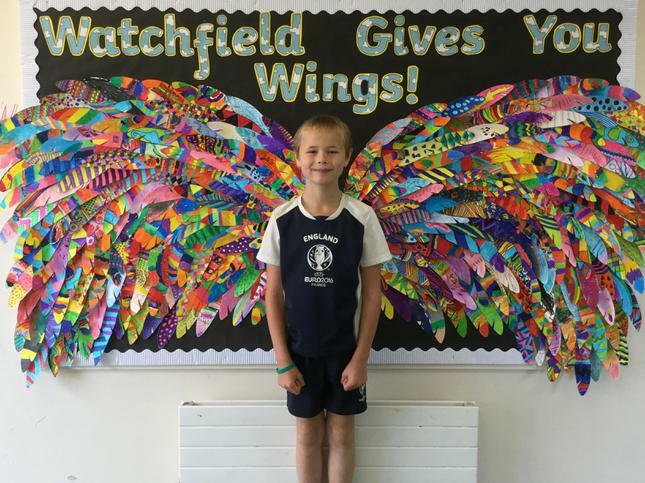 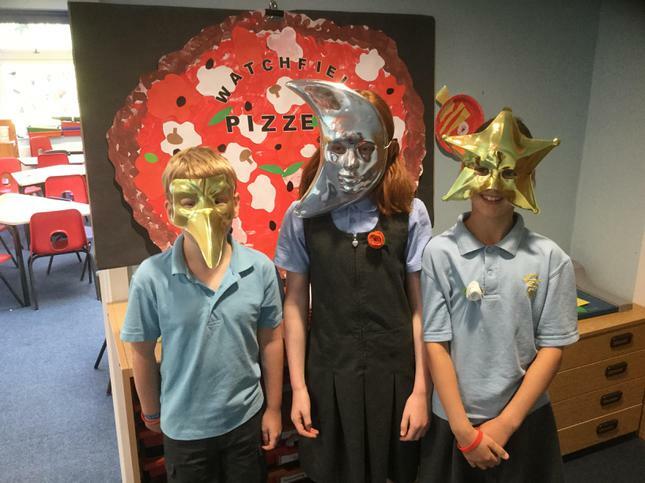 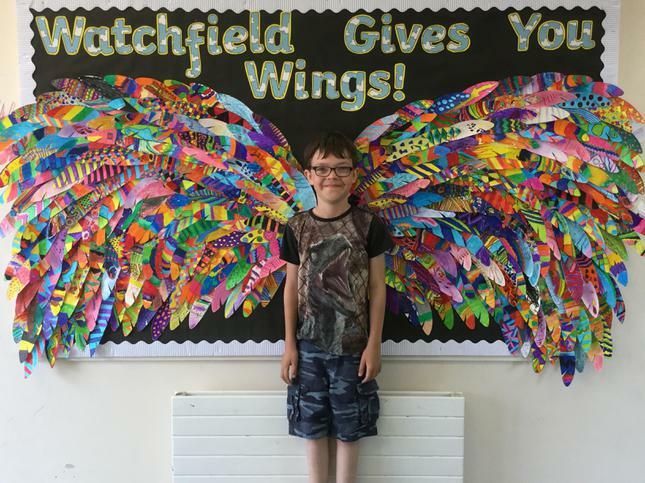 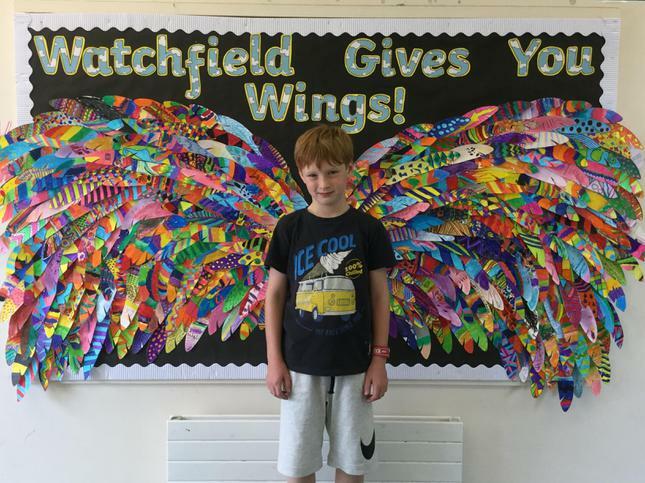 Well done Owls Class! 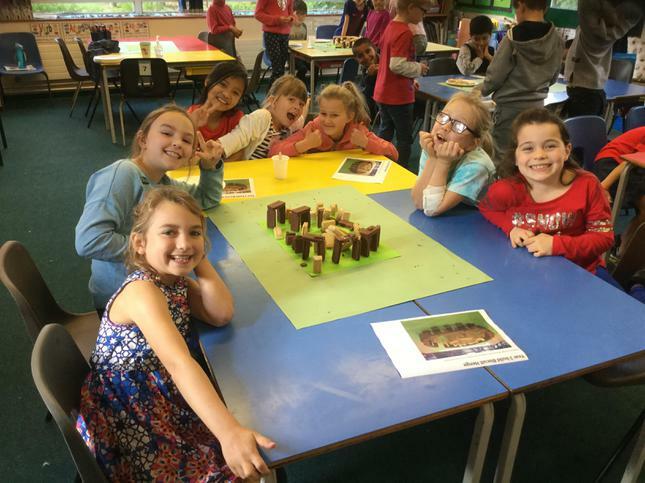 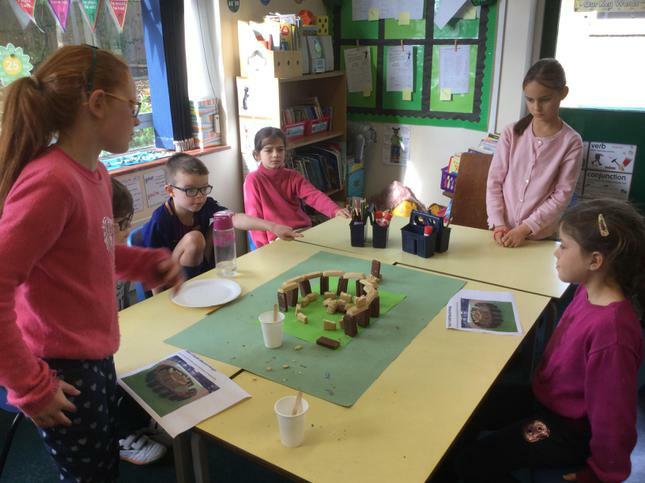 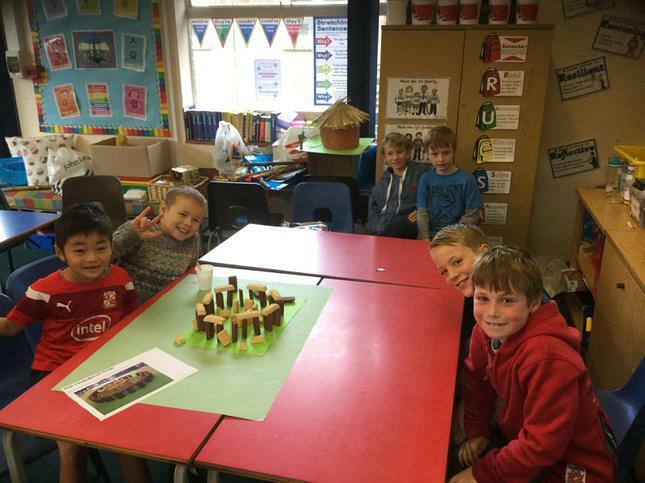 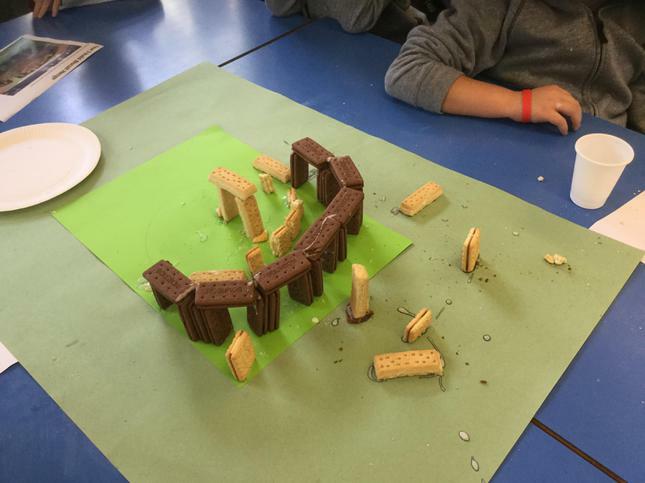 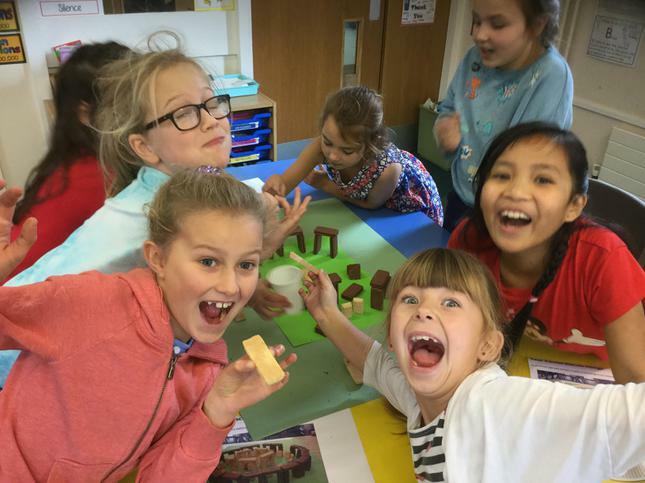 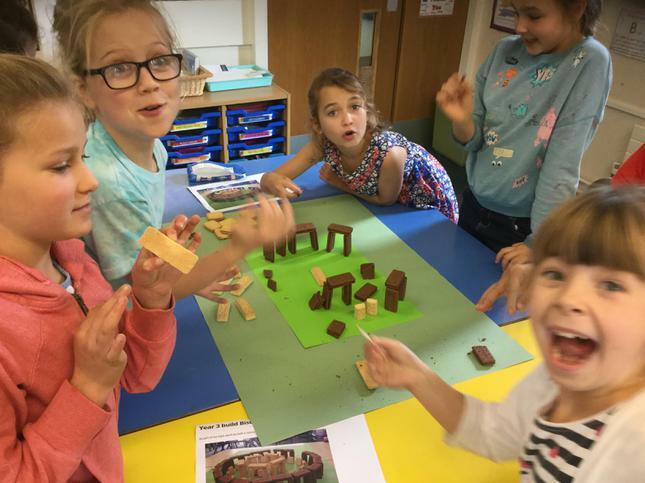 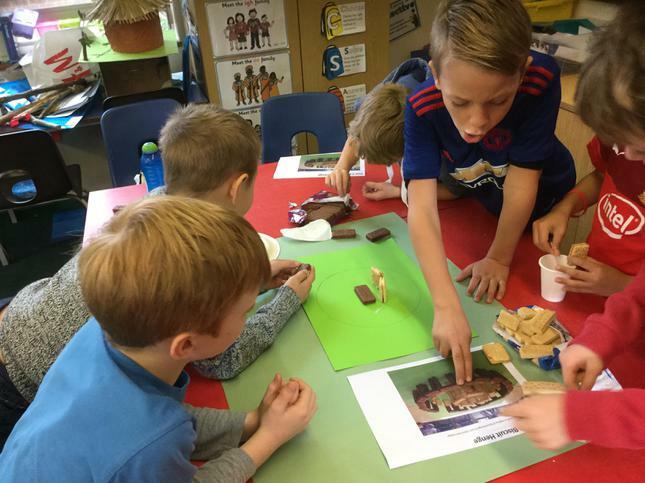 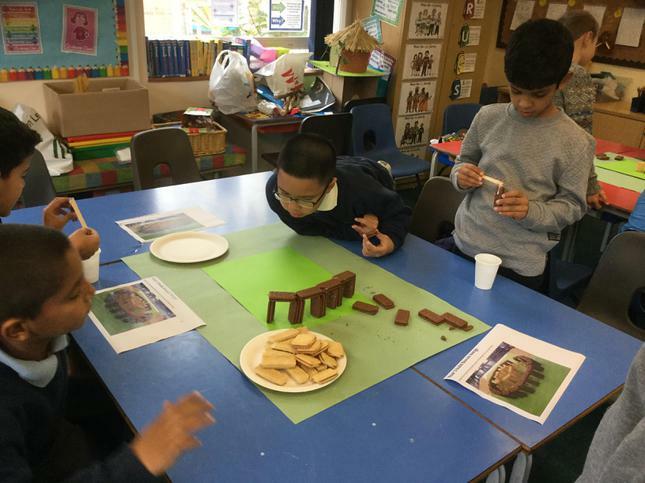 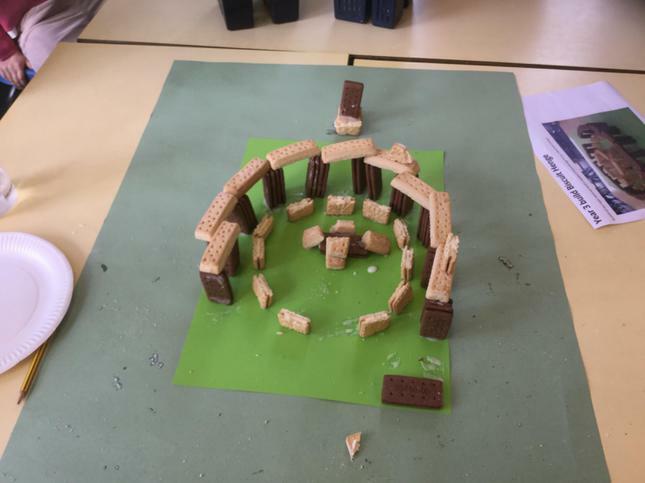 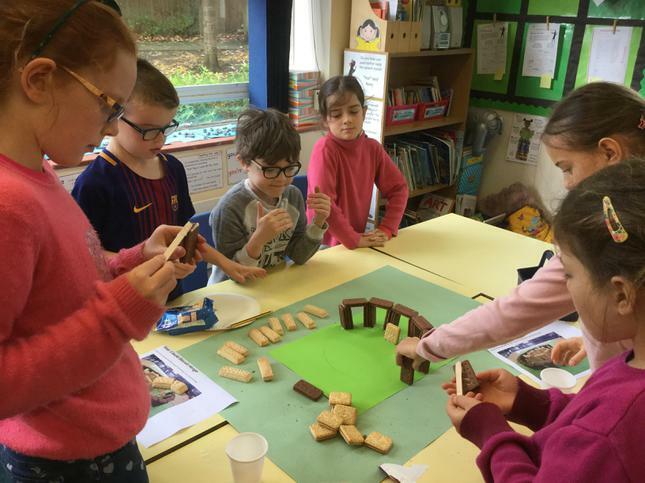 We learned about Stonehenge and worked in teams to make 'Biscuit-henge'! 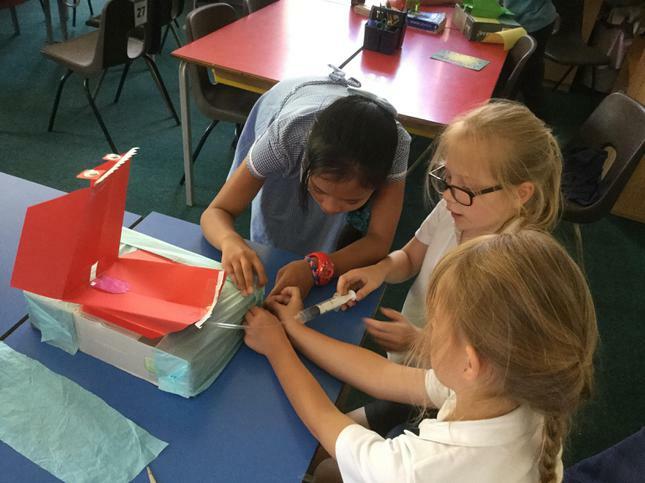 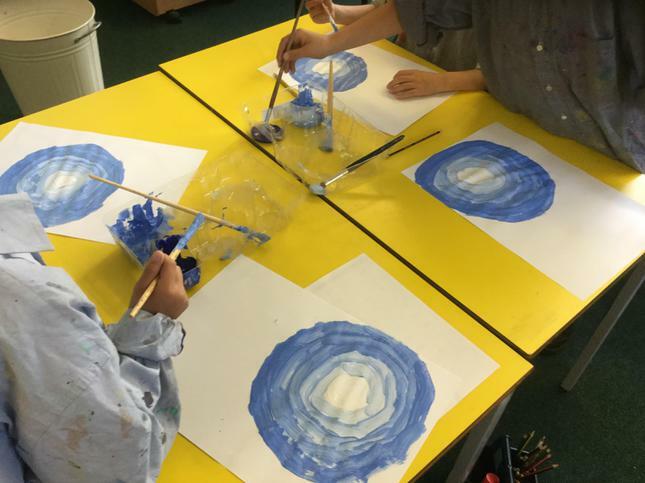 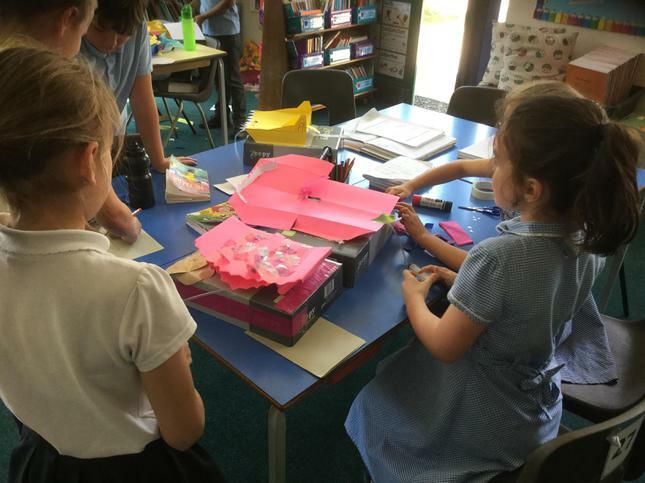 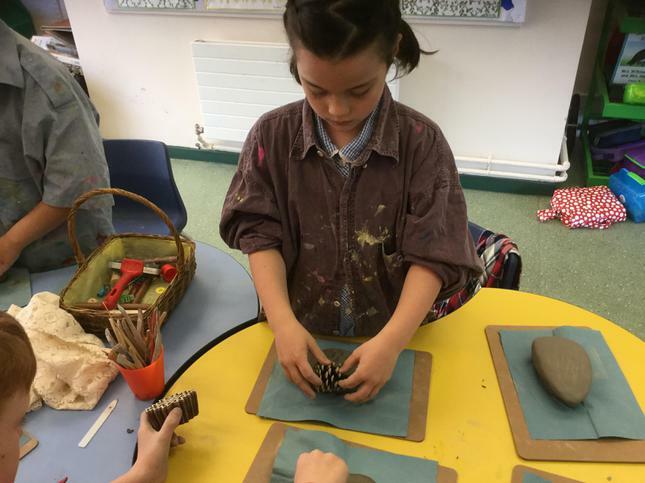 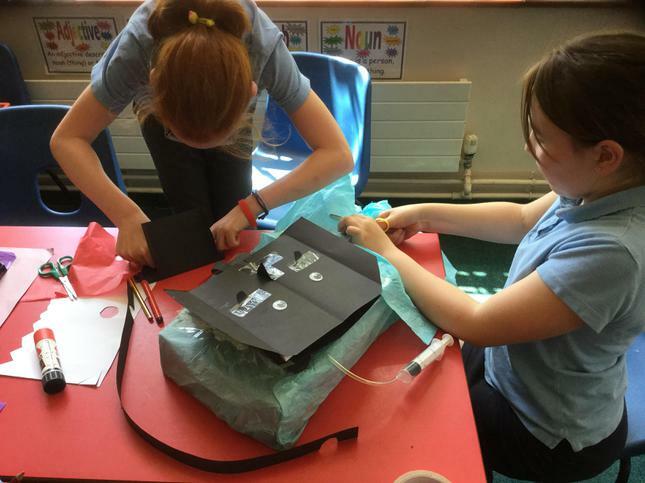 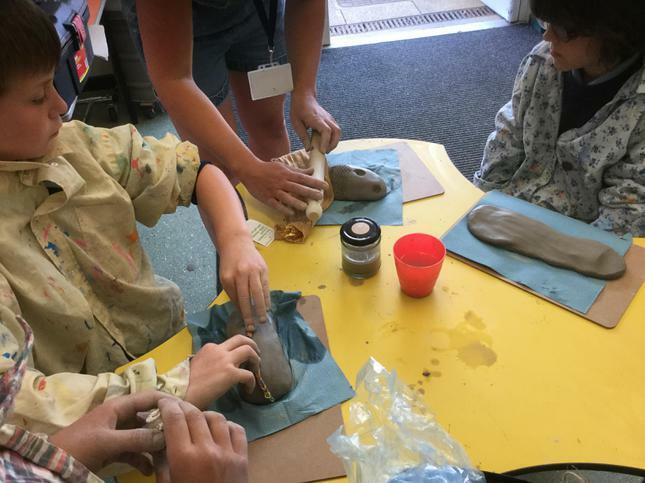 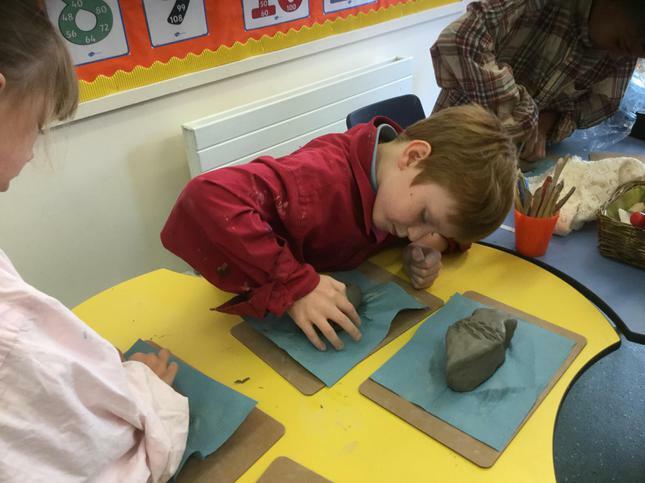 Team work in our Art lesson!